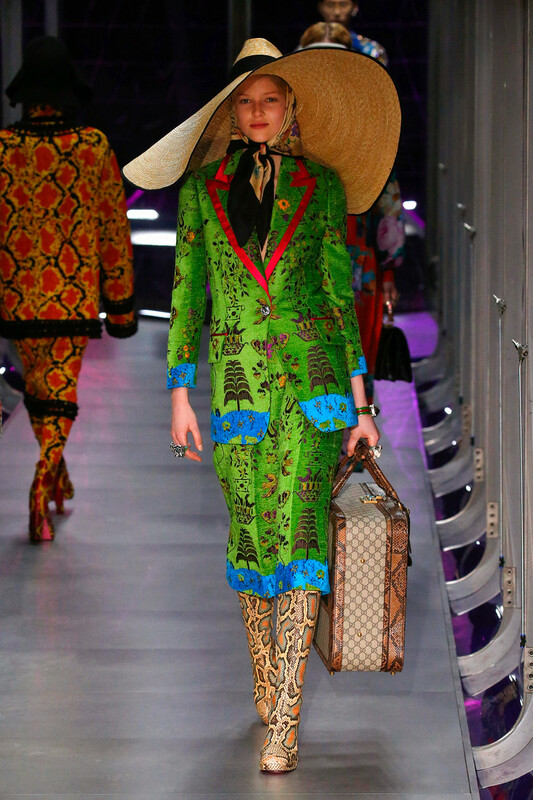 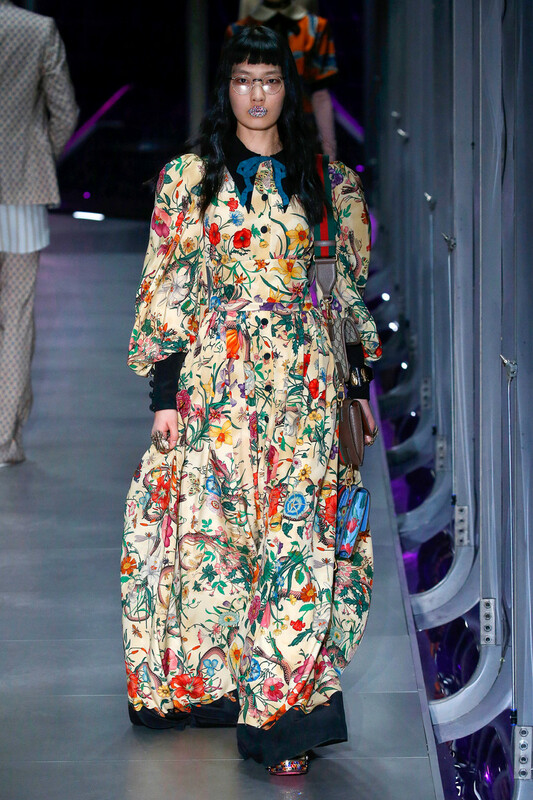 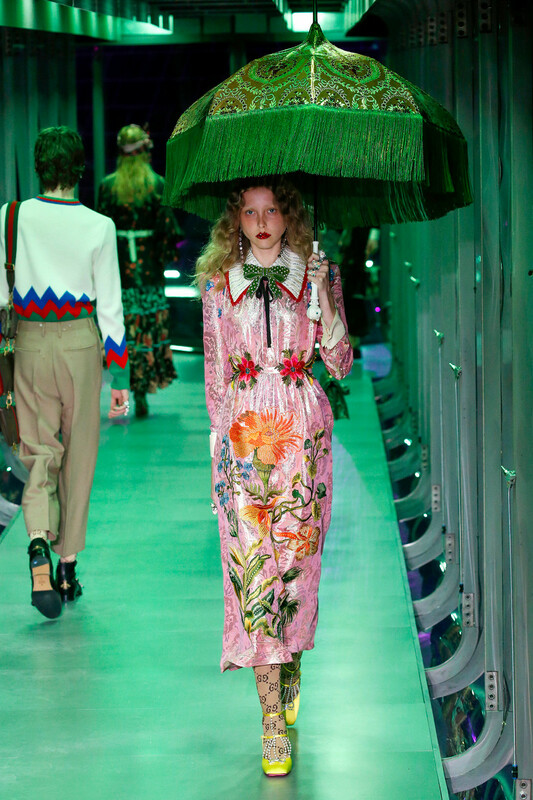 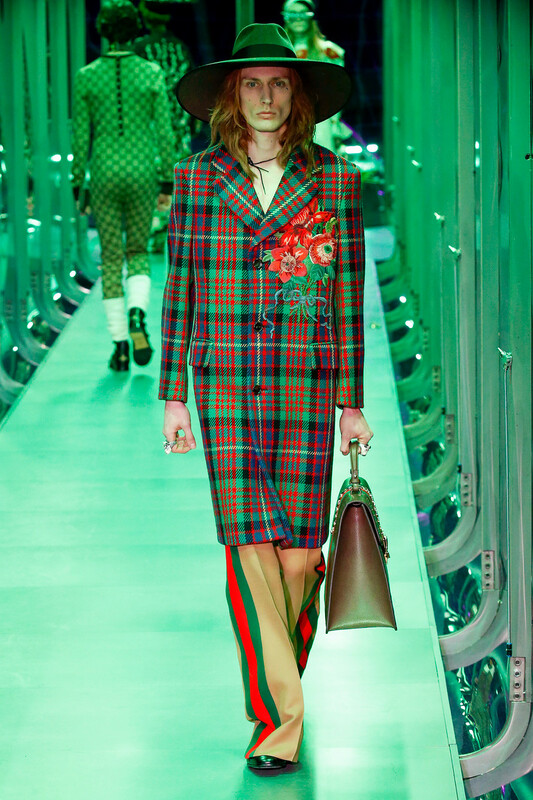 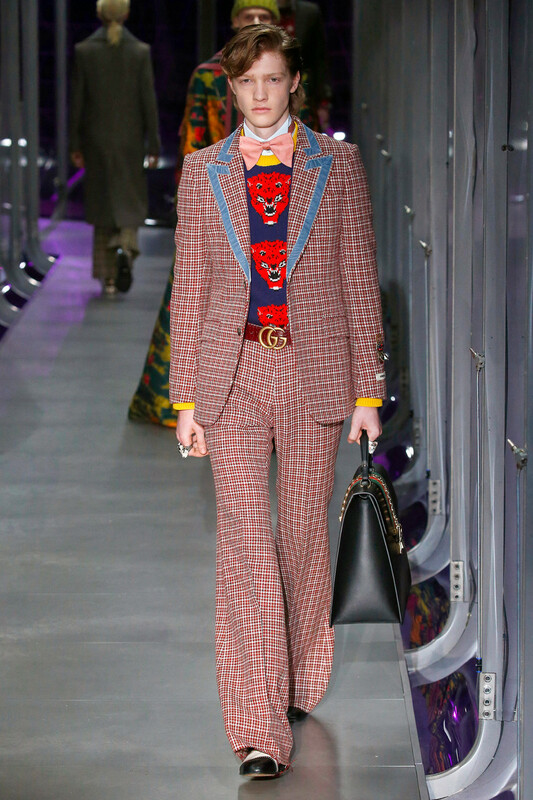 Just about anything Alessandro Michele has sent out on his Gucci runway has become a hit in the last few years. 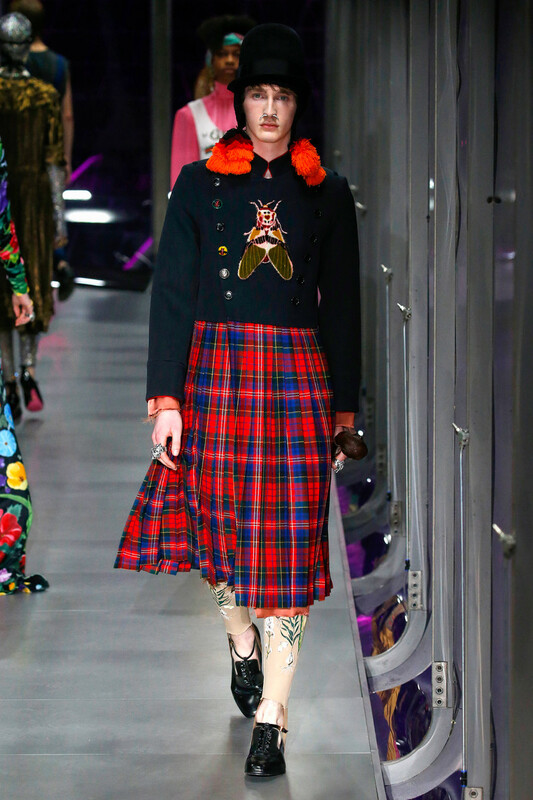 The loafers, the nerdy glasses, the pleated skirts, the bow tie blouses and the berets. 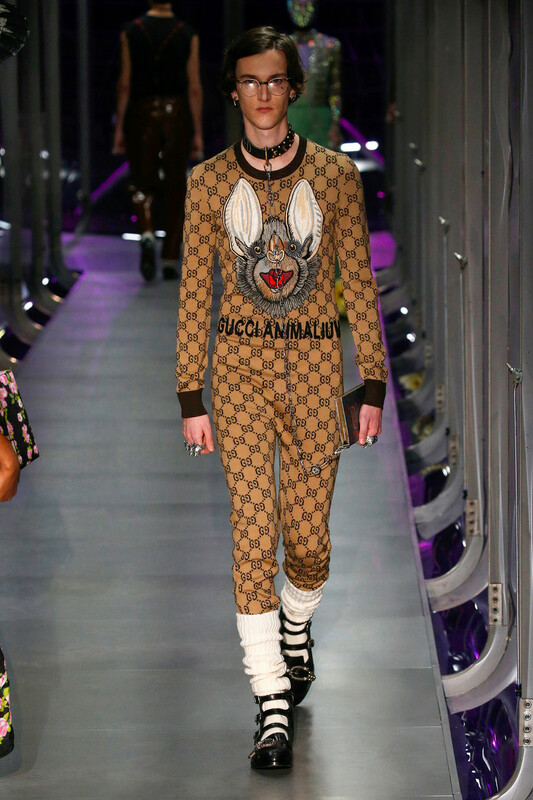 Next it-item introduced by the Gucci God is the costume dress. 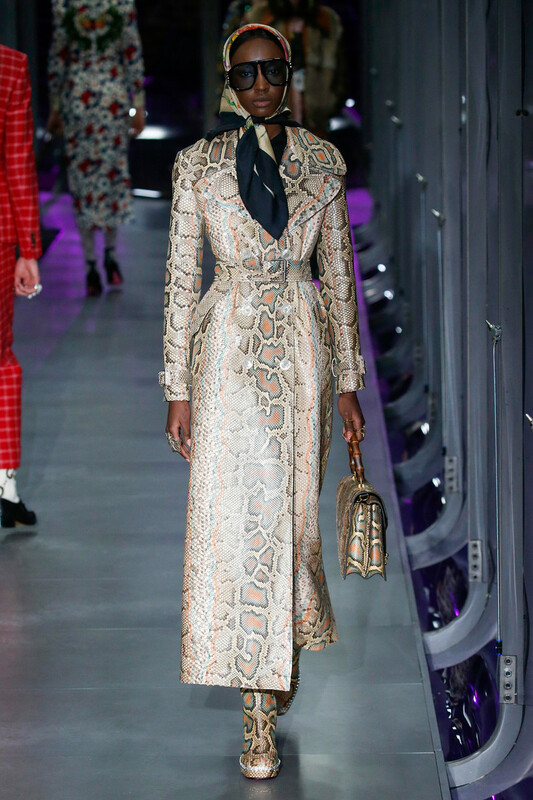 Of course many of the clothes from his latest show appeared to be coming straight off of a theater’s styling rack, but these dresses overruled everything. 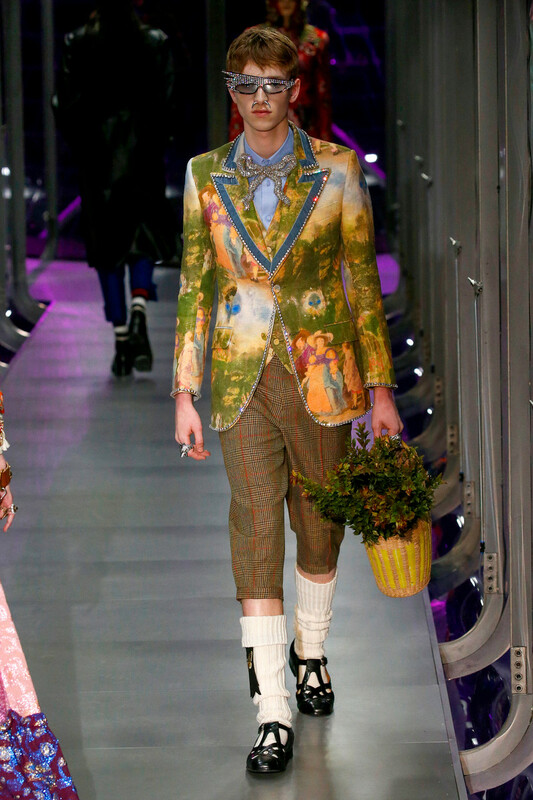 First time we took a good look at them they even seemed too dressed up, costume-y, perhaps a little ridiculous? 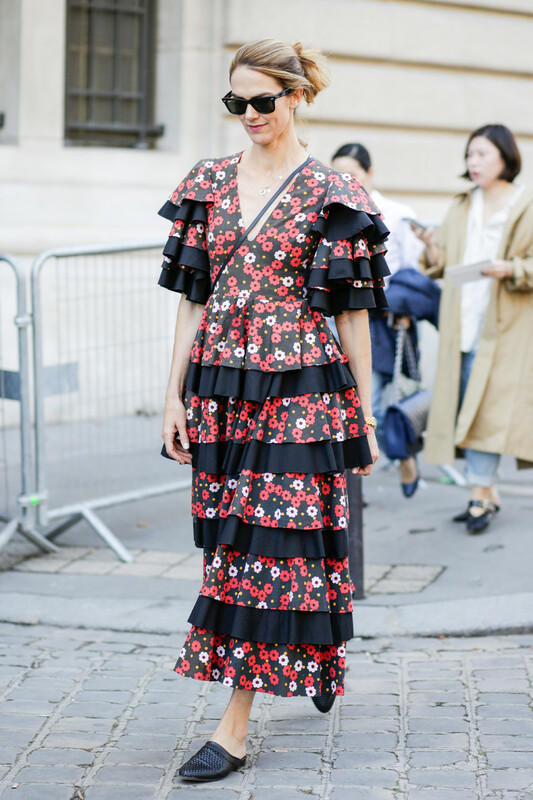 Yet, as it goes with fashion, give a fresh idea a month or six and we’re all head over heals with it. 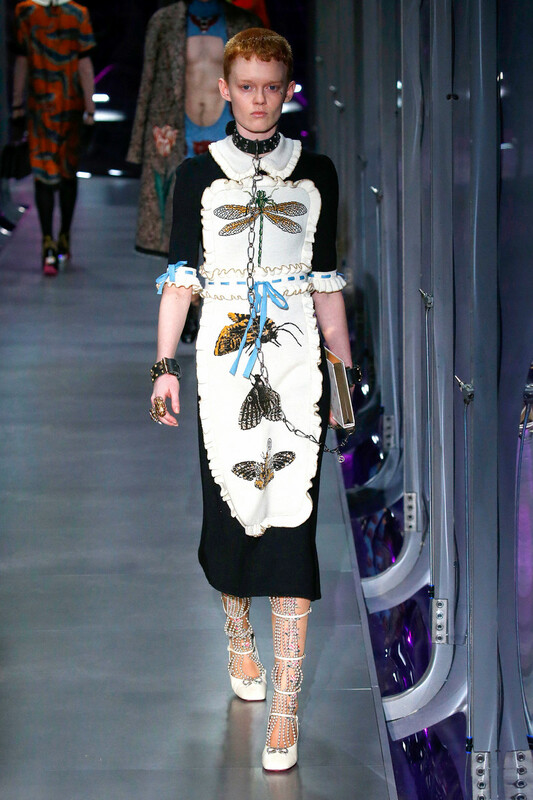 So it was only a matter of time before we were all craving these over the top dresses. 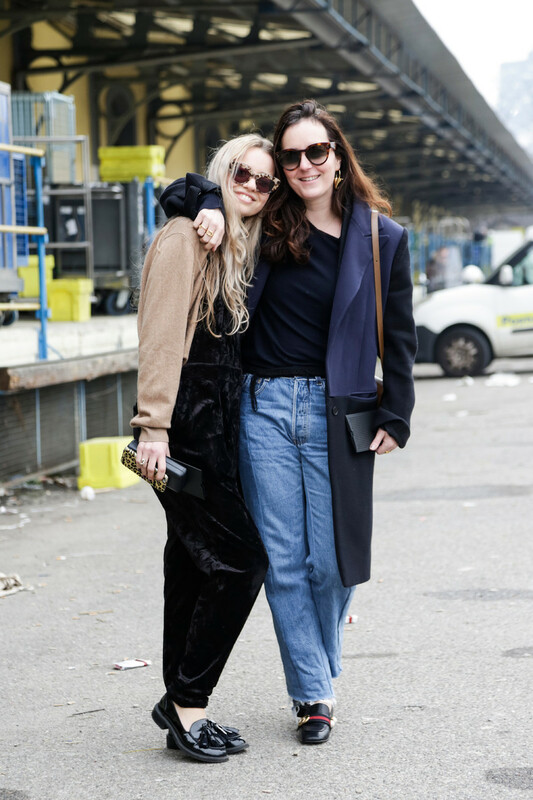 And now we don’t even know how we ever survived without them. 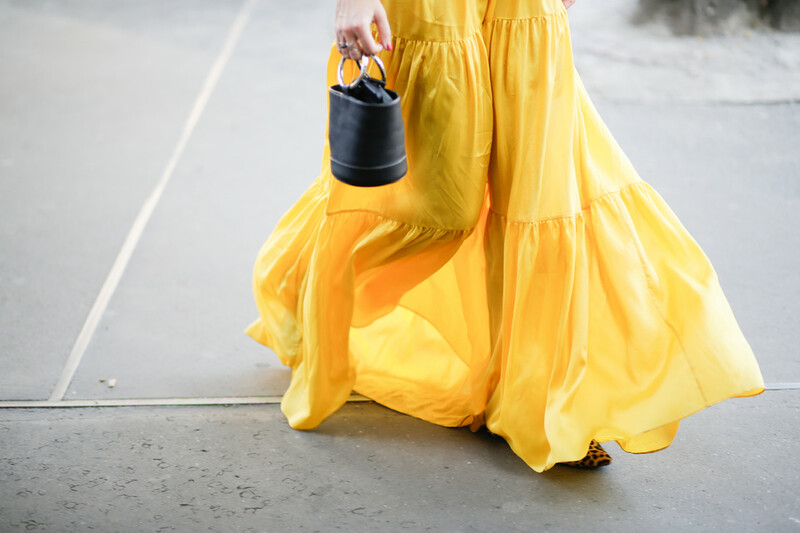 Clicking through our gallery above you must admit these highly comfortable dresses are the most effortless way of going all out. 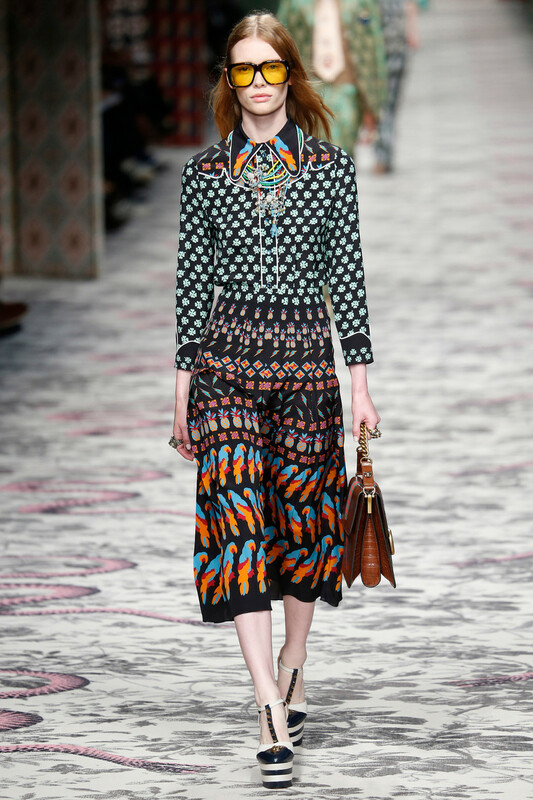 A showstopper look guaranteed and you can still eat, drink, walk and do a little fashion dance. 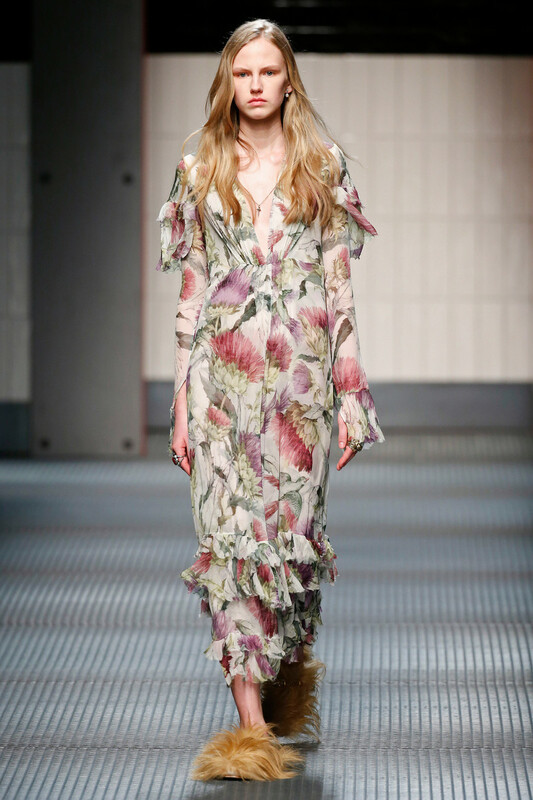 So there you go, a maxi ruffled dress up on your wishlist. 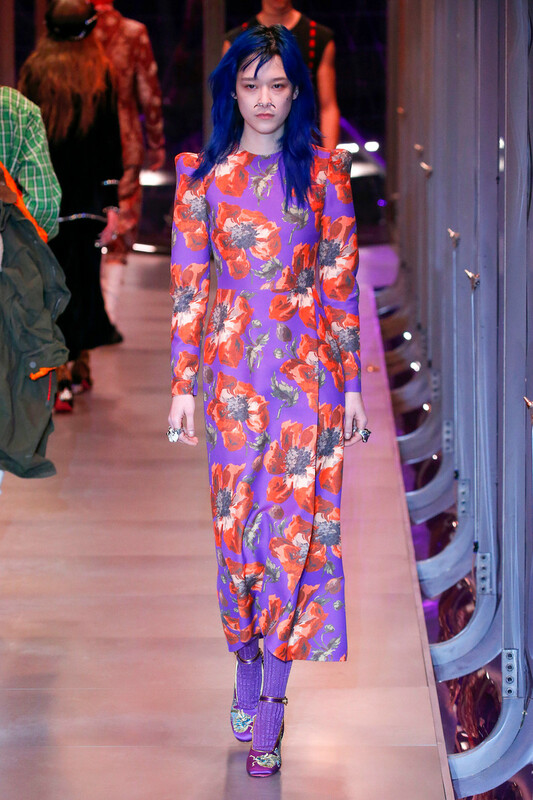 And don’t be shy. 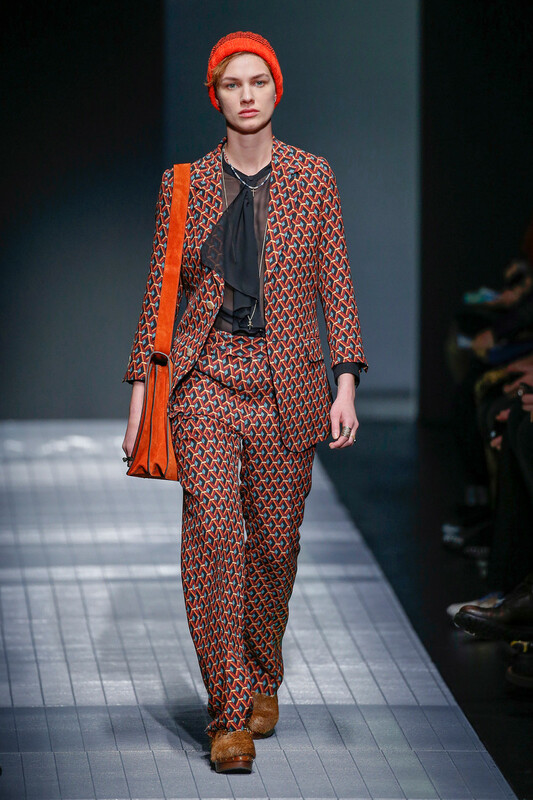 Opt for color, print and a little extra sum sum while you’re at it. 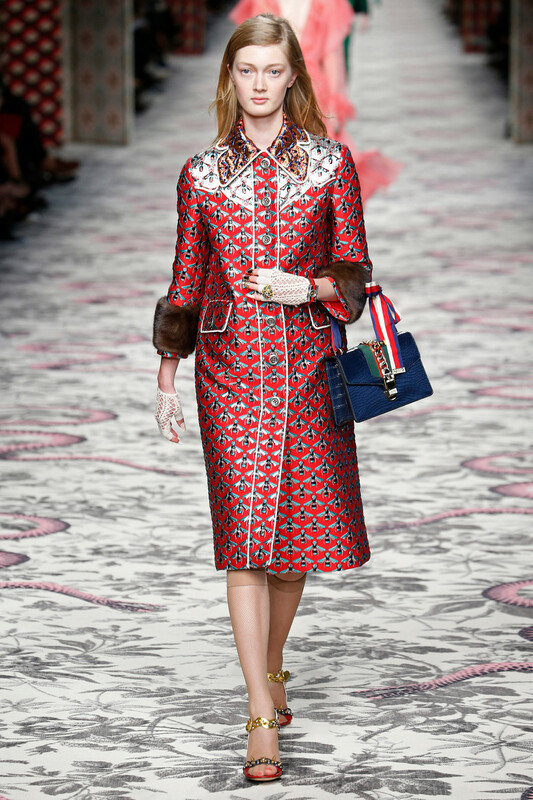 More is more in Michele’s world. 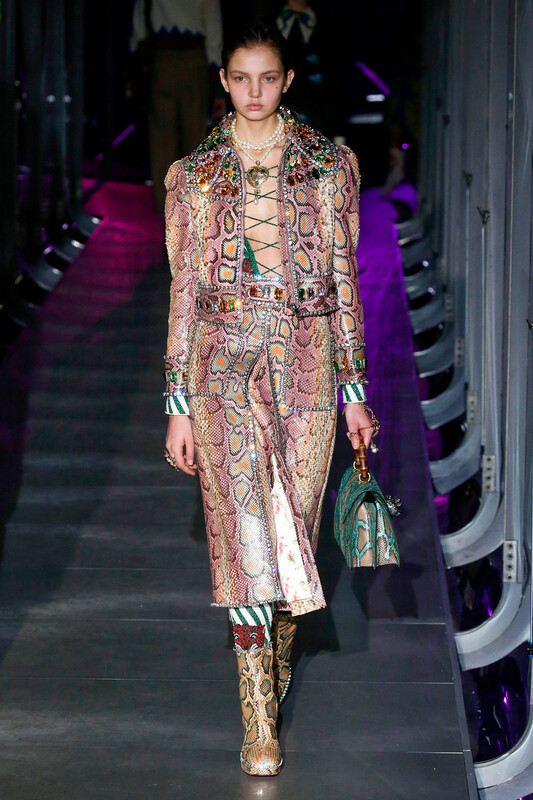 We left the Gucci show venue a bit overwhelmed. 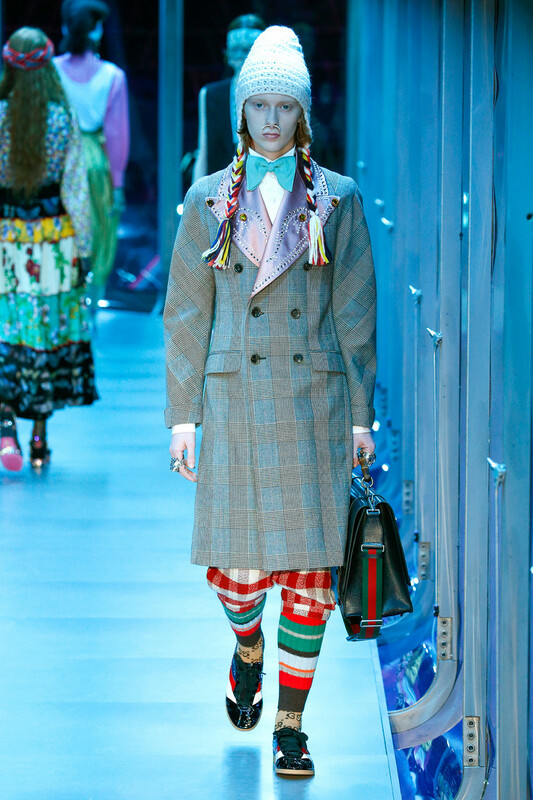 That was a lot to take in. 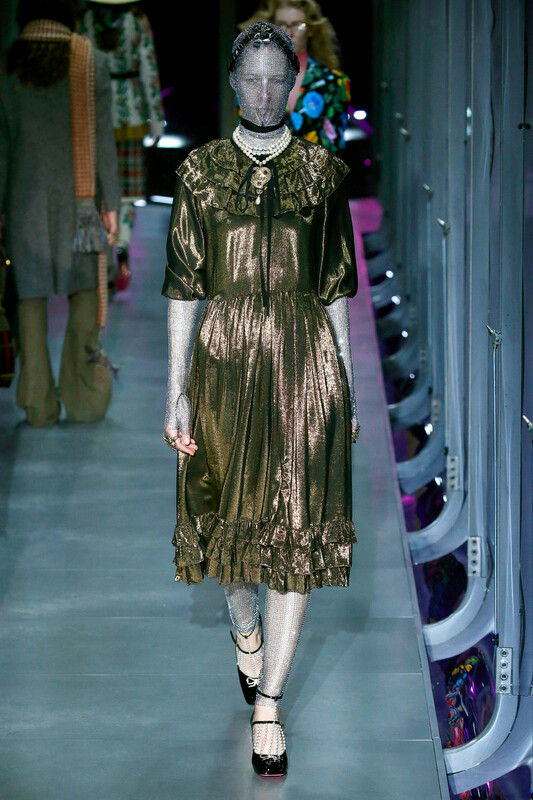 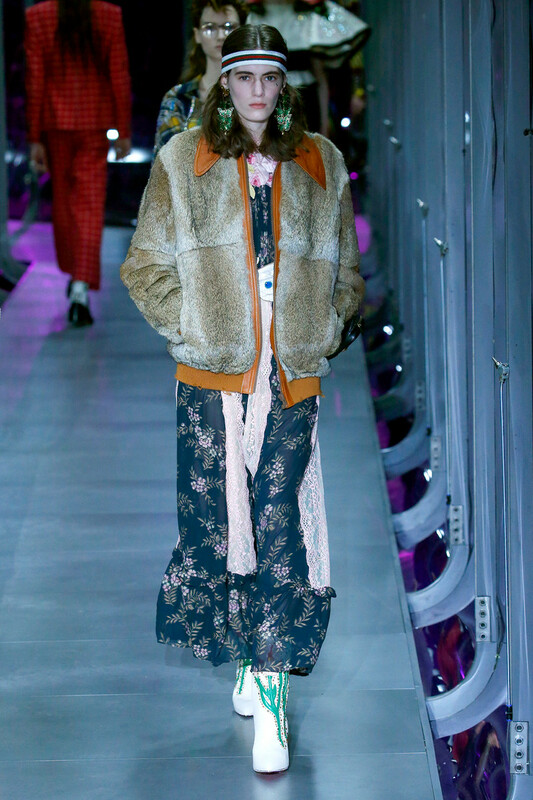 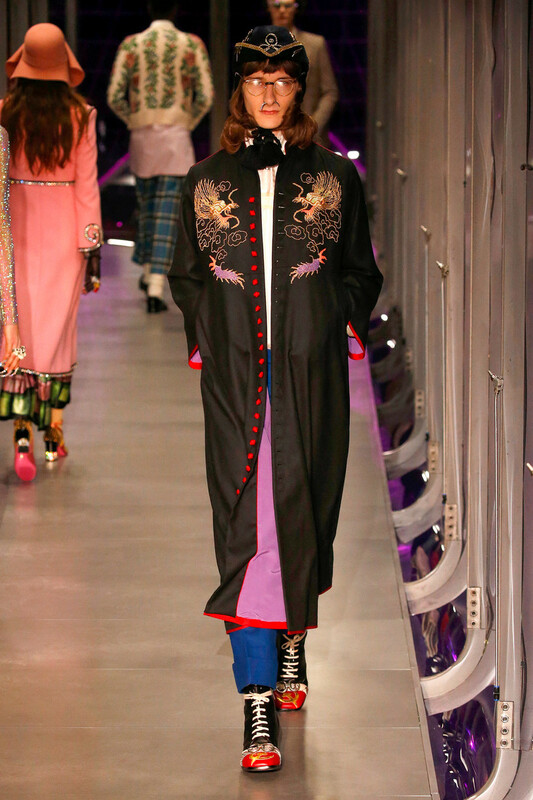 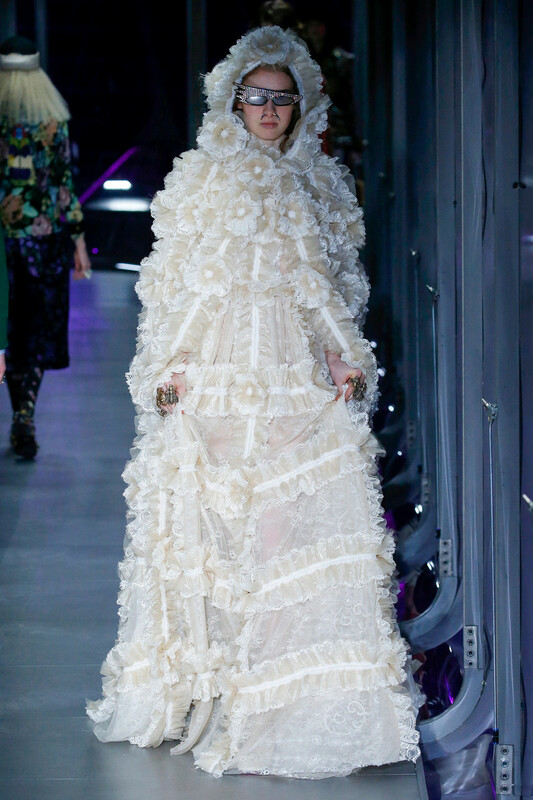 From the setting (the carpeted catwalk with trademark Gucci stripe to the barely lit, smoke filled mirrored room and Florence Welch reading the poems of William Blake on the soundtrack) to the clothing; Alessandro Michele let it all out. 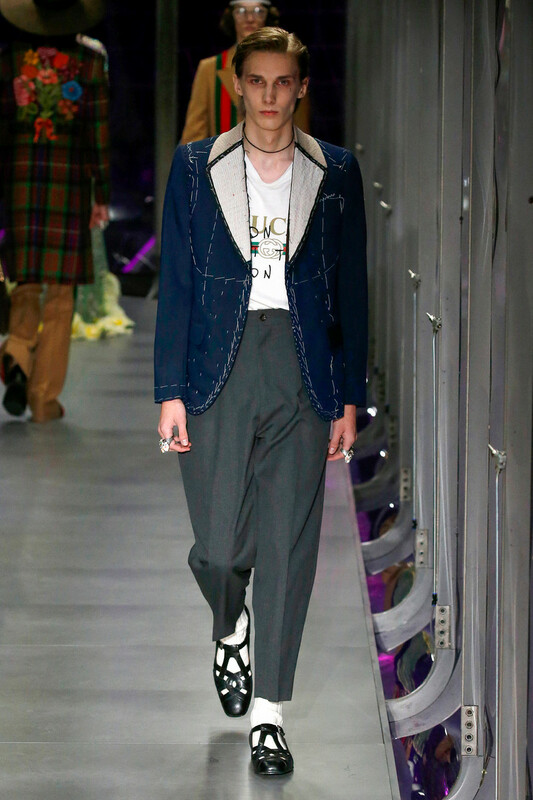 Elaborating on his previous – extremely successful – collections he sent out a selection of outspoken, costum-y clothes matching the SS2017 “illusion of love”-theme. 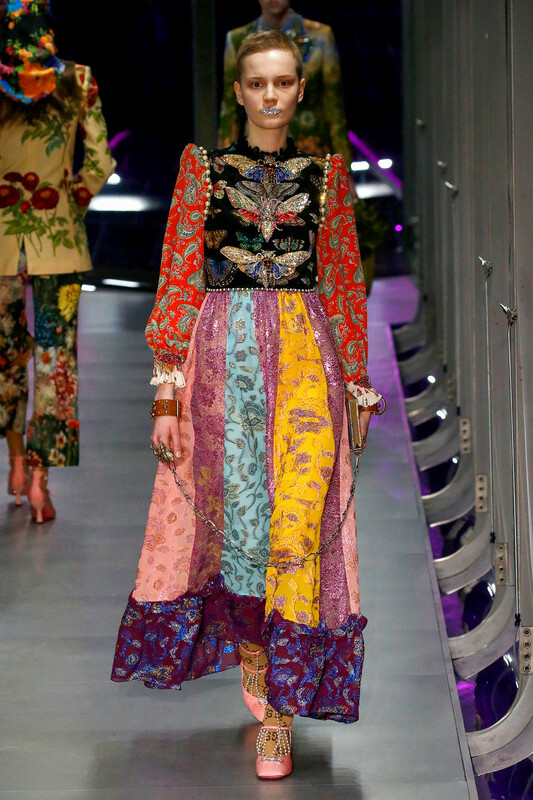 A collection not too different from the one hitting stores right now. 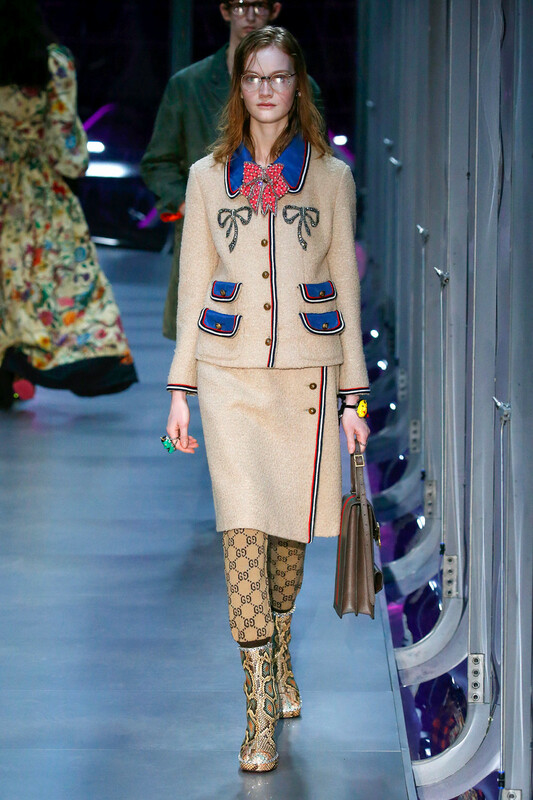 Never change a winning formula, right? 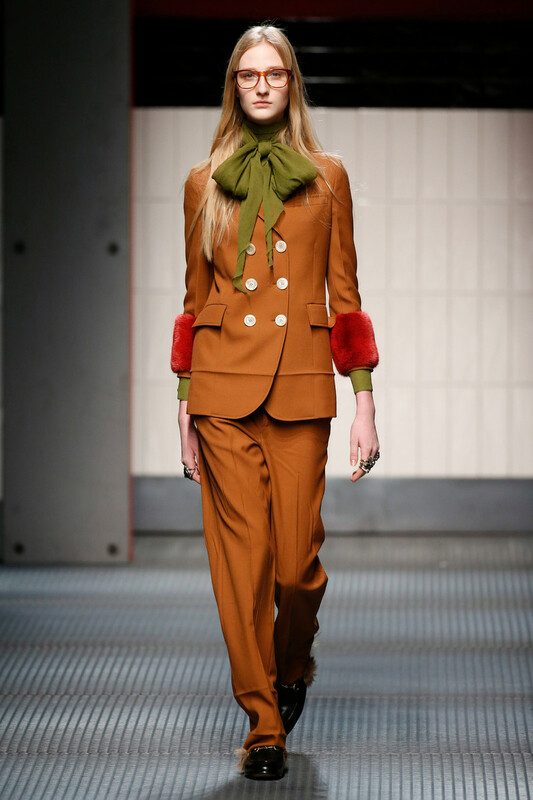 The success formula of seventies meets Renaissance was still a big theme. 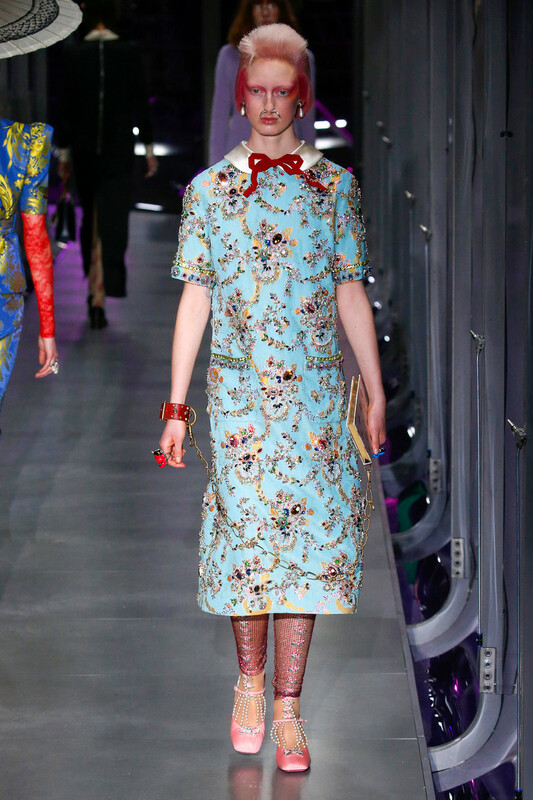 Evening dresses, platform loafers (with an extra slipper inside), frilled cocktail dresses and silky co-ords. 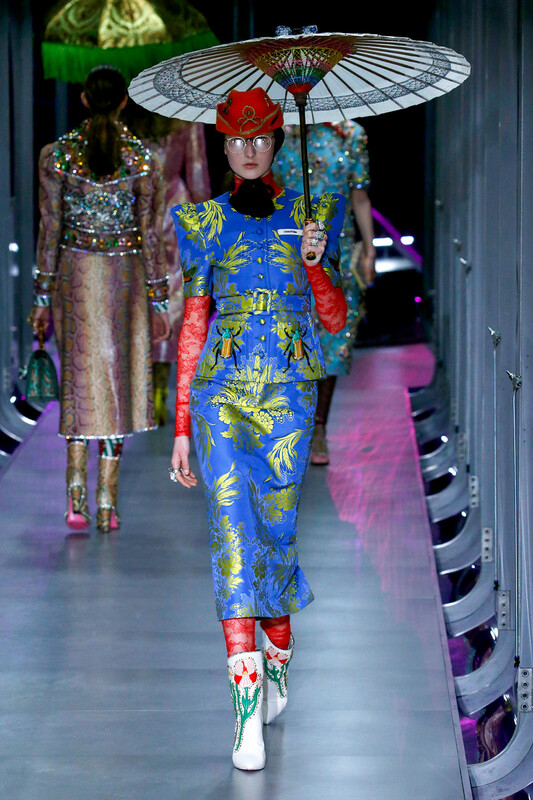 Lots of metallic accents, florals prints, huge earrings, enormous hats and those crystal embroidered glasses topped it all of. 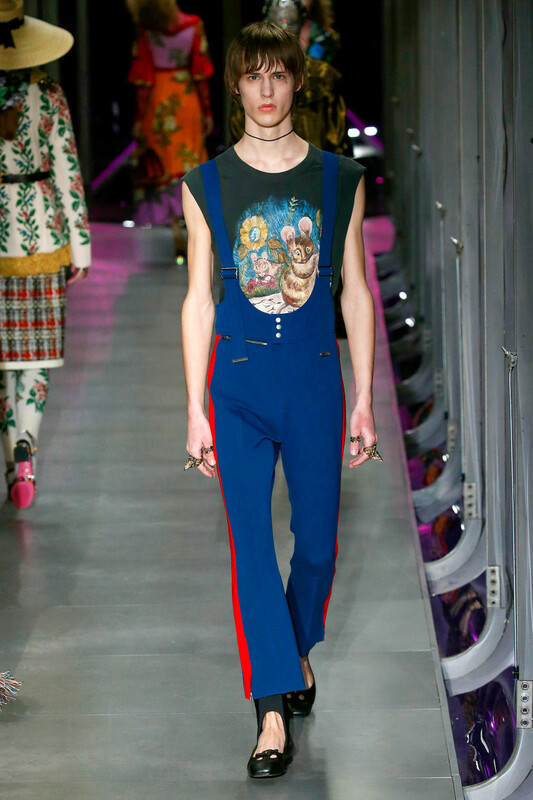 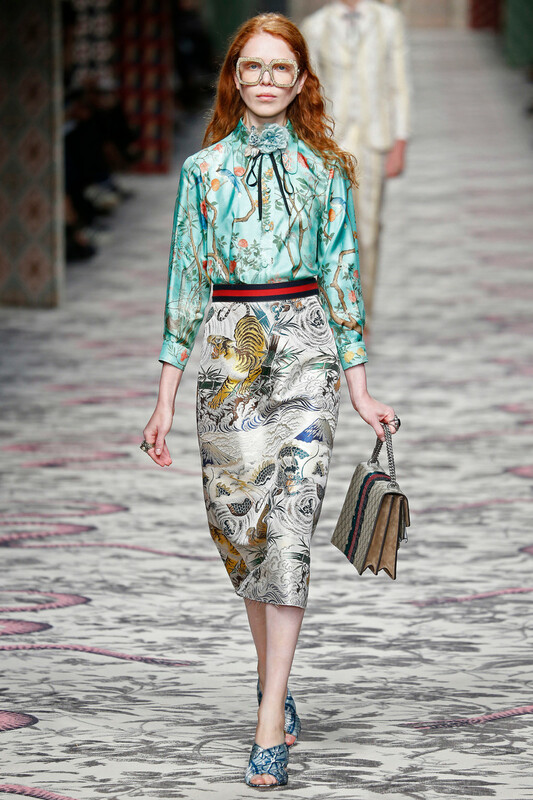 A marvellous collection that will surely have Gucci fans all over the world go wild. 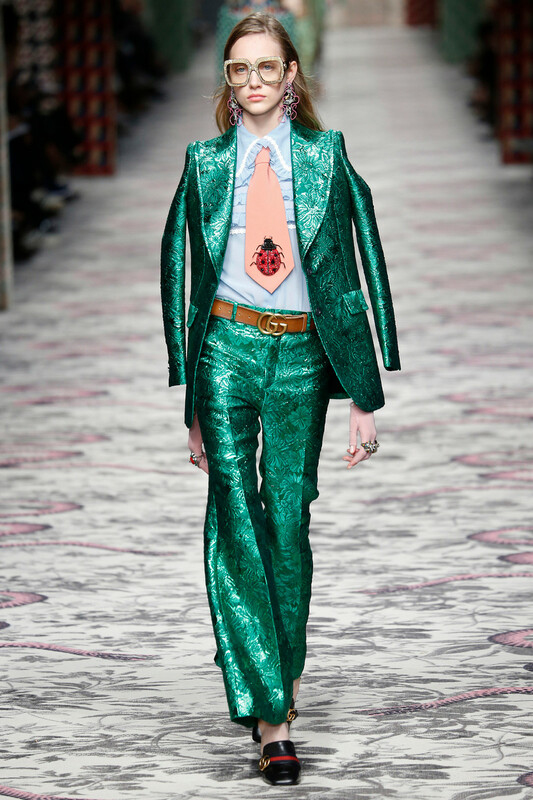 And while we’re still head over heels with this current Gucci image. 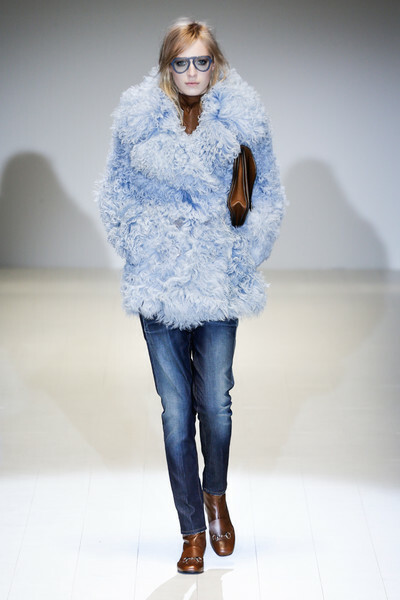 We can’t help but wonder when Michele will surprise us with some new ideas. 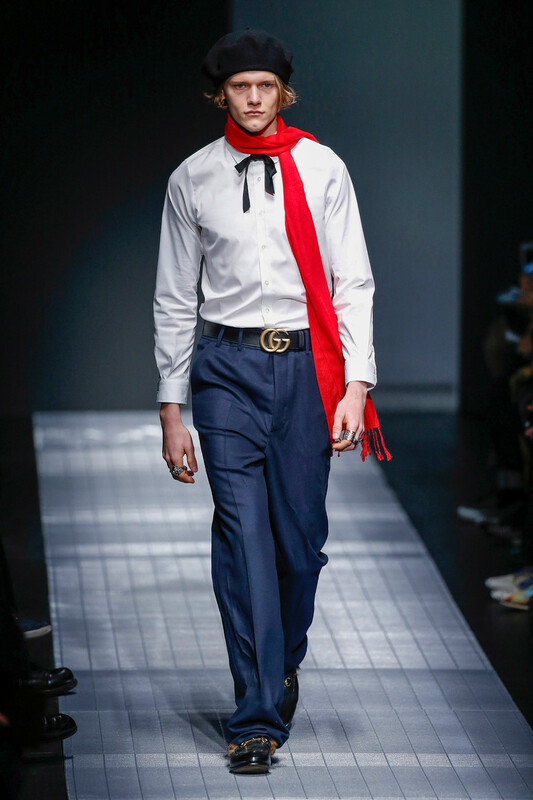 If it ain’t broke don’t fix it. 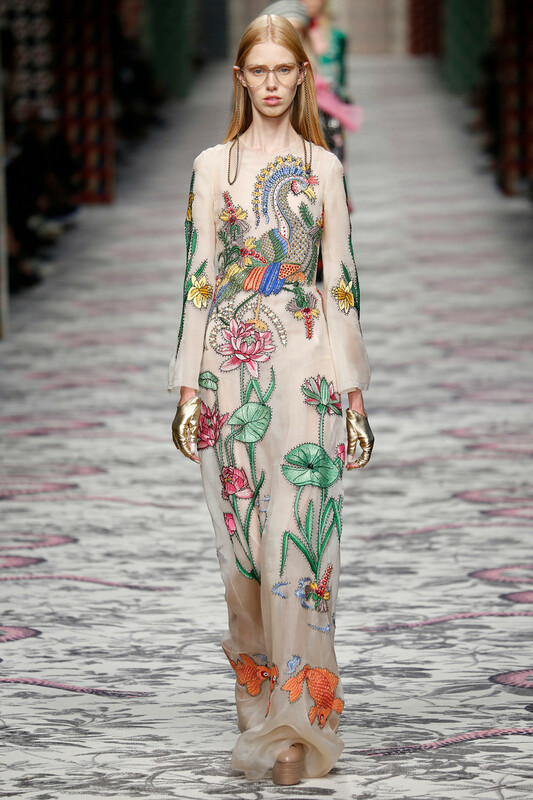 Yet a few more seasons of this maximalism success story and we might start to think it wasn’t true love, just a fling. 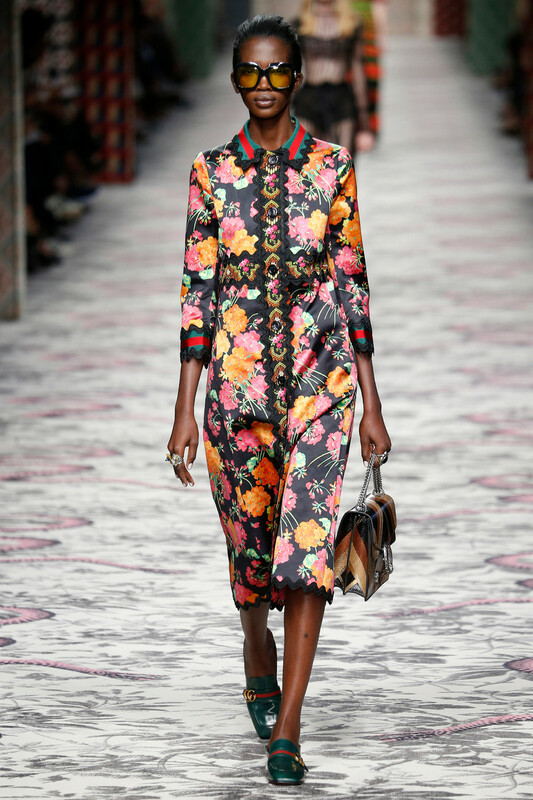 Anything Alessandro Michele comes up with we put straight on top of our wishlist. 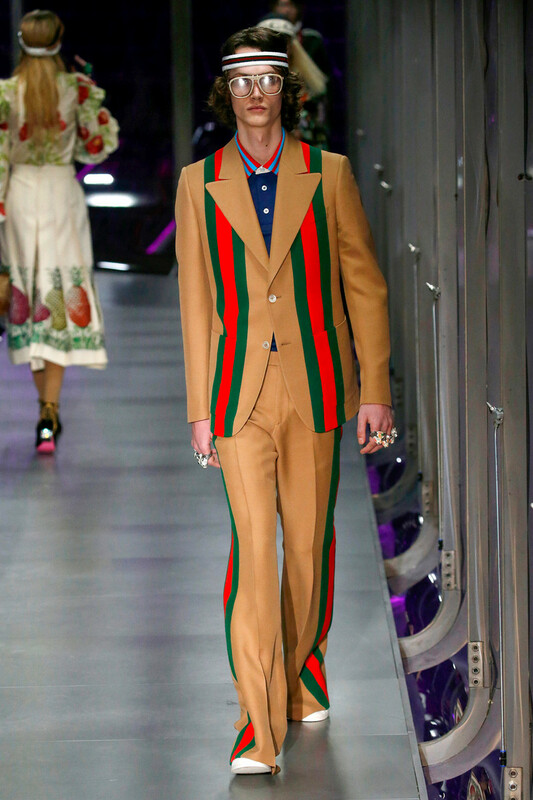 The Gucci designer seems to have the power to make the most contemporary and highly desirable fashion pieces. 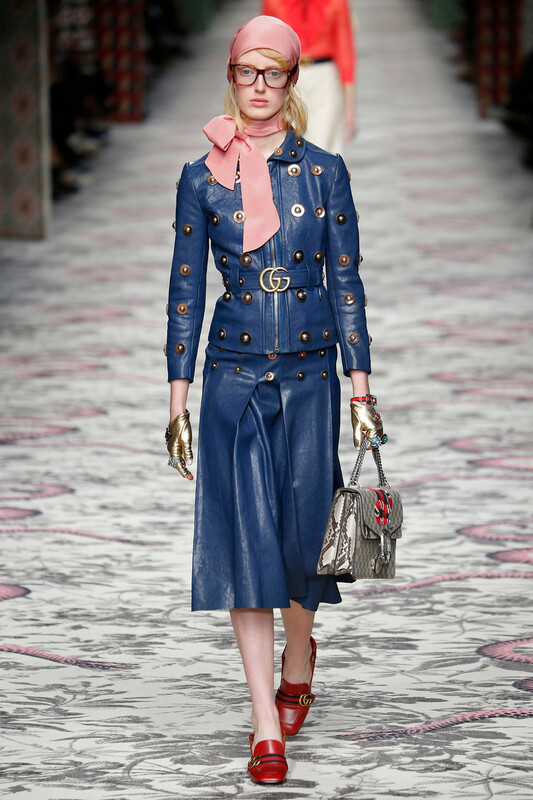 From the metallic pleated skirts to the berets, from the fur lines loafers to all variations of the Dionysus bag; we simply want it all. 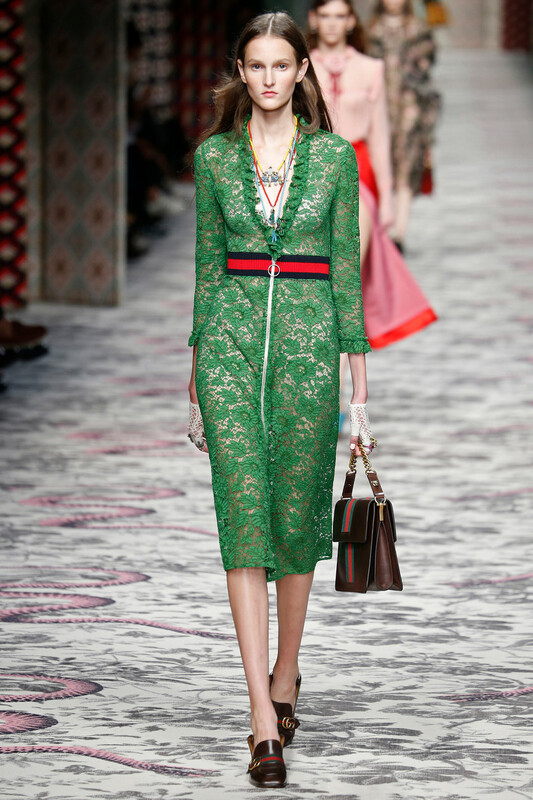 Gucci has been the hottest Milan label for several seasons now. 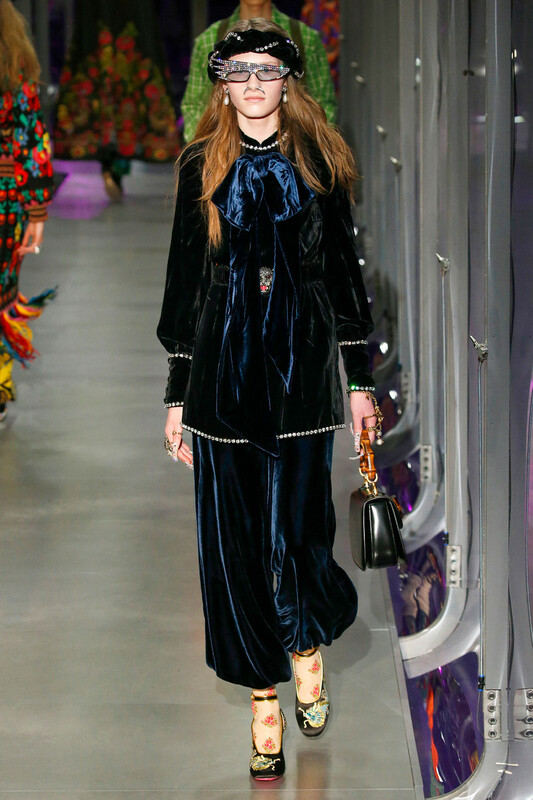 An invitation to the catwalk show is the hottest ticket in town, the Gucci store is making overtime and that shows on the streets too. 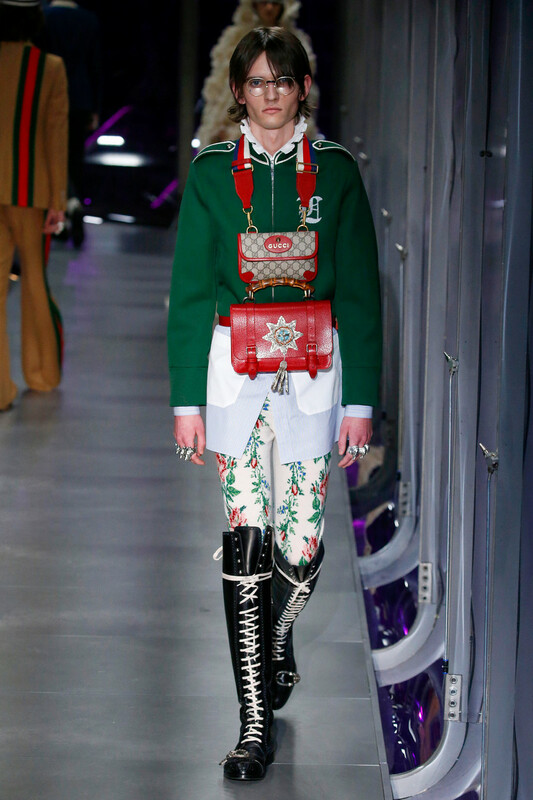 Which ever fashion event we pull up to Gucci is always well represented. 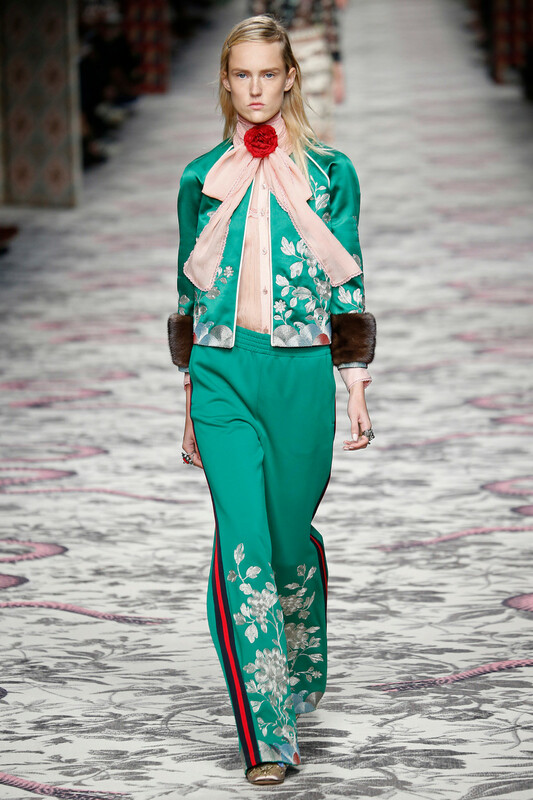 And where to spot the best Gucci apparel than in Italy’s fashion capital? 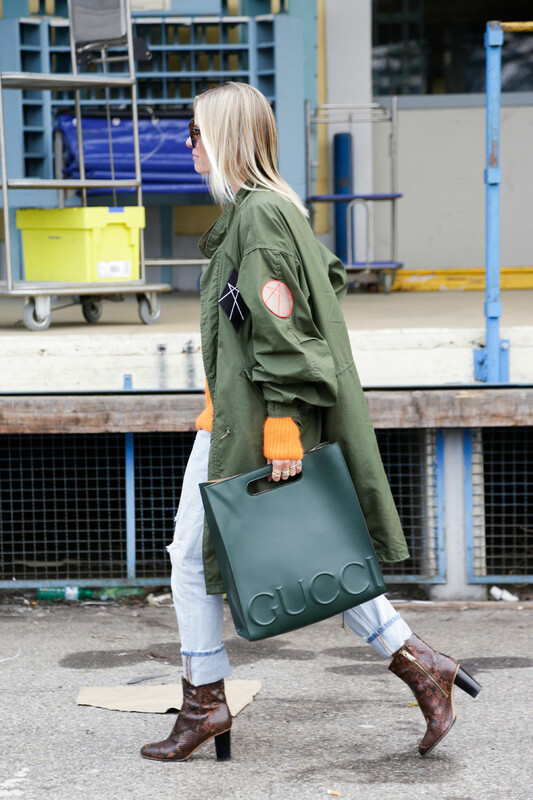 In our gallery below you find some of the coolest streetstyle looks created around some of the best selling Gucci items. 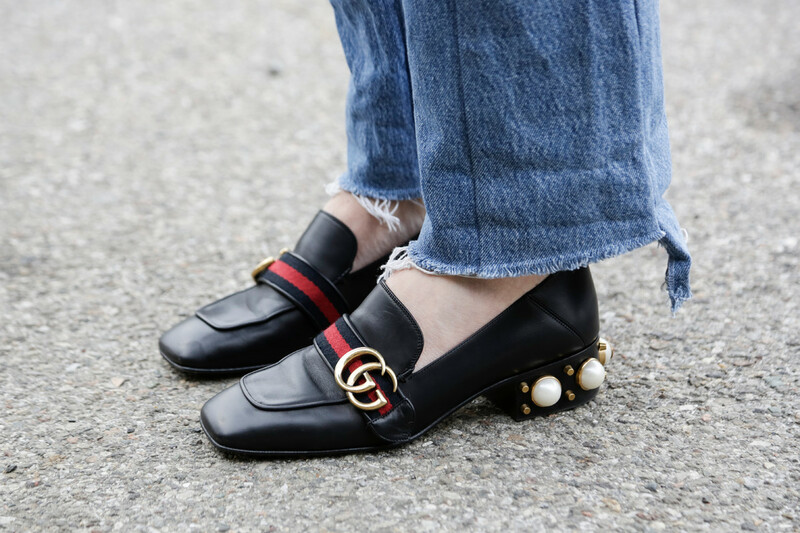 And yes, you saw that right, the Dutch editors of Vogue, Elle and Harper’s Bazaar are joining in on the Gucci fun even sporting those stunner pearl studded loafers. 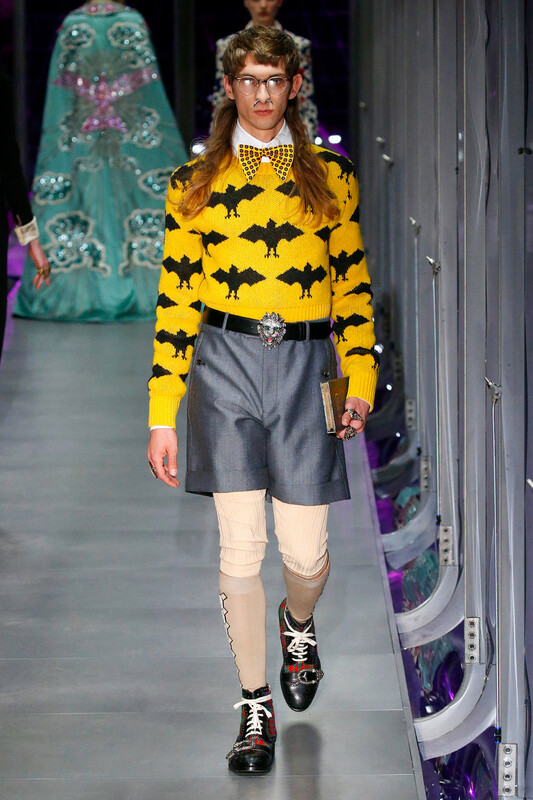 Woa! 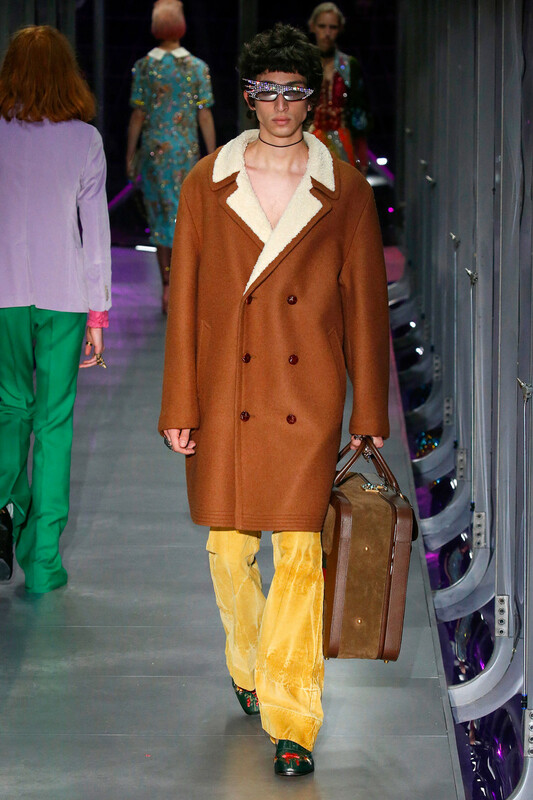 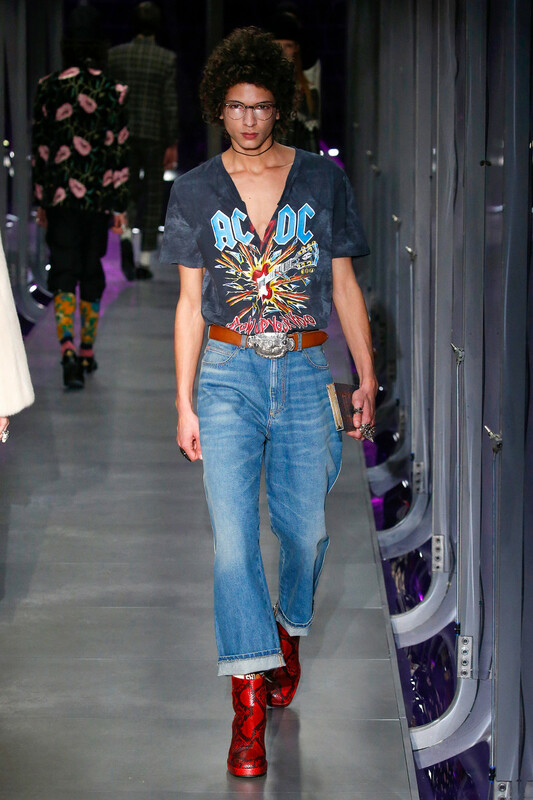 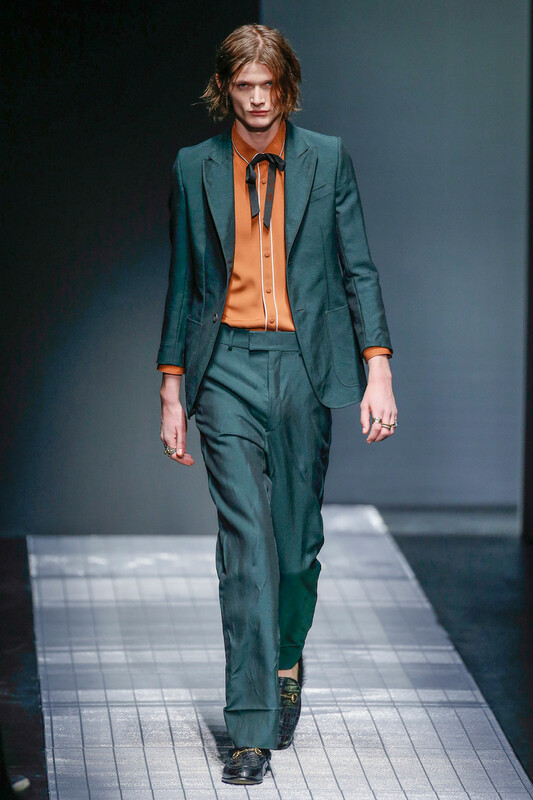 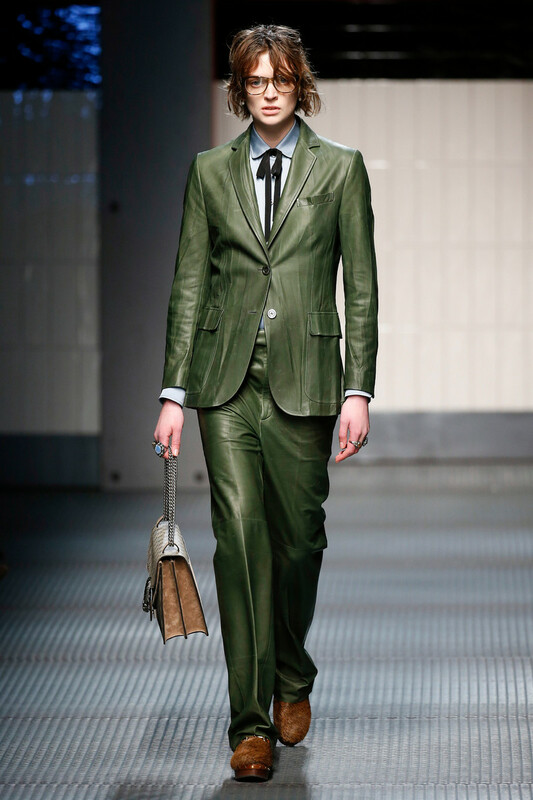 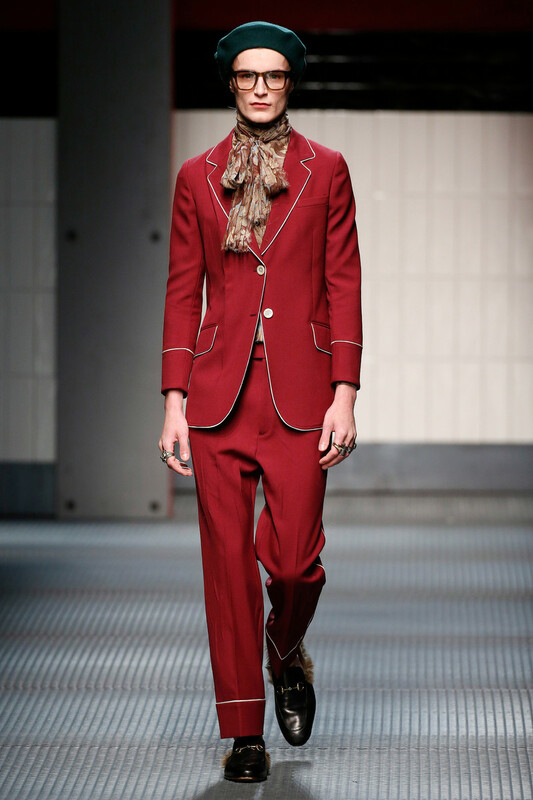 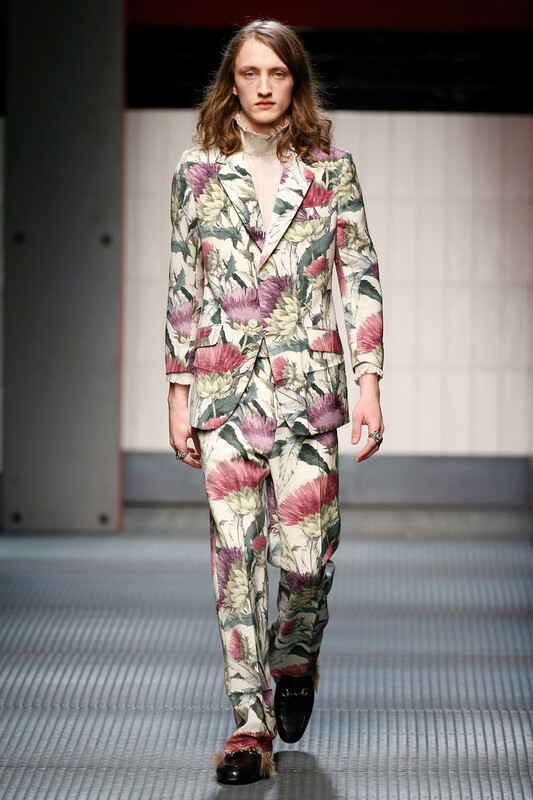 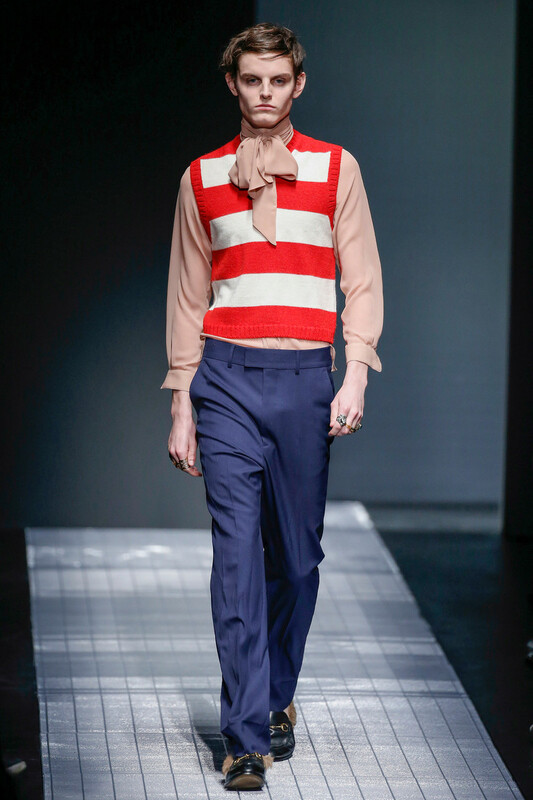 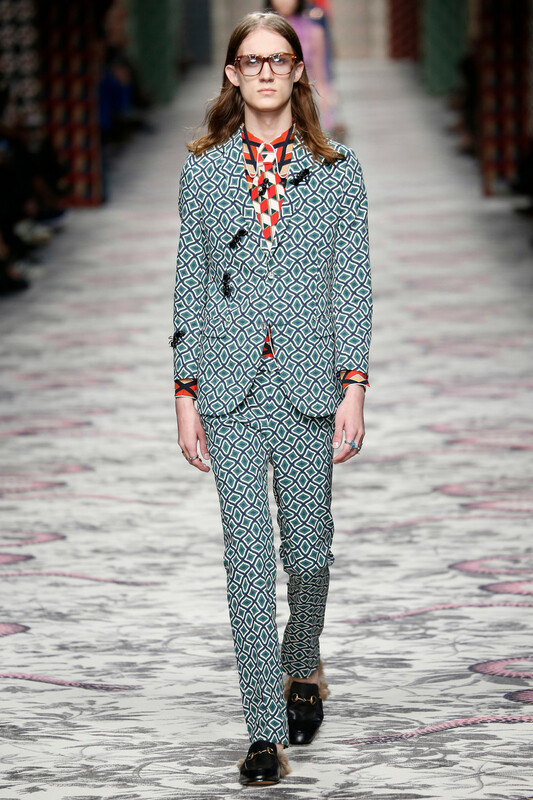 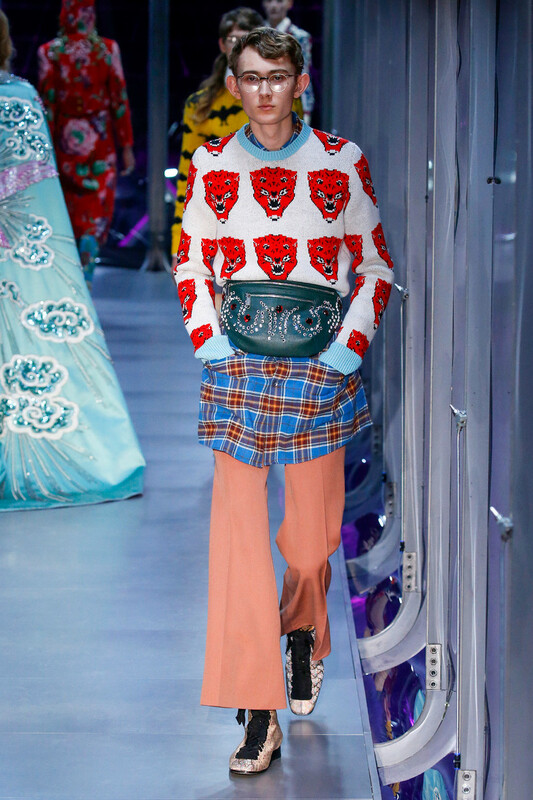 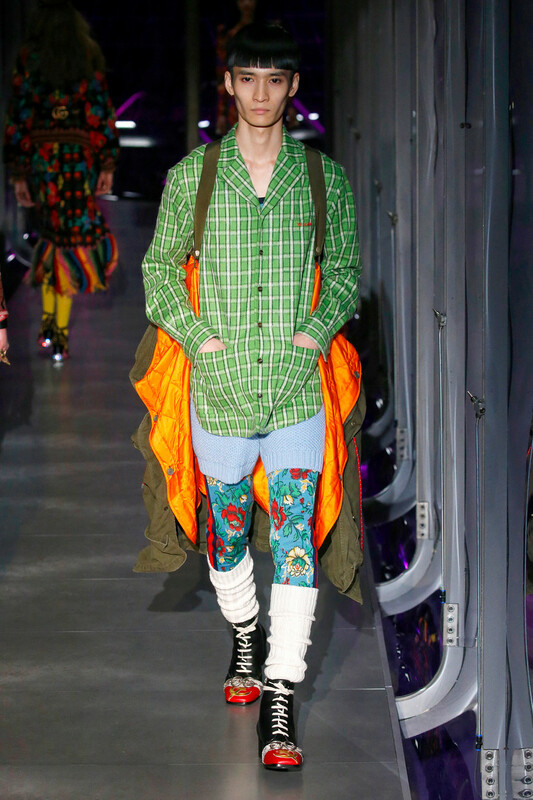 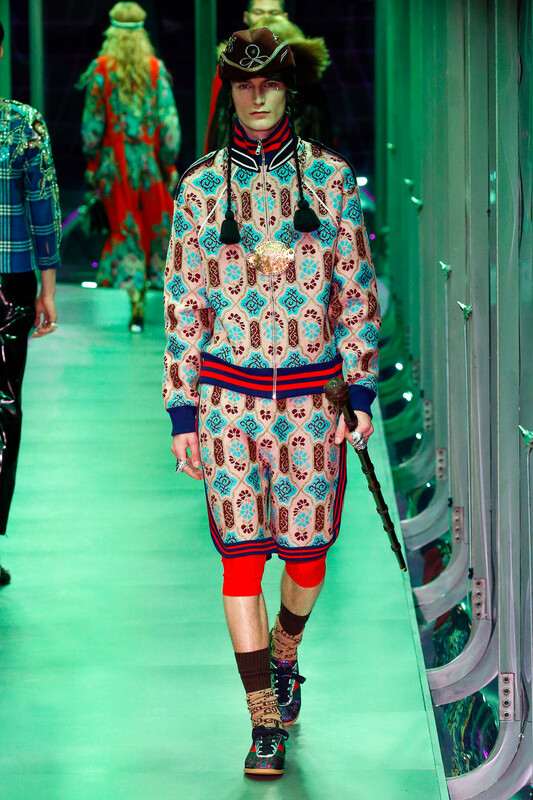 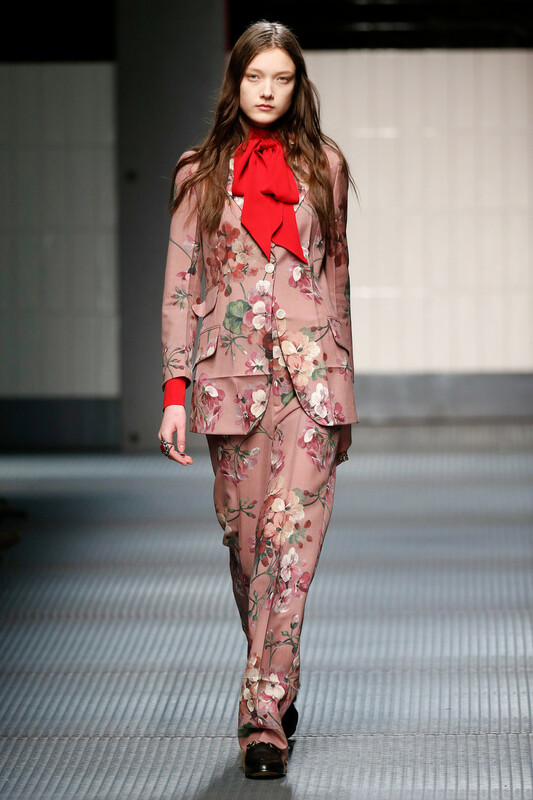 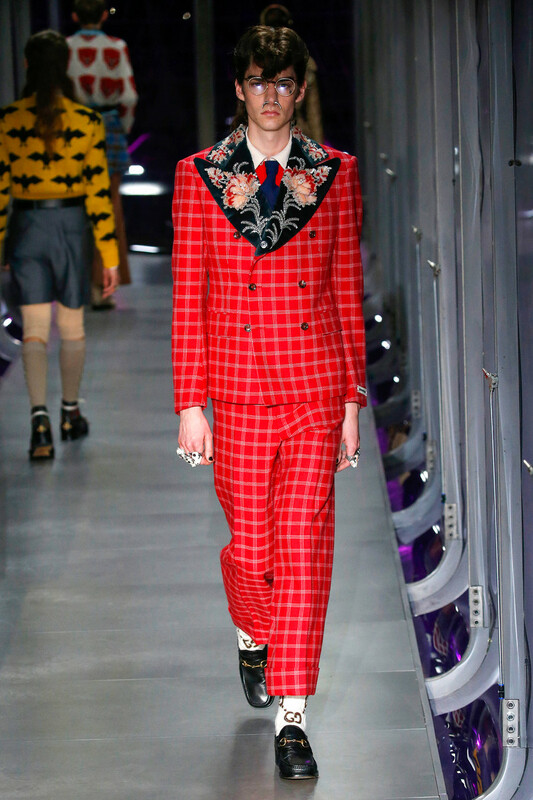 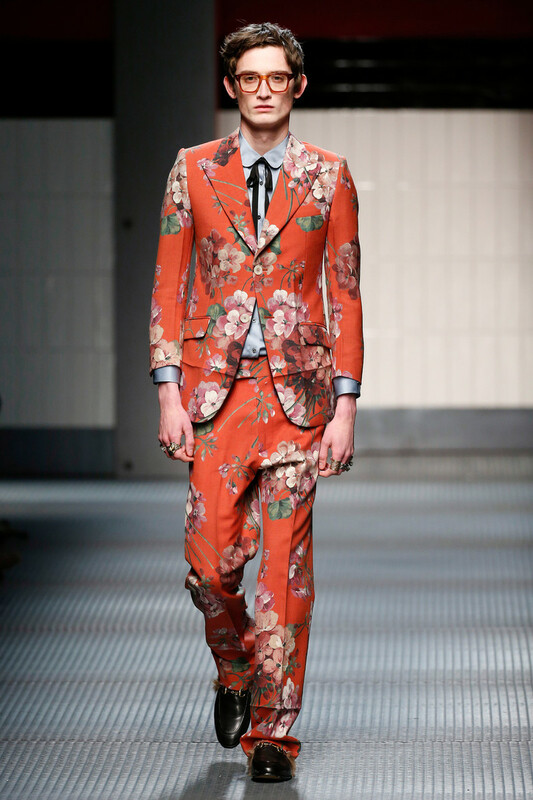 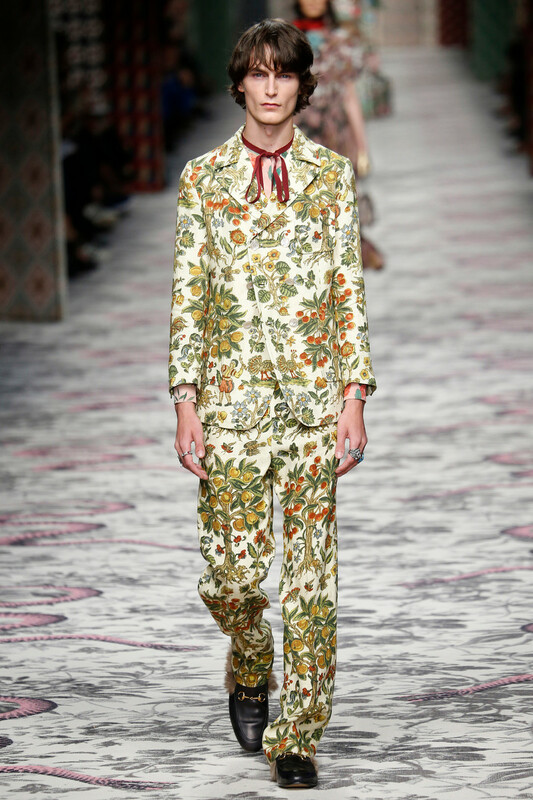 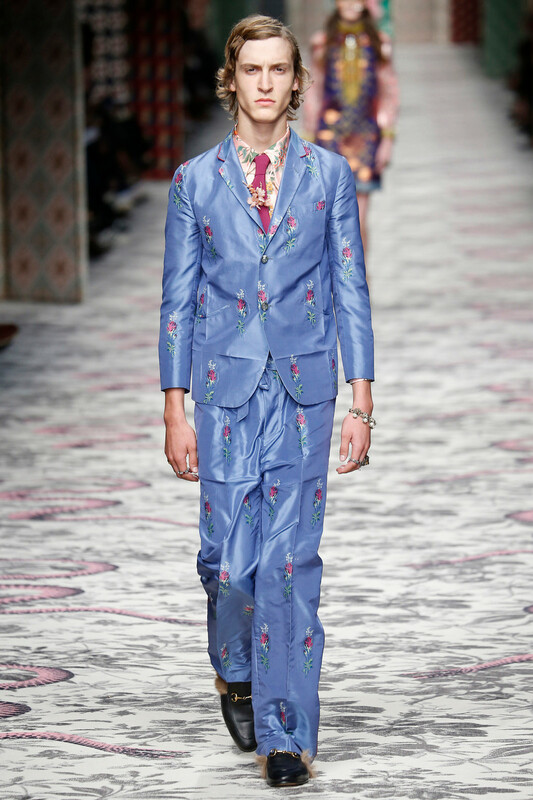 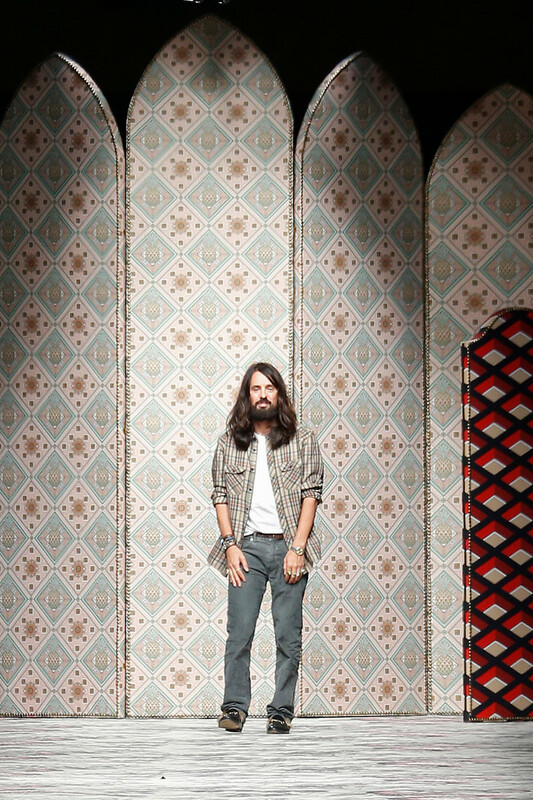 Gucci’s new designer Alessandro Michele presented his first official menswear-collection. 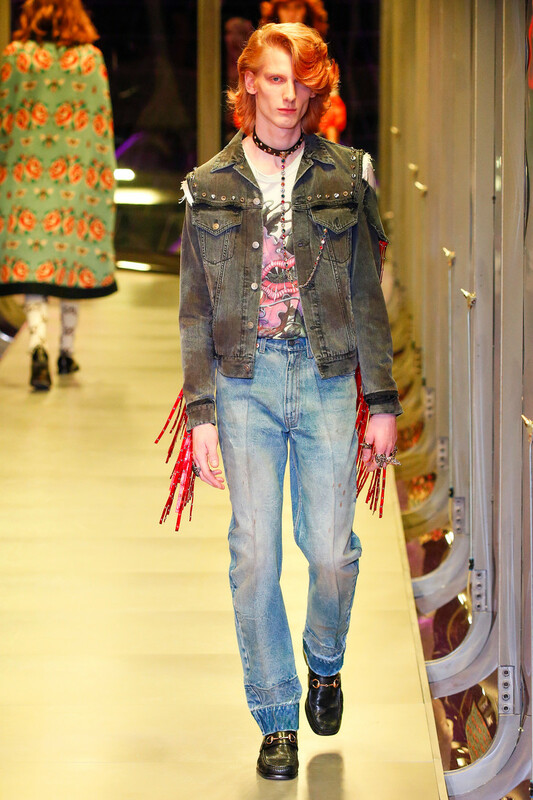 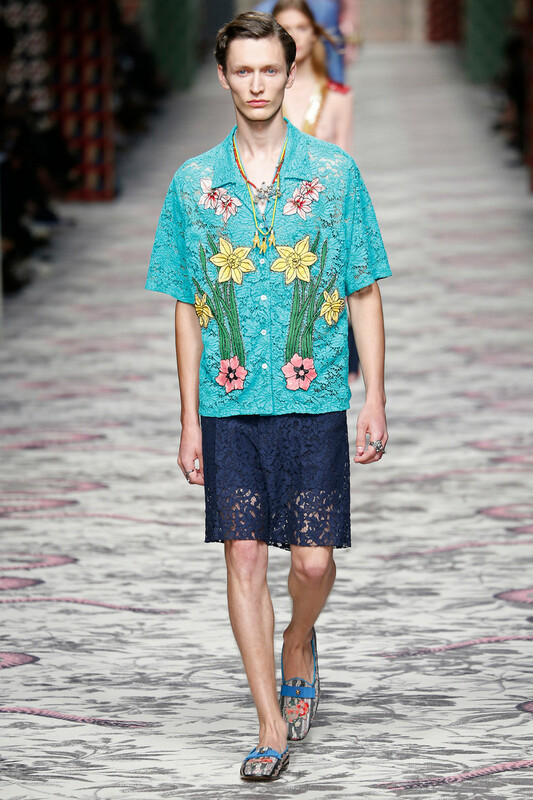 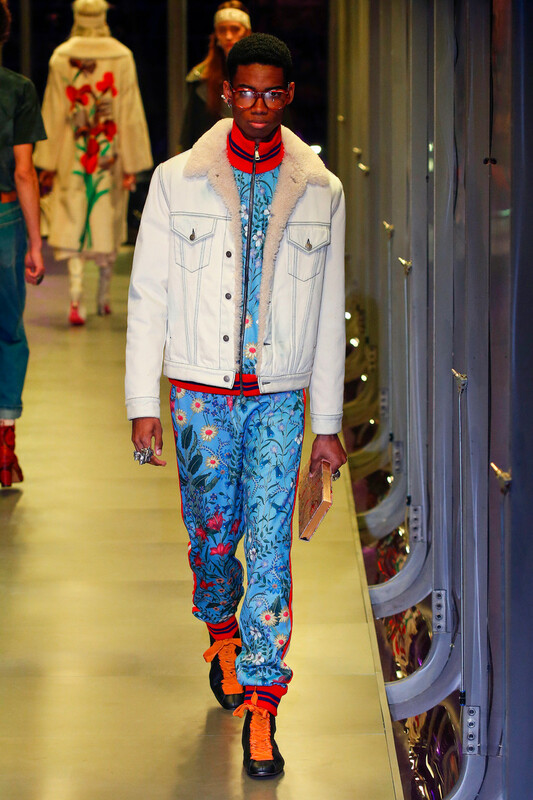 This collection amplified his idiosyncratic, “genderless” approach as he lavished his thrift shop Seventies collection with florid embroideries of exotic birds, butterflies and flowers. 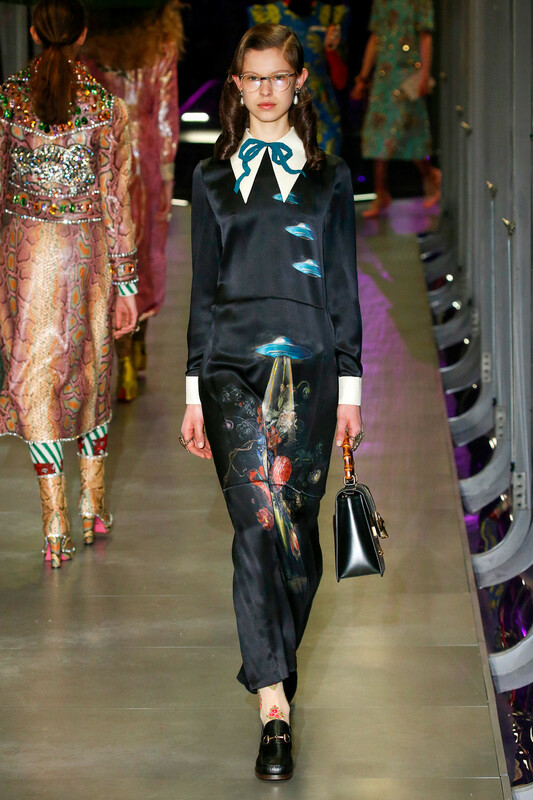 Choral music played as the the often bespectacled models walked a 300-foot runway. 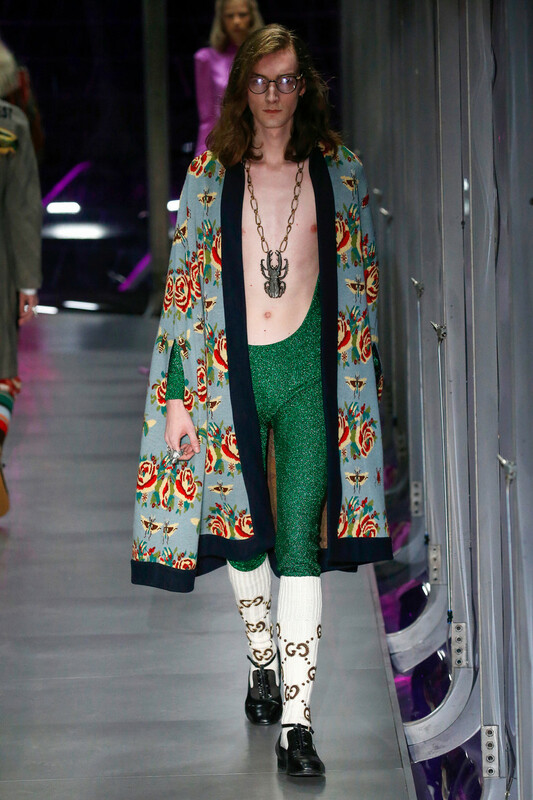 Except for the radical bell-bottomed pants and jeans that puddled over Corvette red loafers, almost every garment and accessory was embellished, from fur trim on jade green silk robes and silvery botanicals crawling over a red tracksuit to the punk studs lining the Achilles tendon of silvery sneakers. 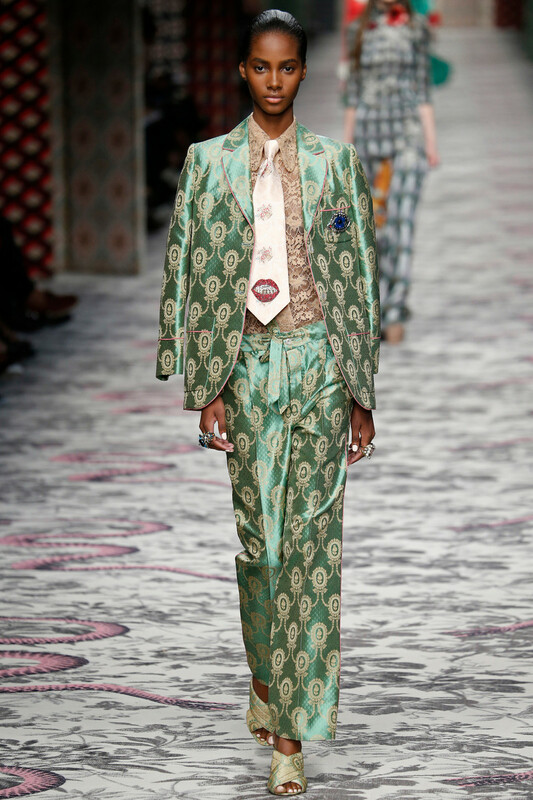 On Michele’s coed runway, the line between suits and pajamas blurred in a barrage of lavish silk brocades and wallpaper prints. 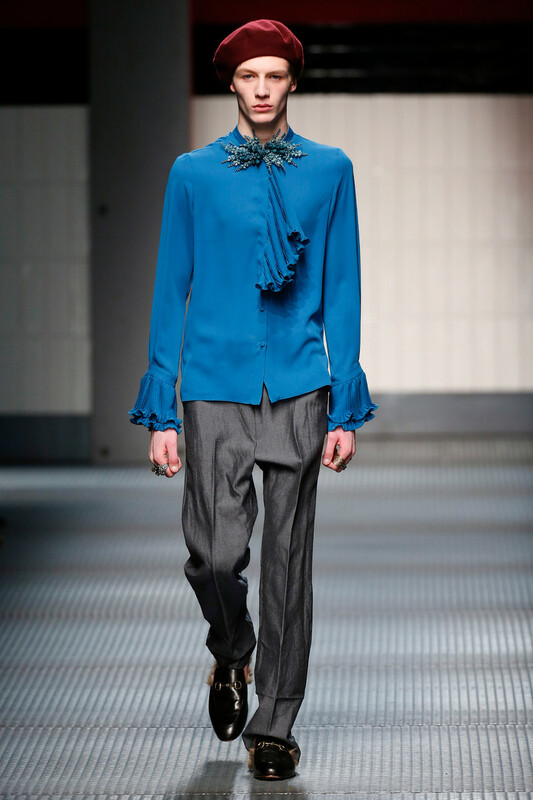 Bow blouses, or ones with pointy collars or sailor airs, were worn by both sexes — and sometimes it was hard to tell him from her. 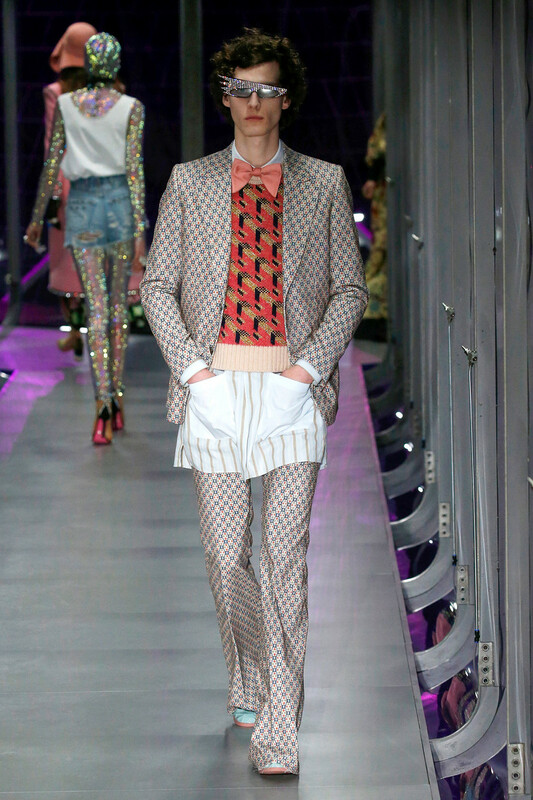 The press has been gentle on the unassuming Michele, embracing his daring neo-dandyism and recognizing his influence. 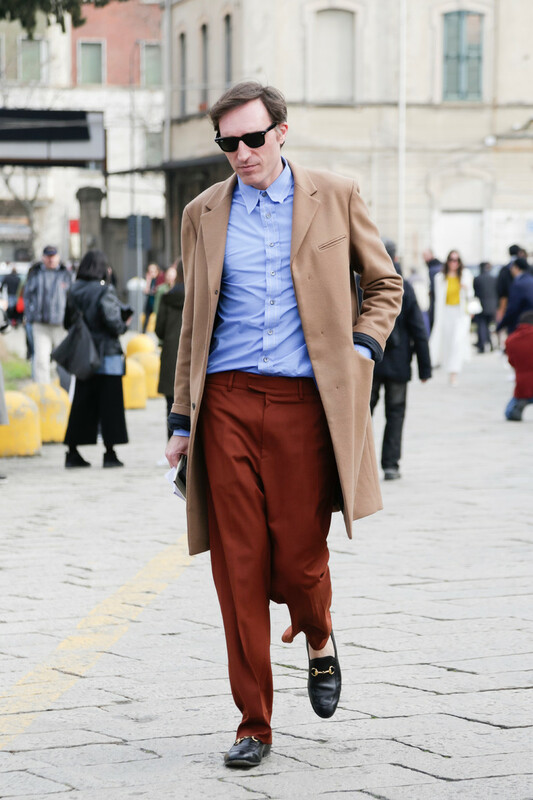 Let’s see what his customers will say. 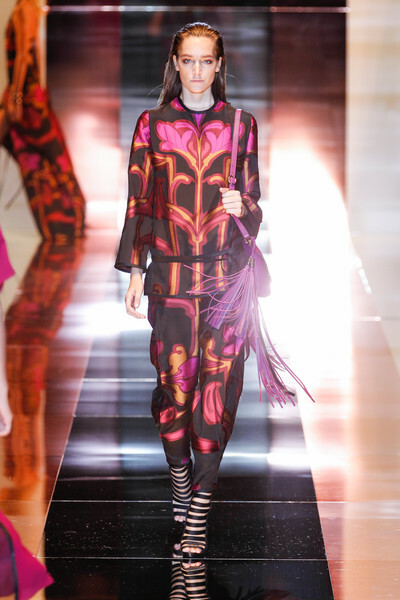 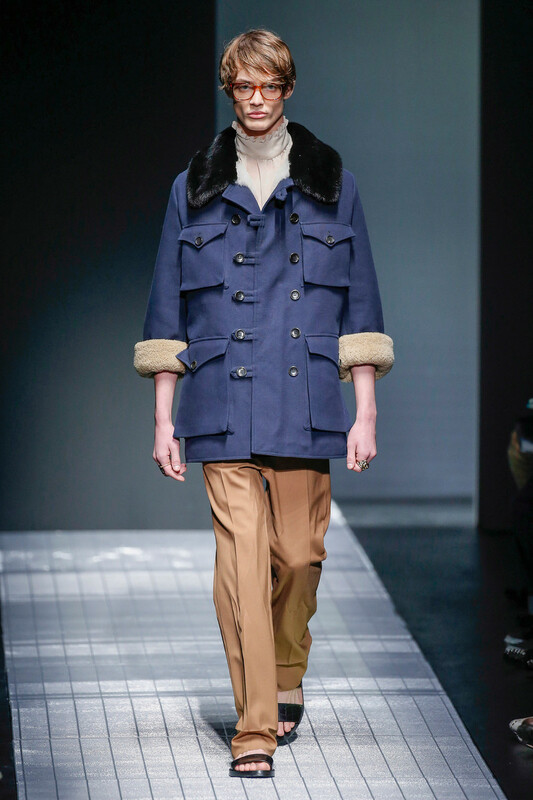 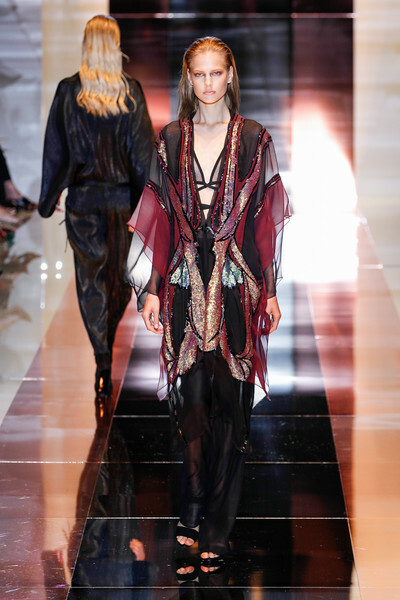 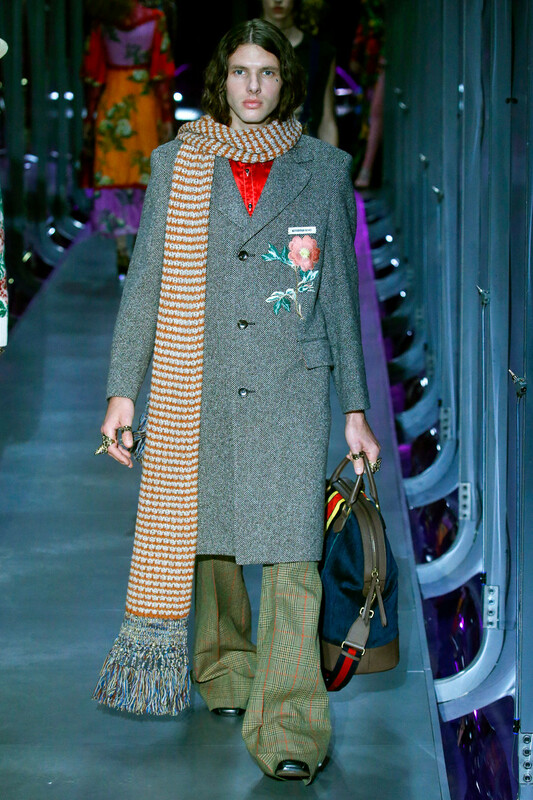 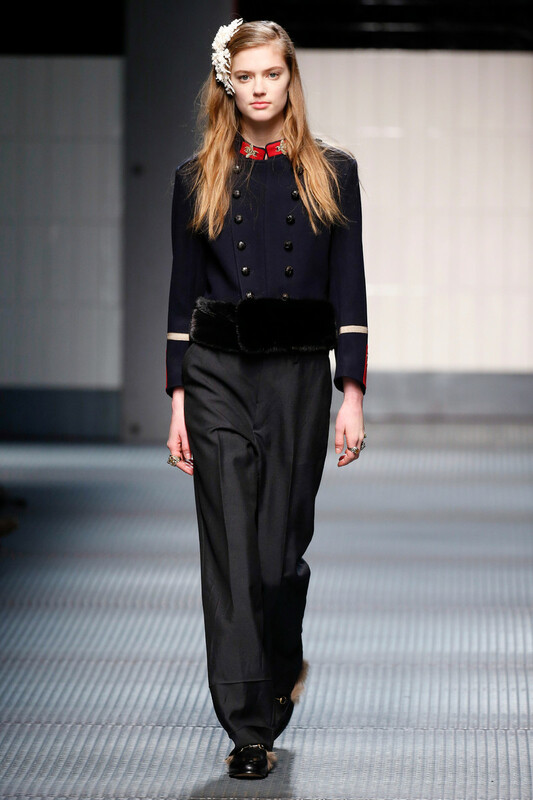 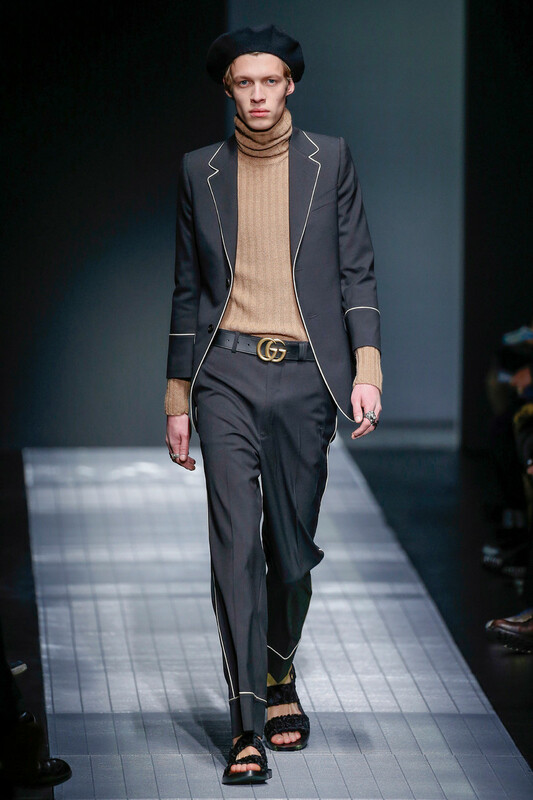 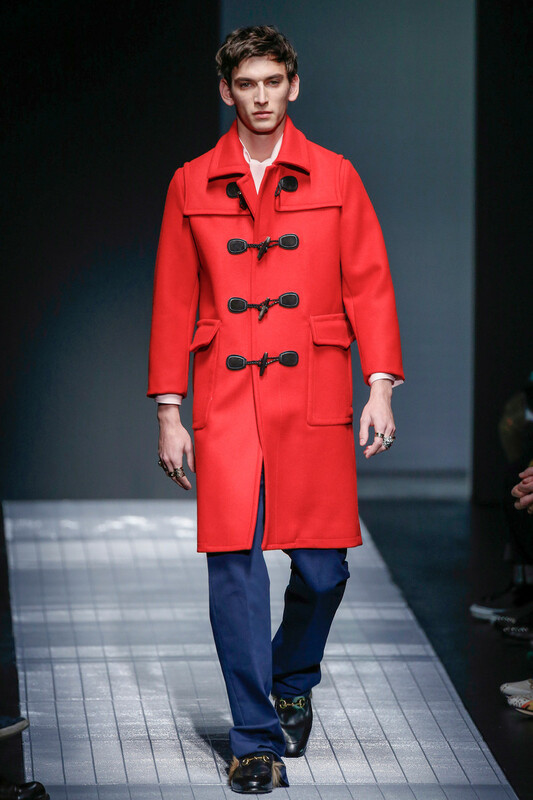 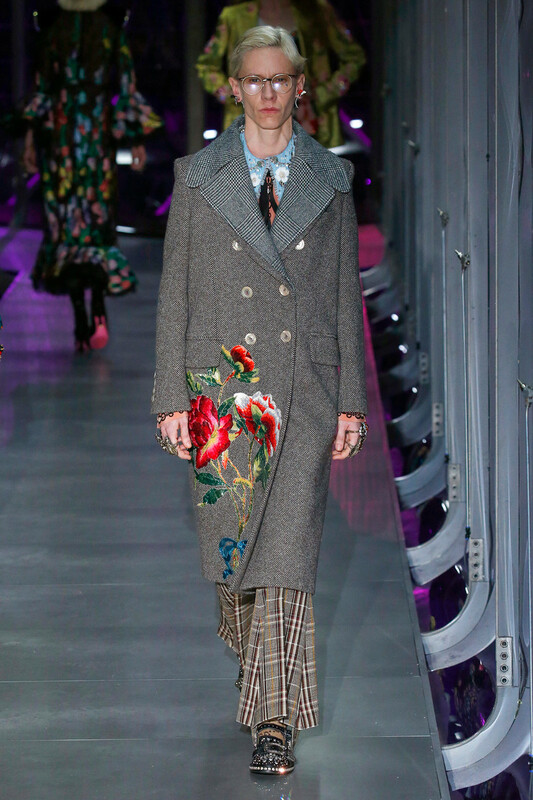 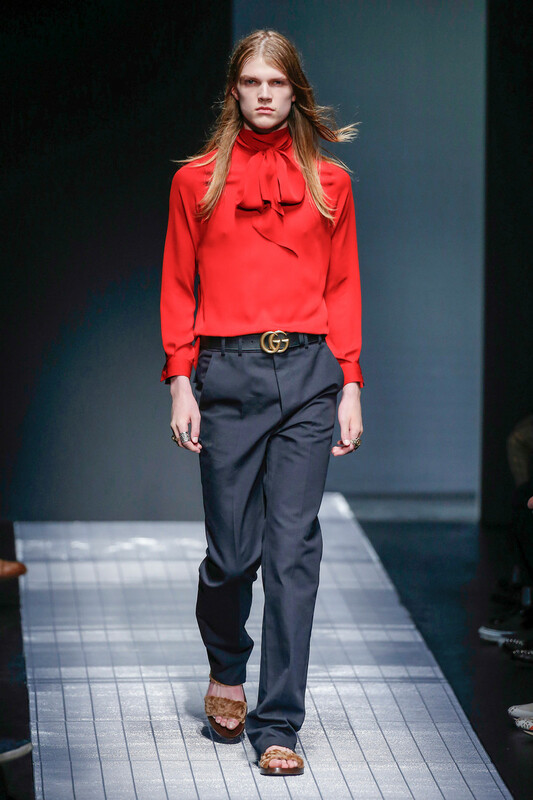 After Frida Giannini’s early leave at Gucci last week apparently the whole f/w collection was redone. 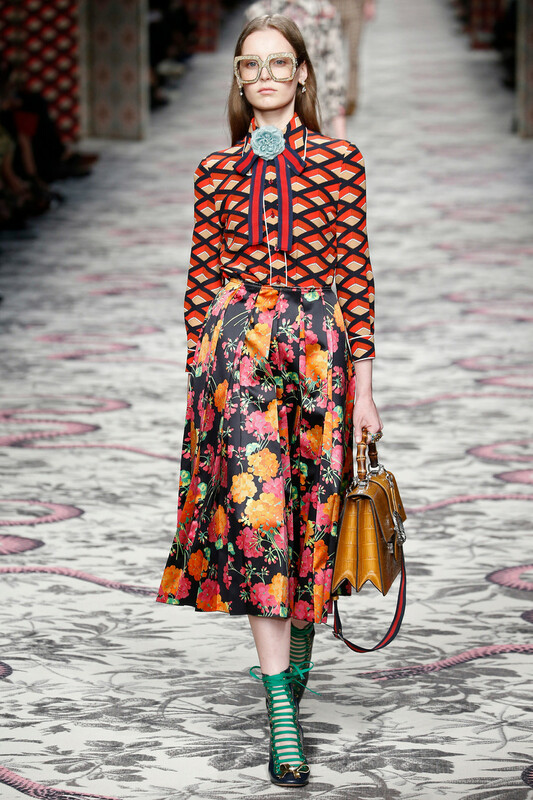 In 5 days(! 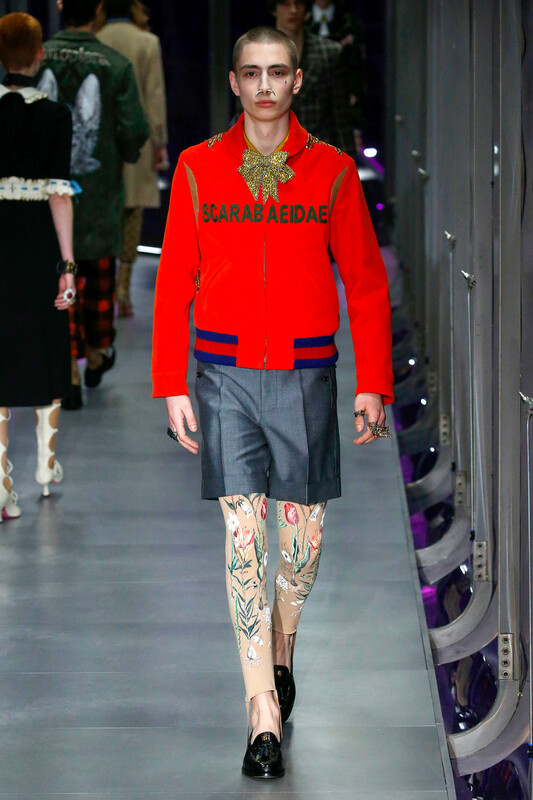 ), so we’ve read. 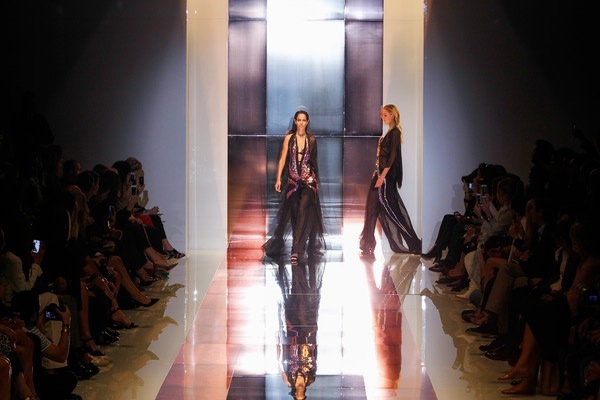 The show was a lot of things. 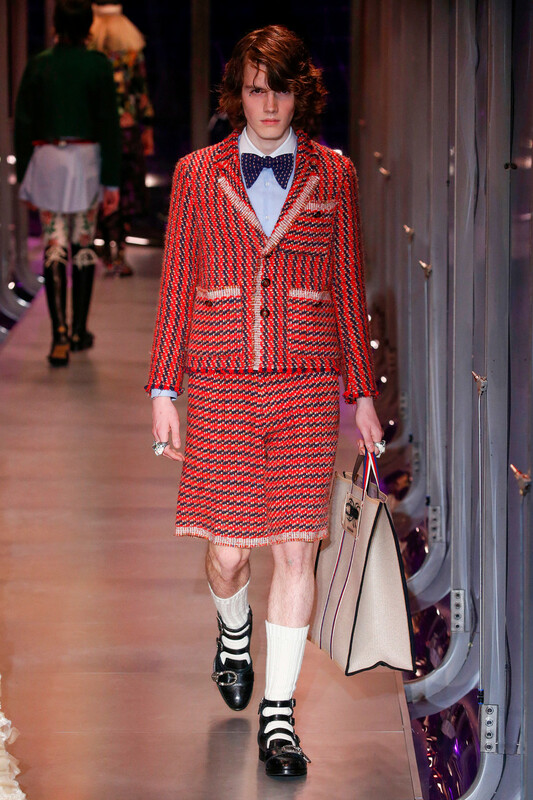 Gender ambiguous being one of them. 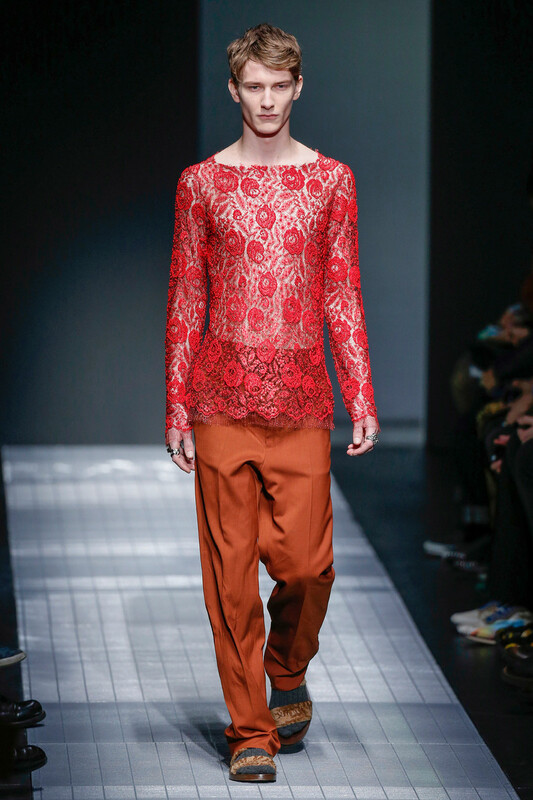 A girl came on in a deep colored suit, a guy appeared in a lace red top. 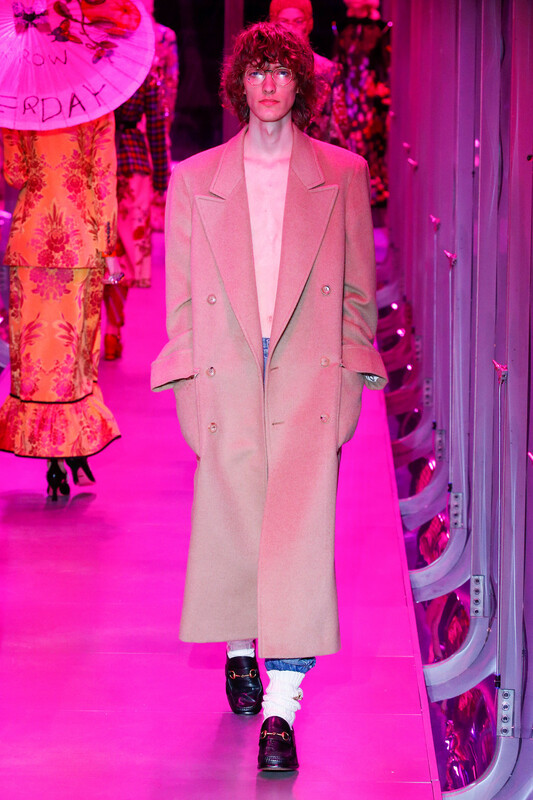 Trench coats, toggle coats, military jackets (all with too short sleeves), fur coats and capes were introduced alongside sleeveless tops and chiffon bow blouses. 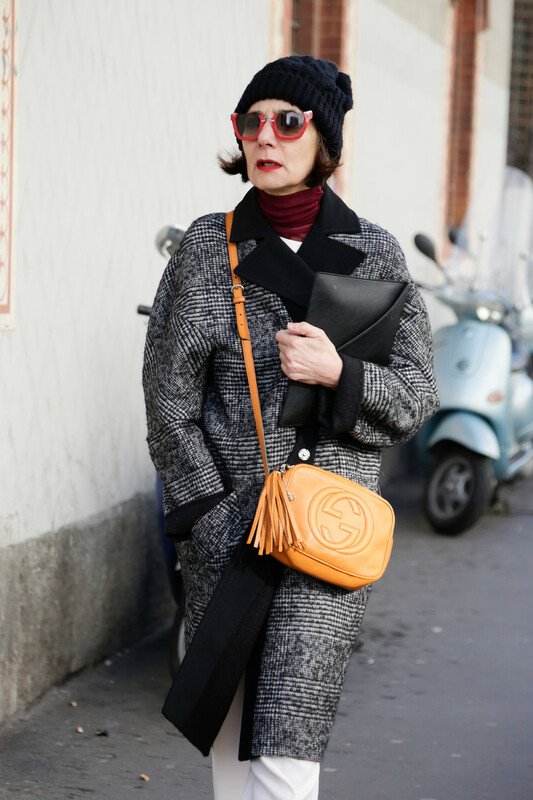 There were woolen beanies and berets as well as flip flops and XL glasses. 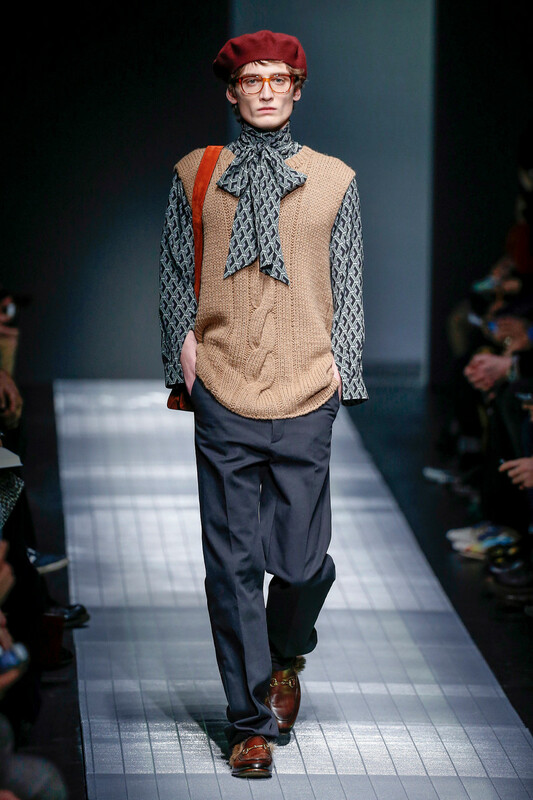 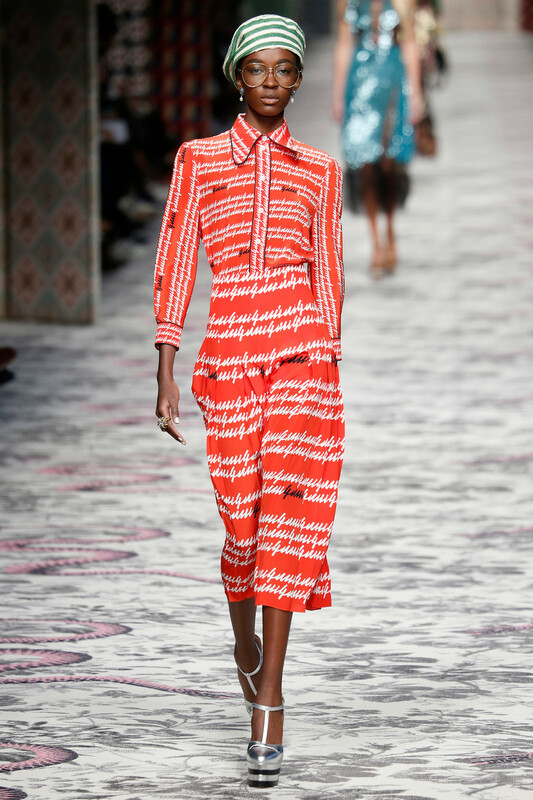 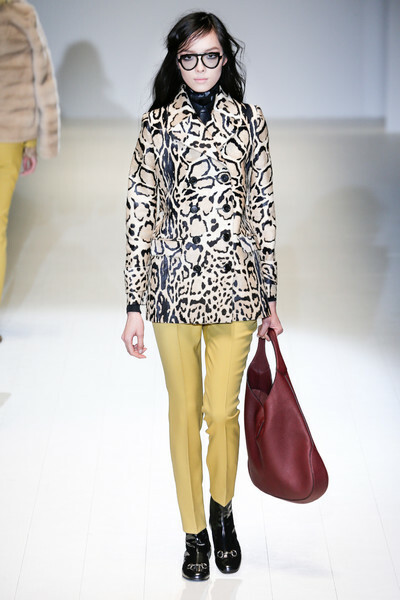 Colors, graphic prints, shape and fit of the clothing all had a seventies feel to them. 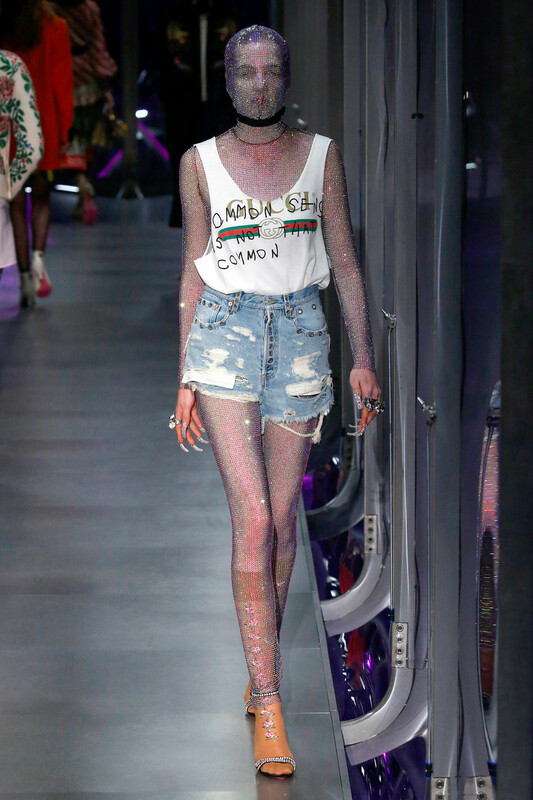 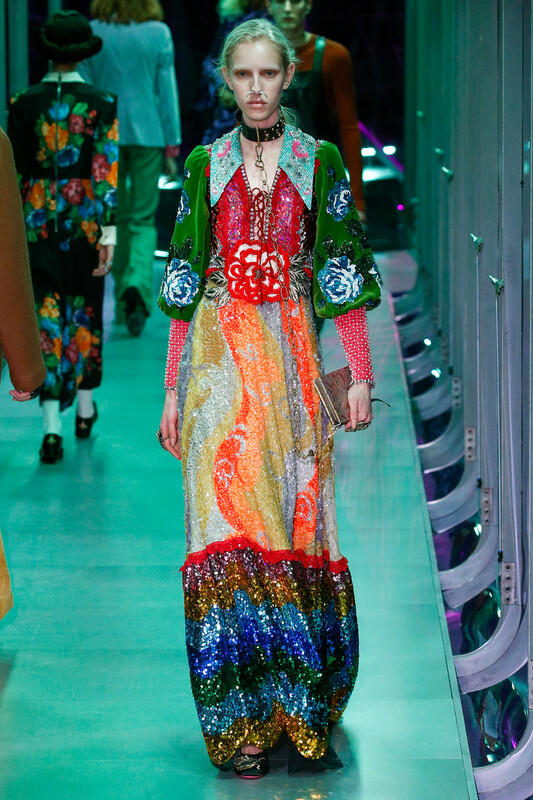 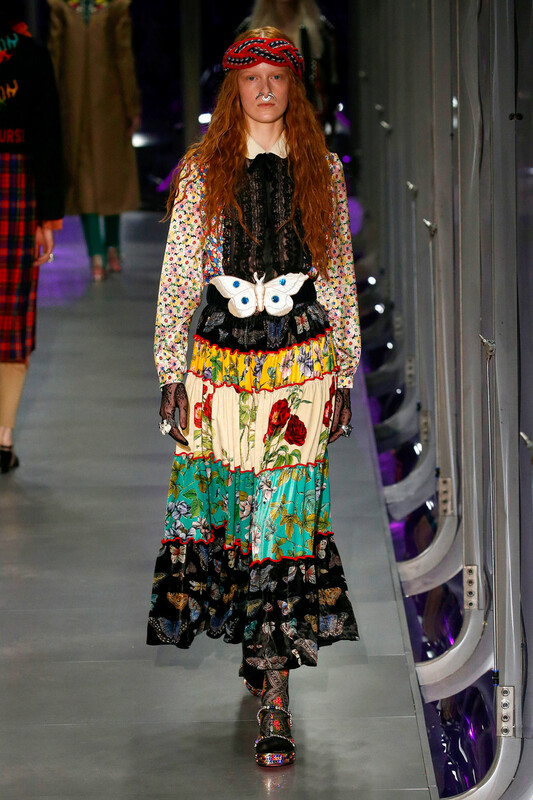 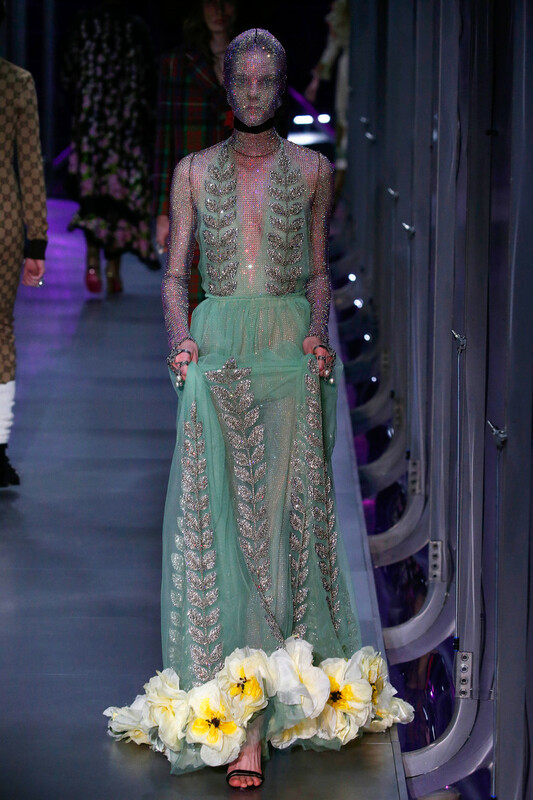 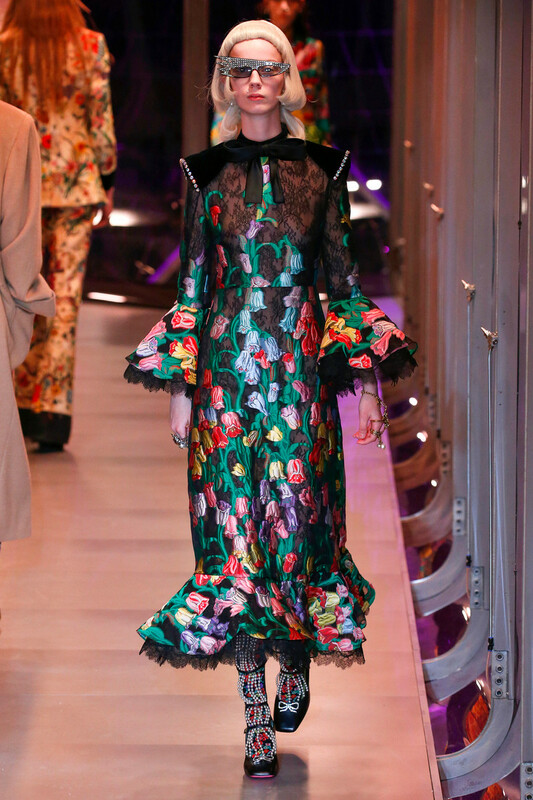 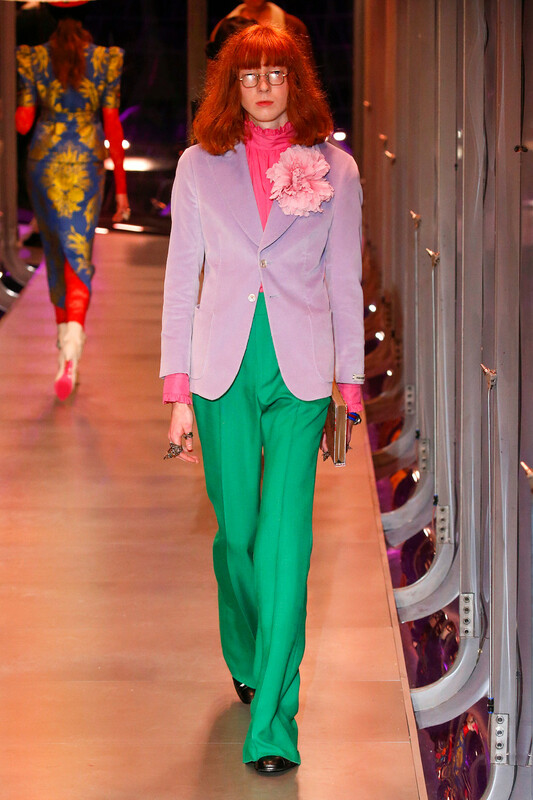 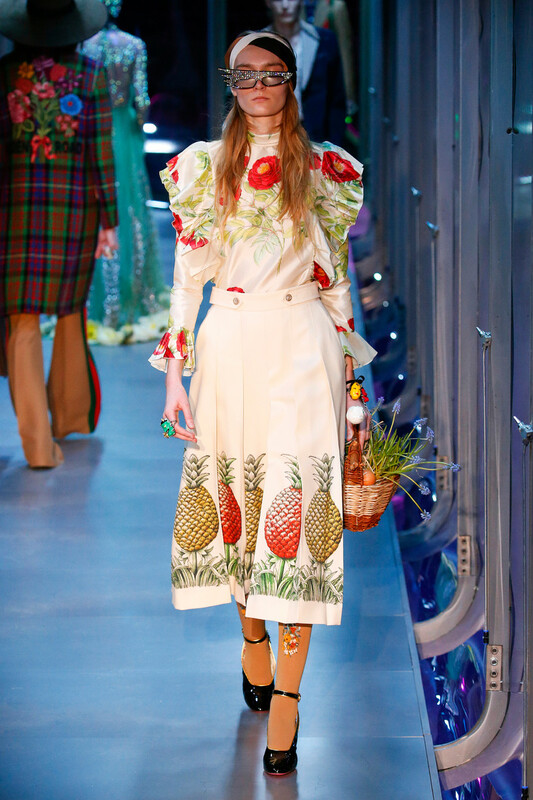 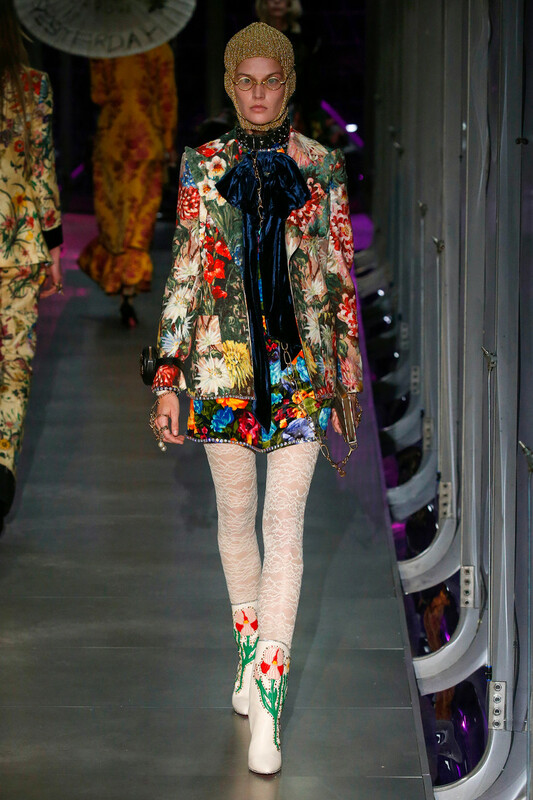 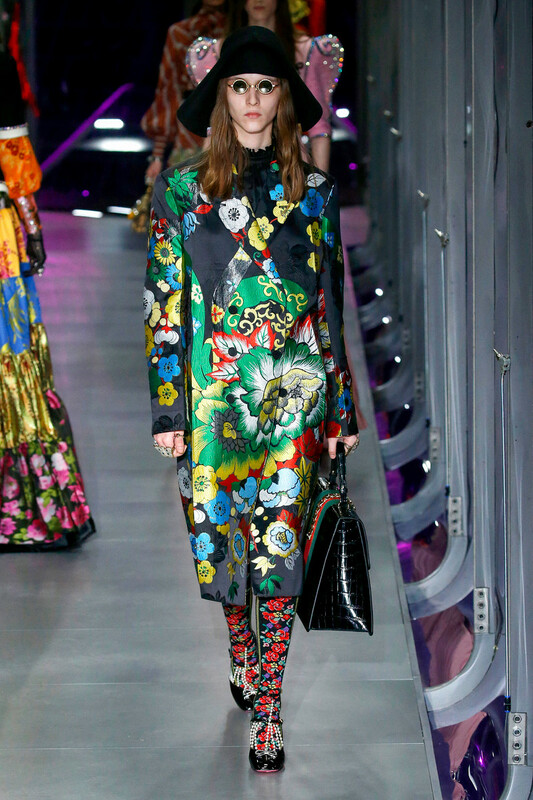 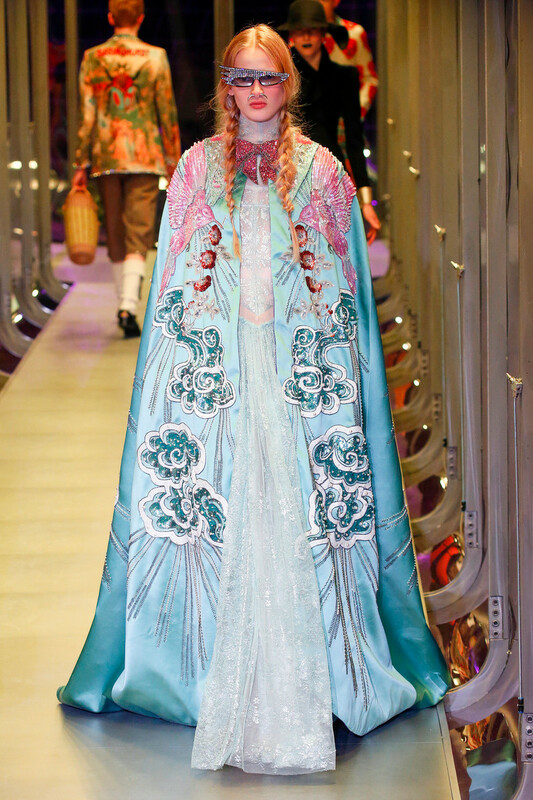 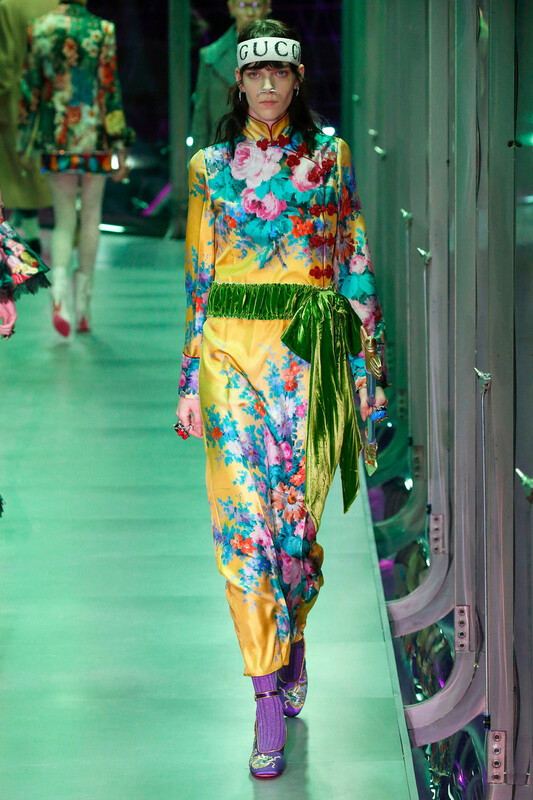 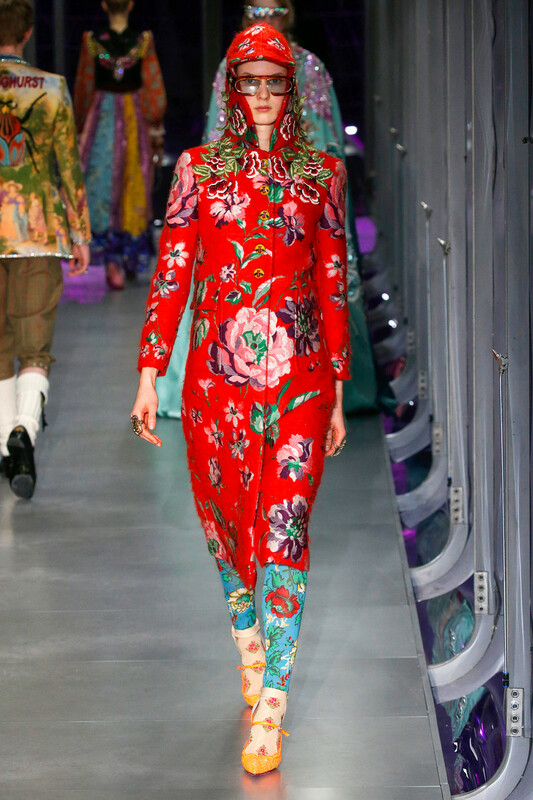 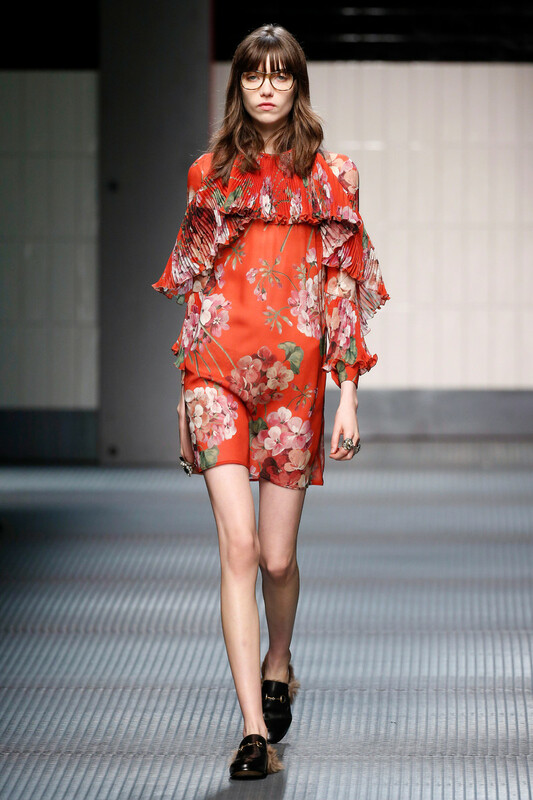 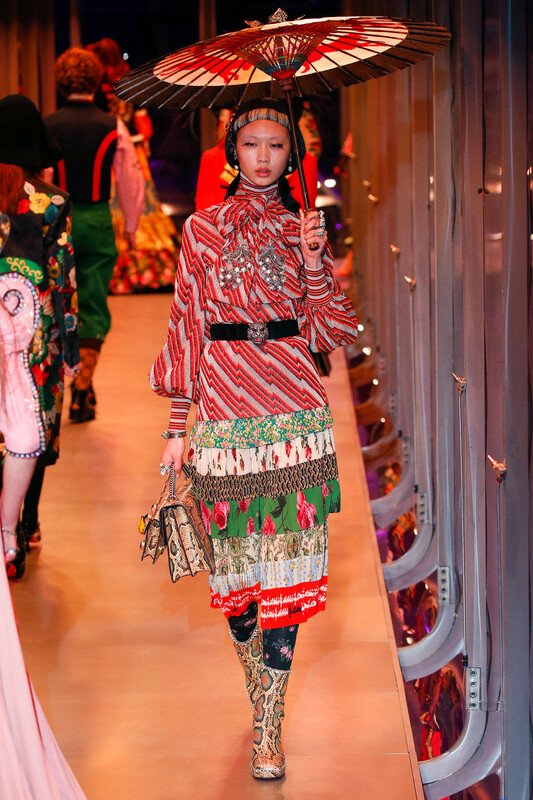 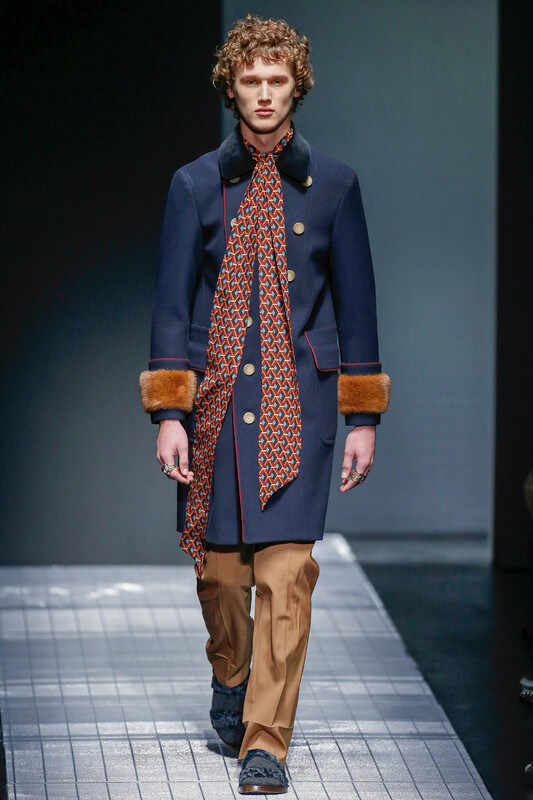 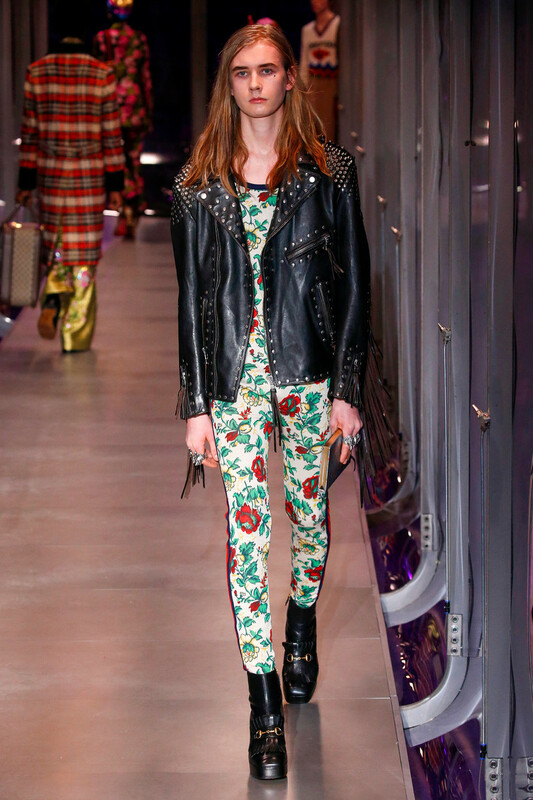 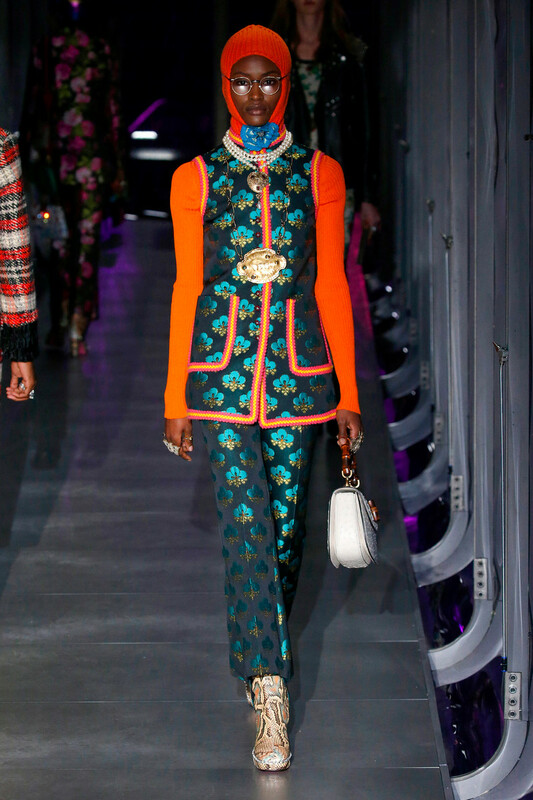 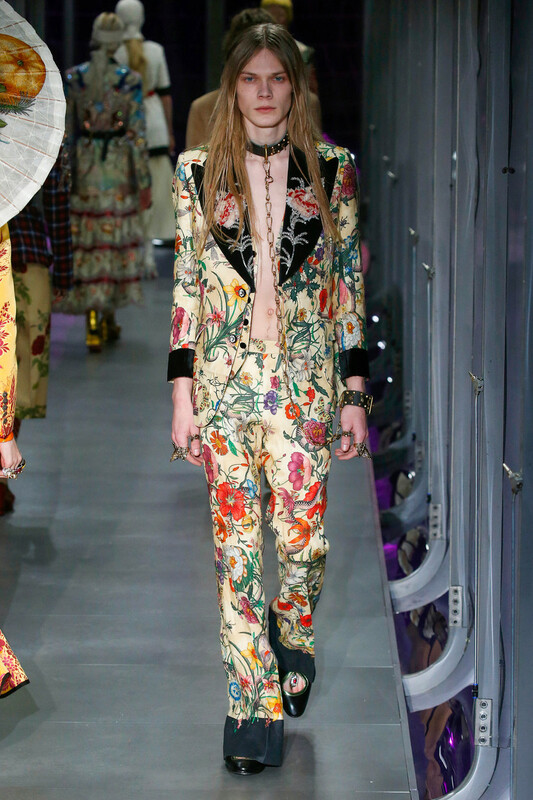 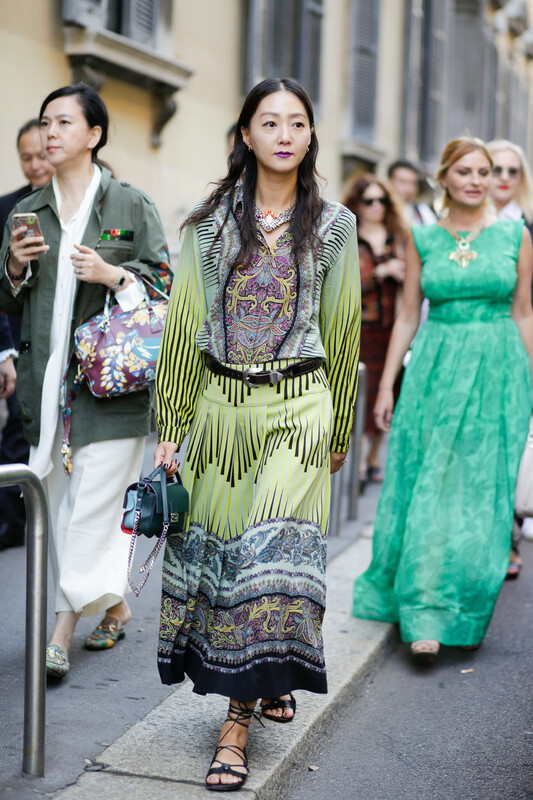 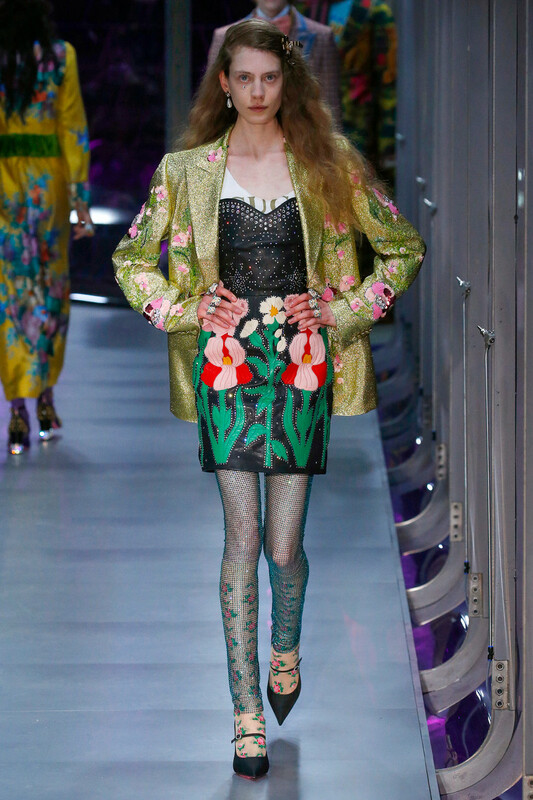 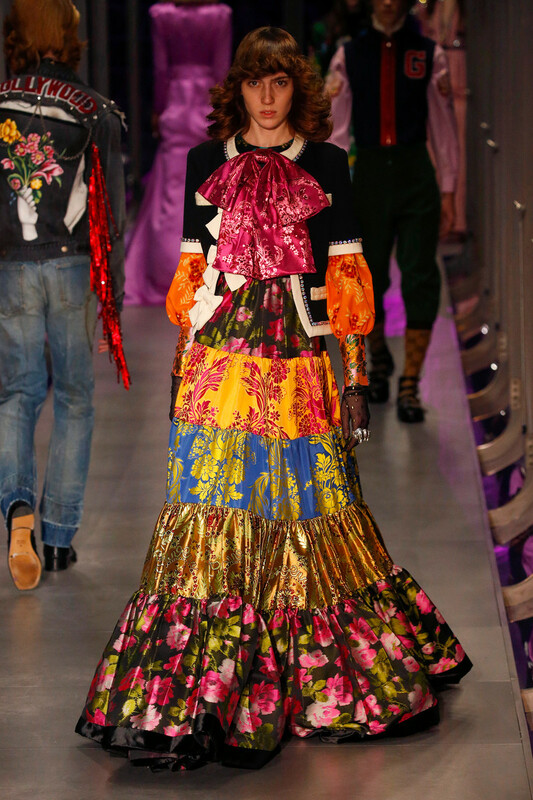 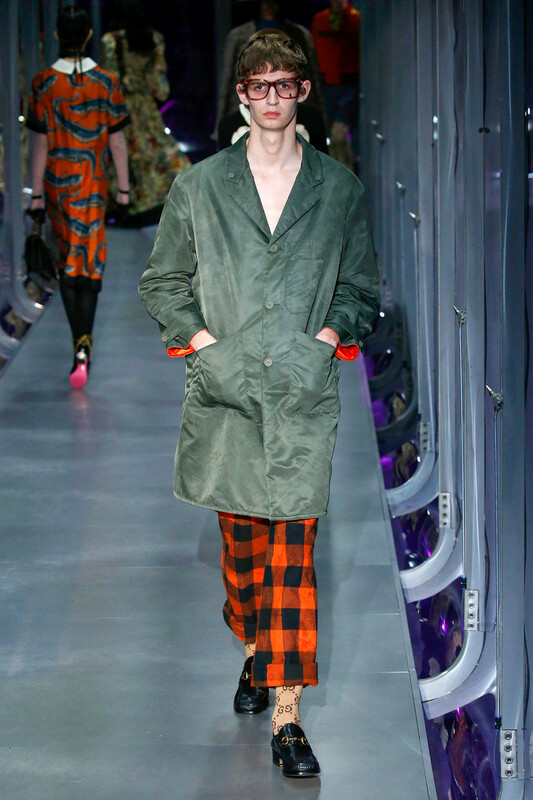 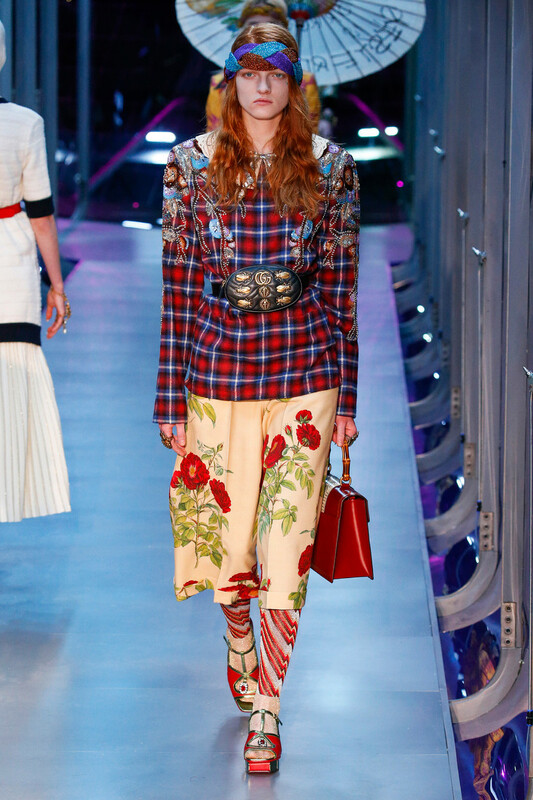 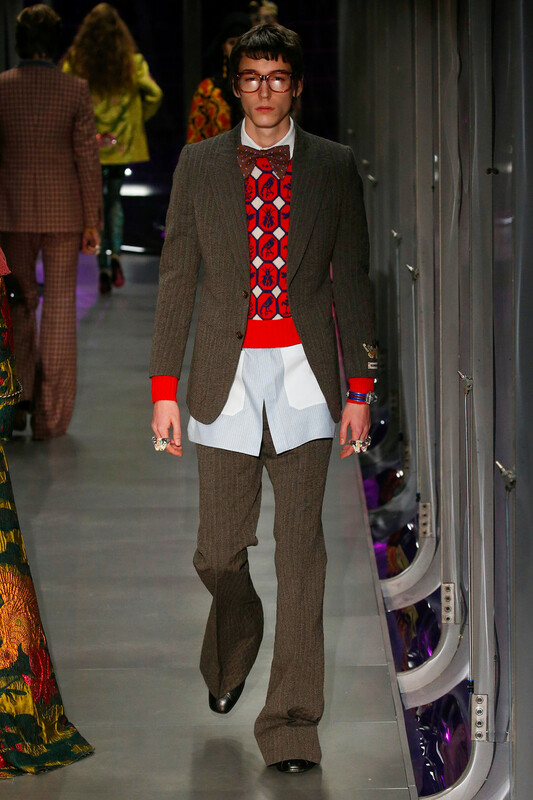 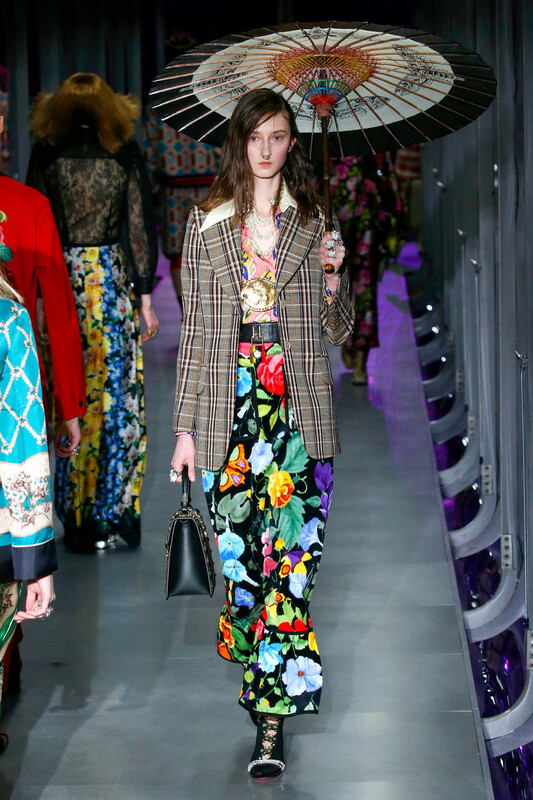 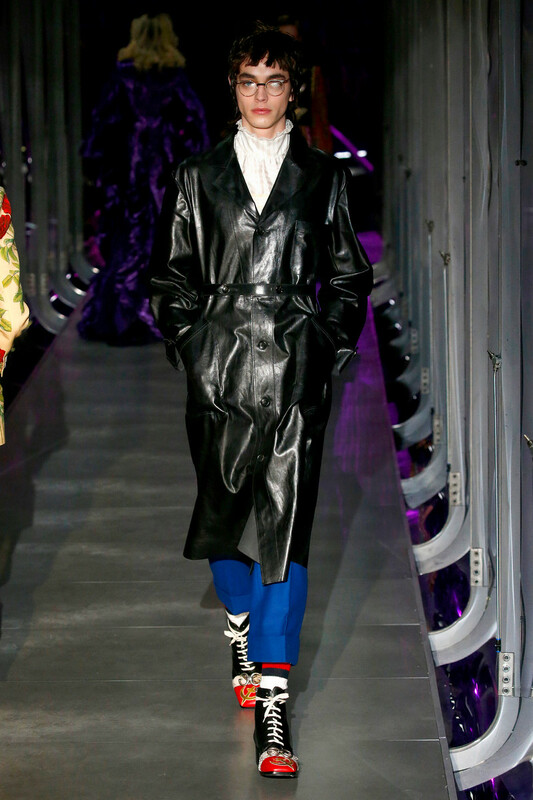 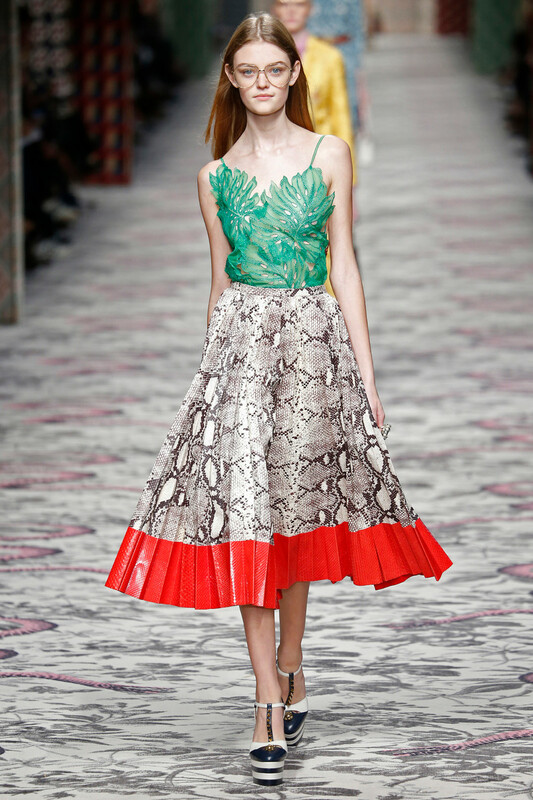 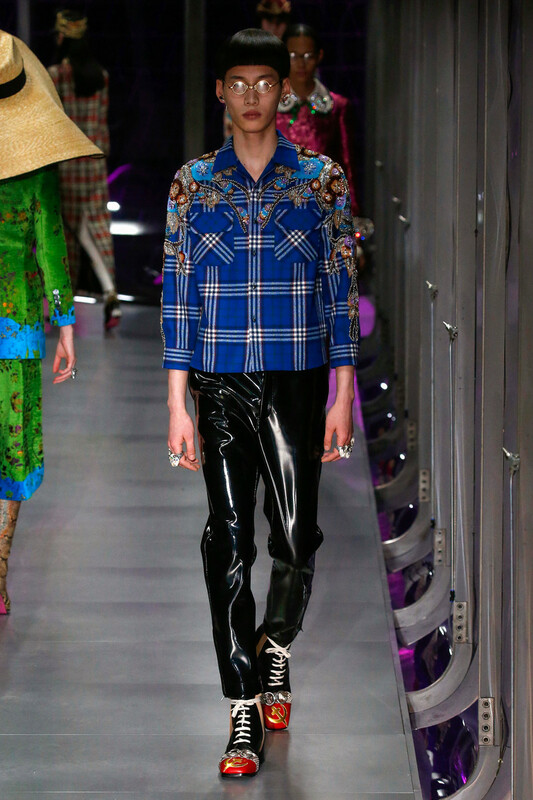 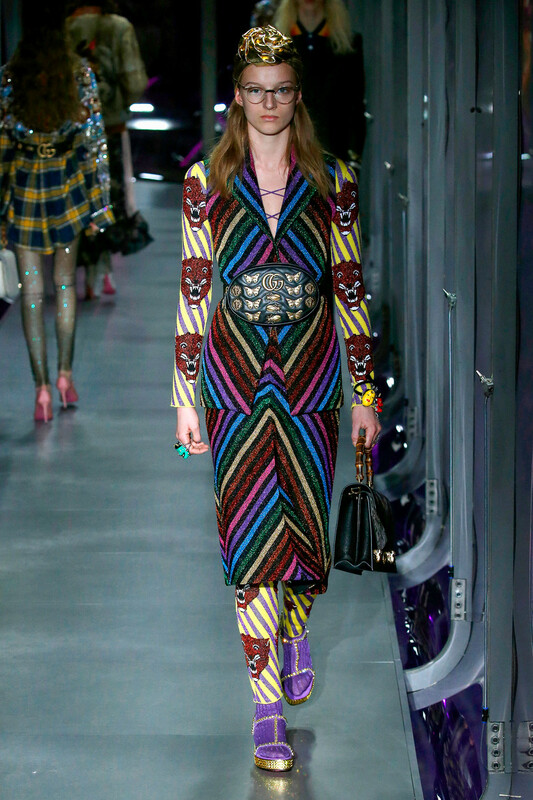 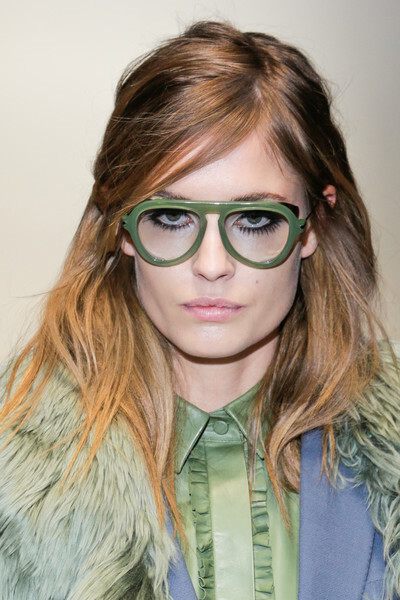 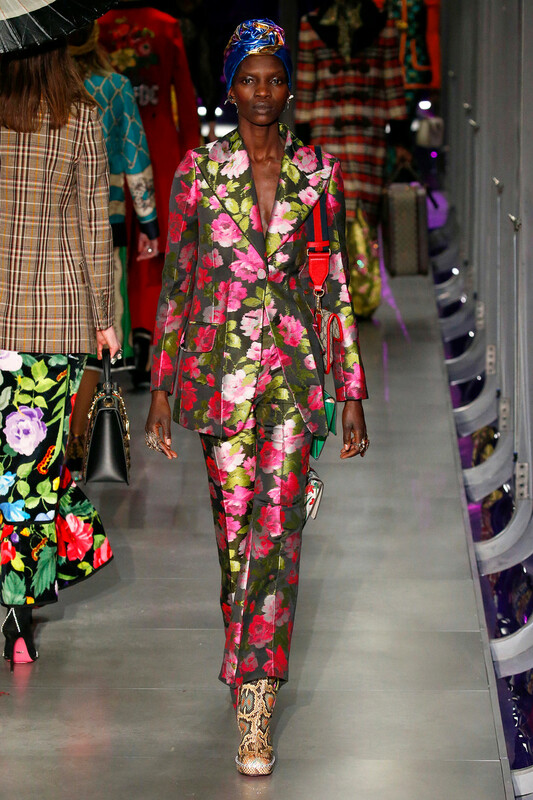 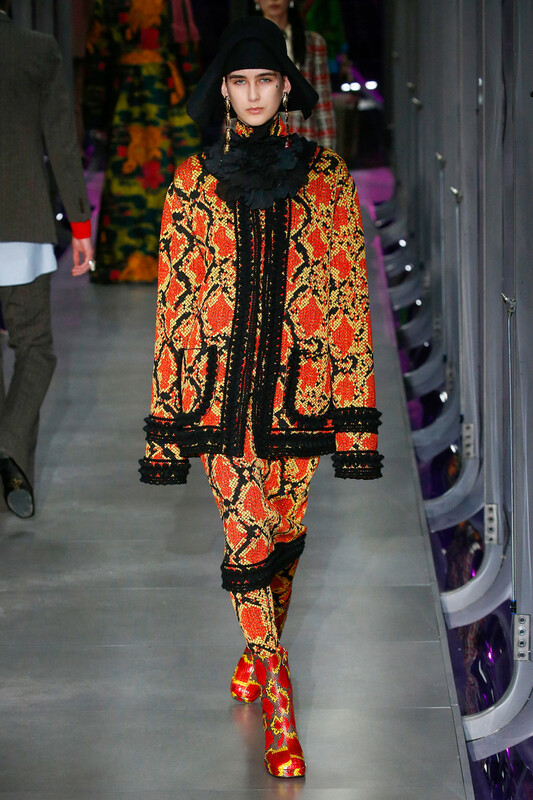 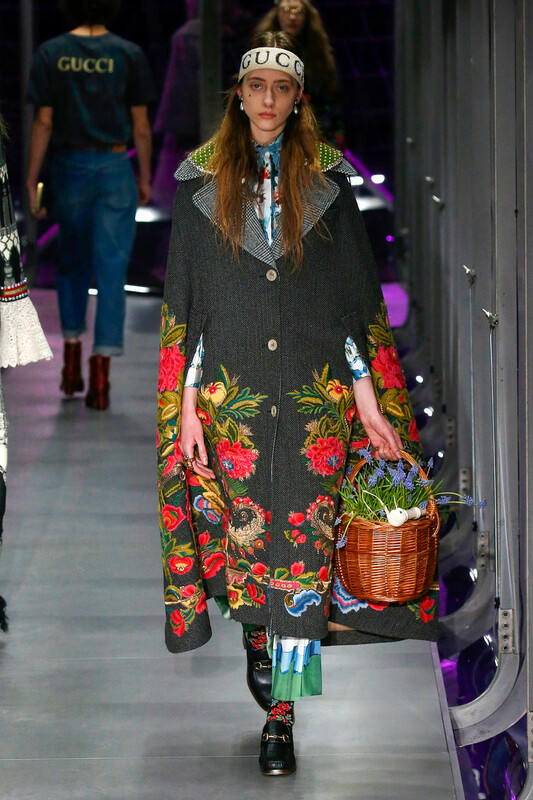 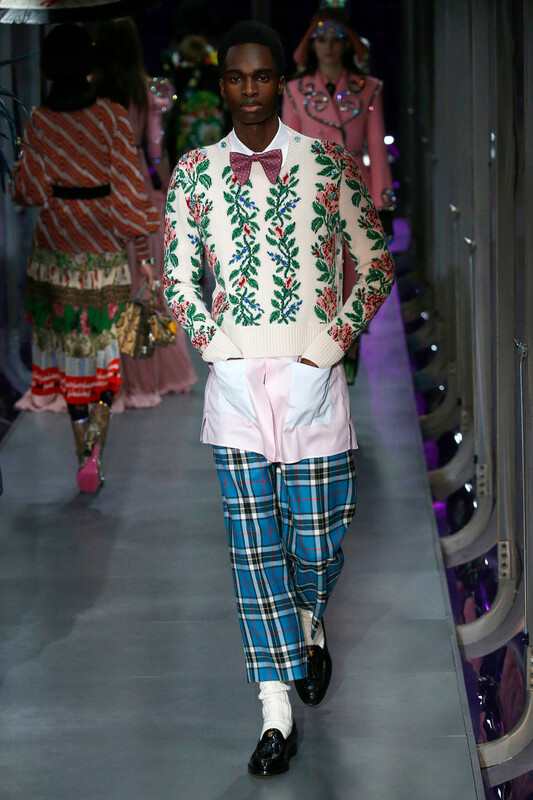 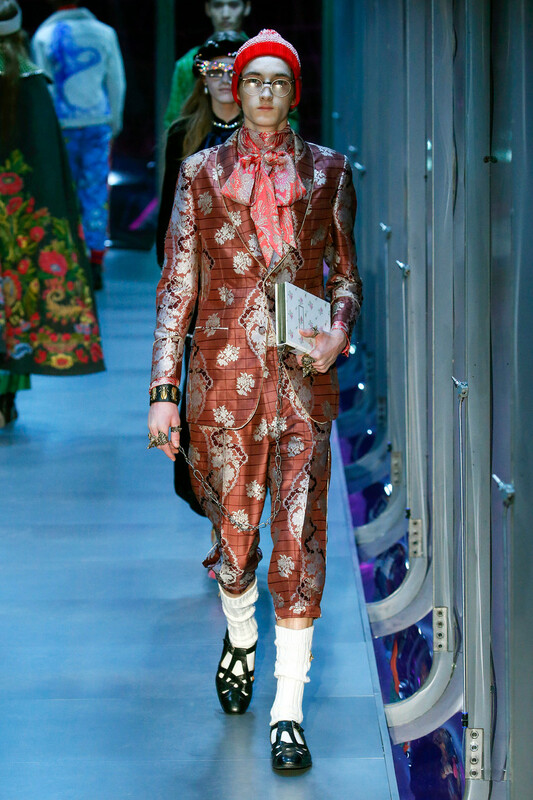 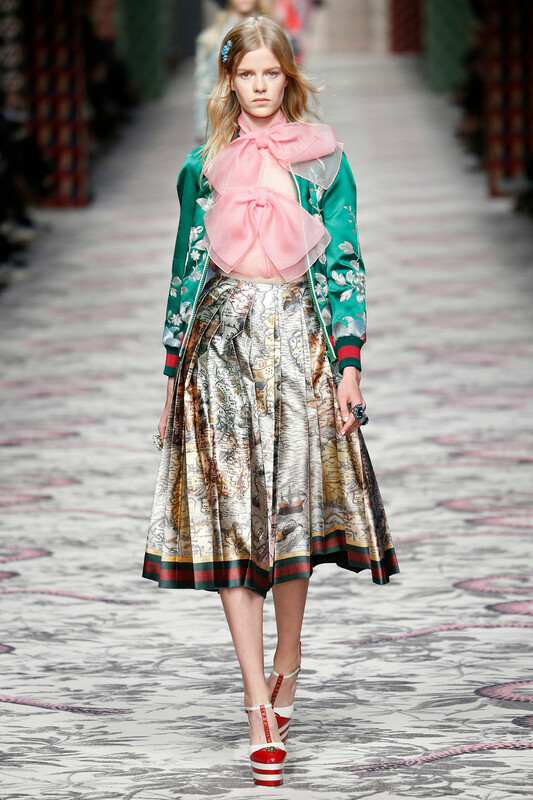 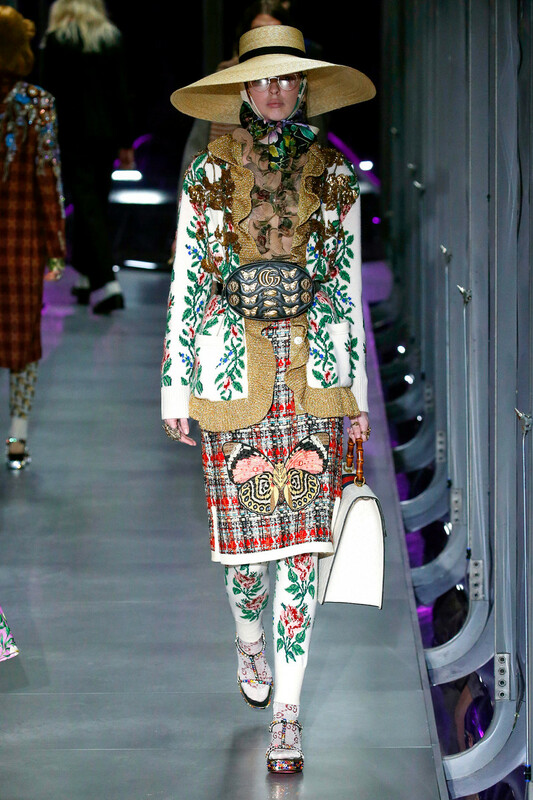 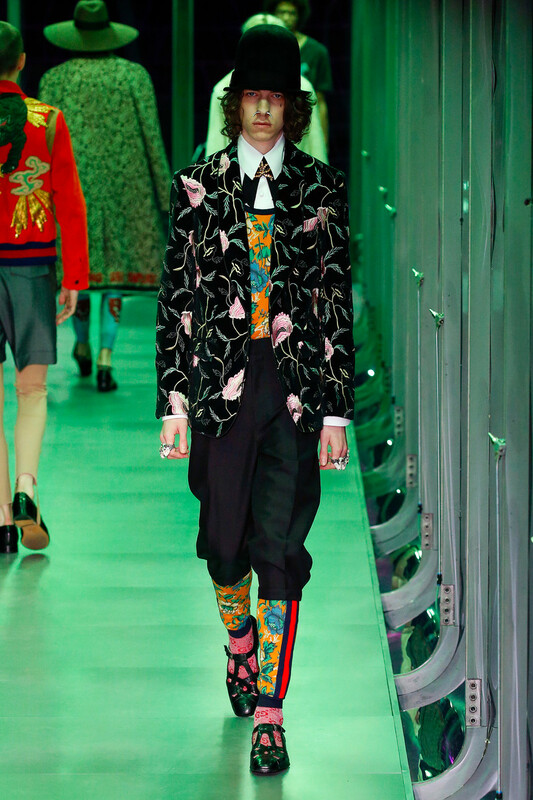 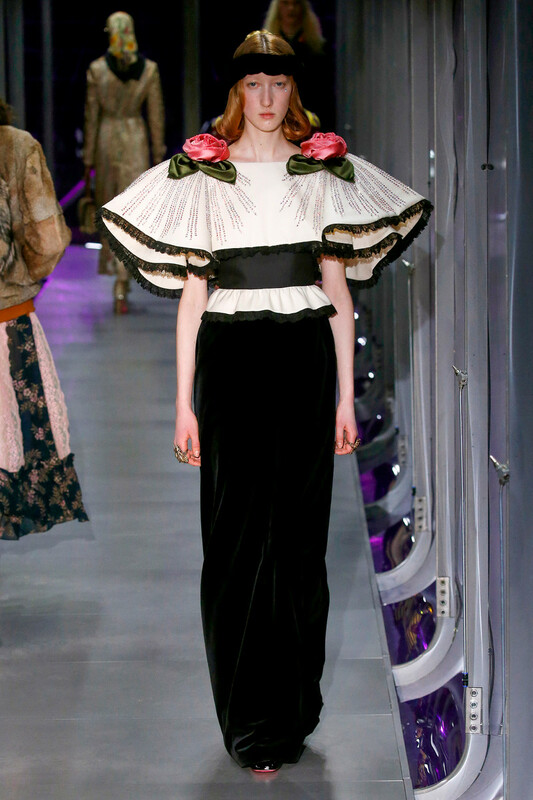 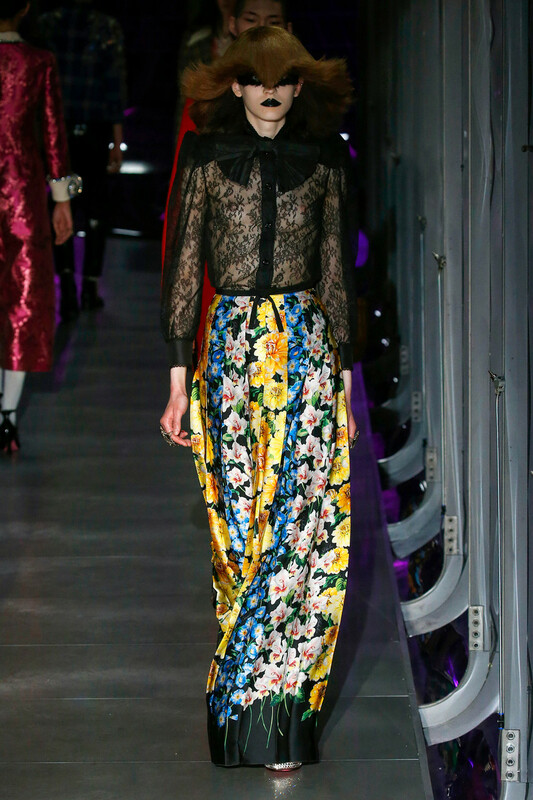 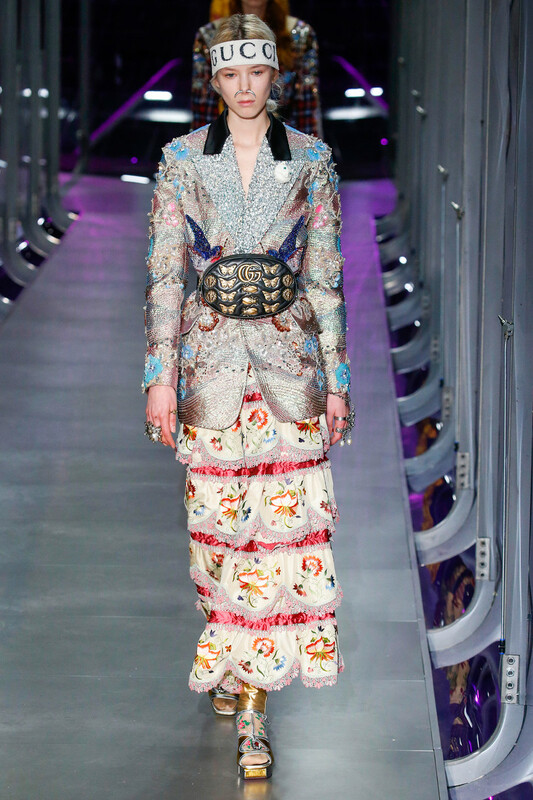 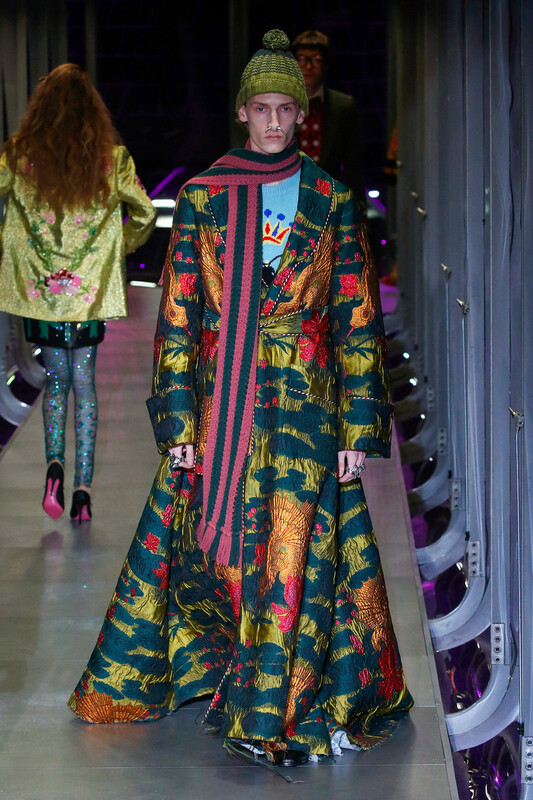 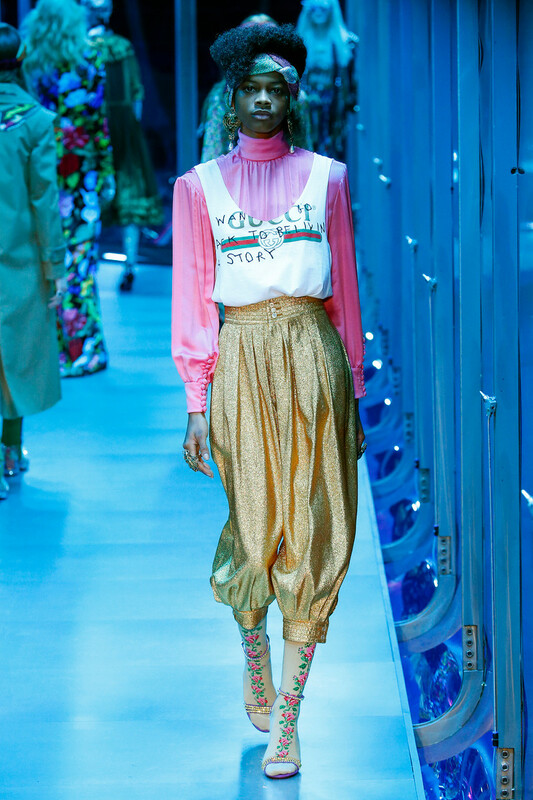 Looks were hardly appealing, but the Gucci team showed it dares to take risks. 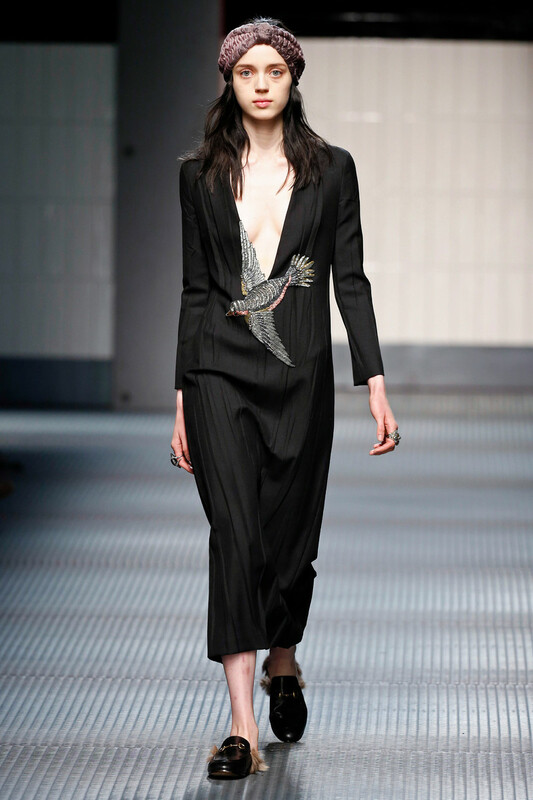 If this show was a point of departure, we’re on the edge or our seat next presentation. 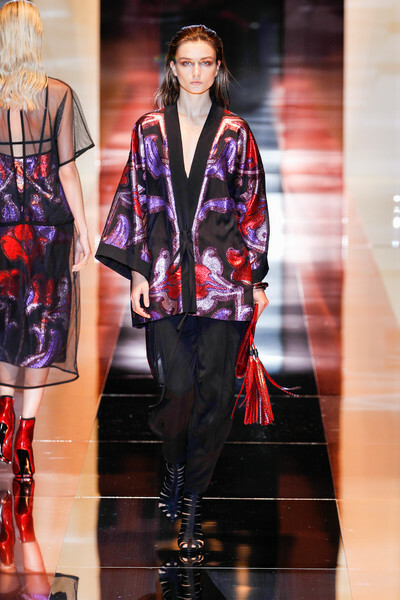 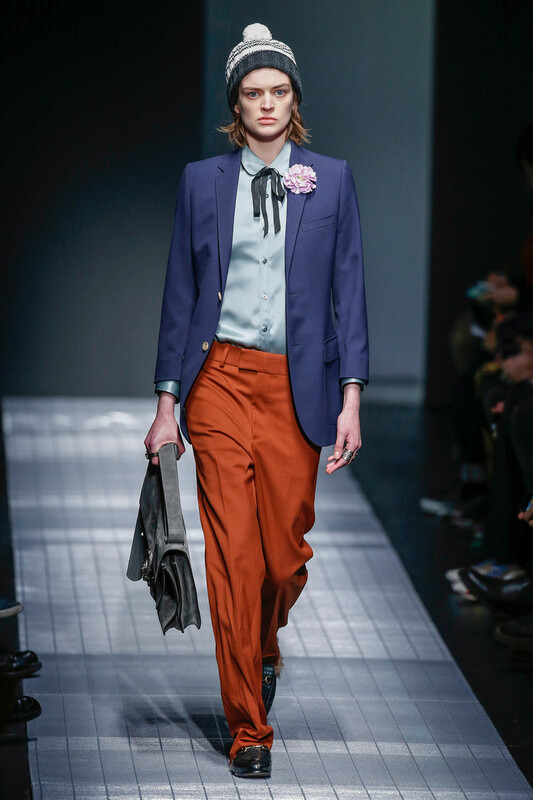 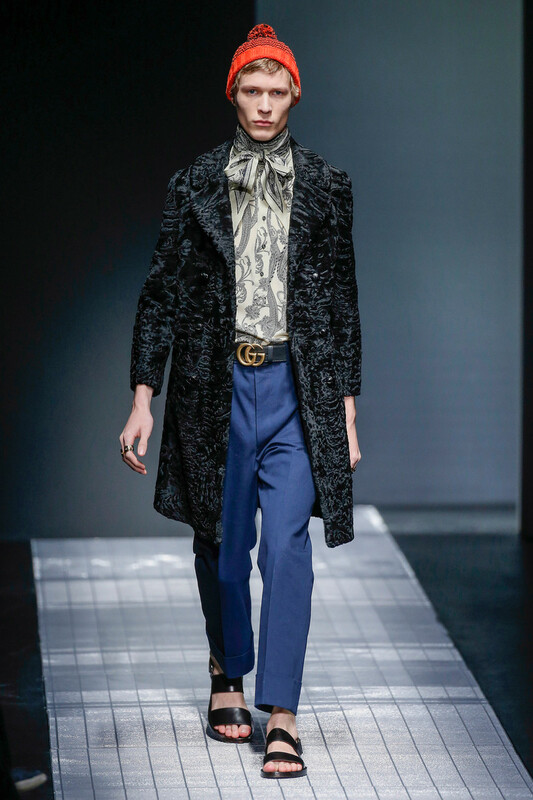 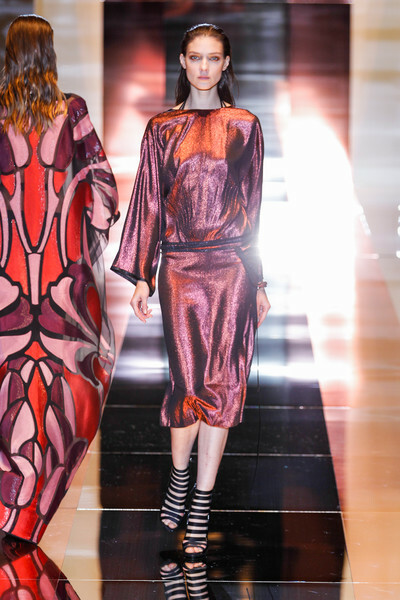 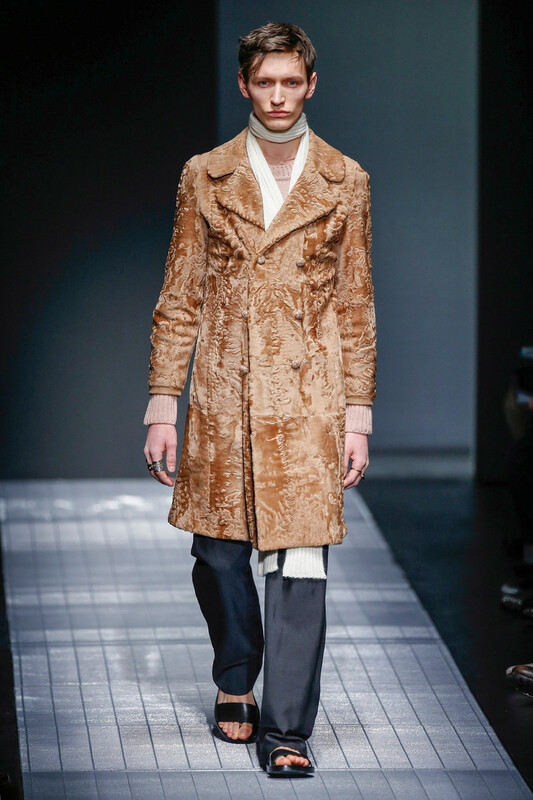 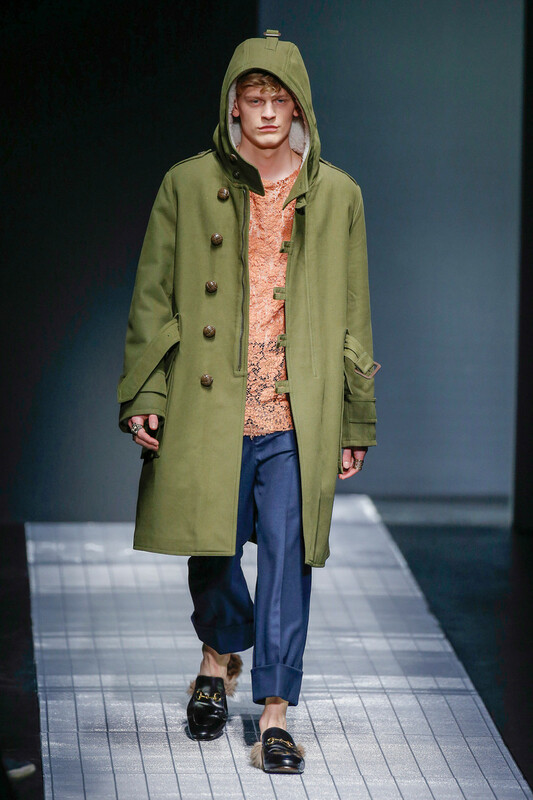 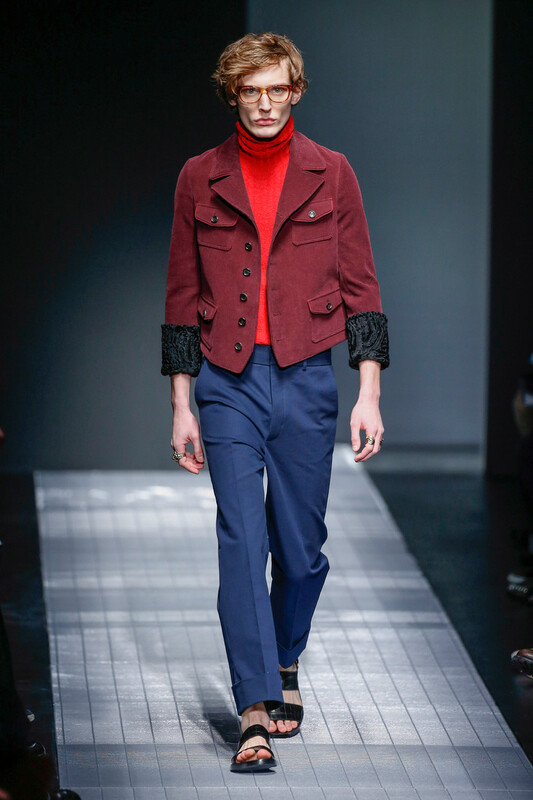 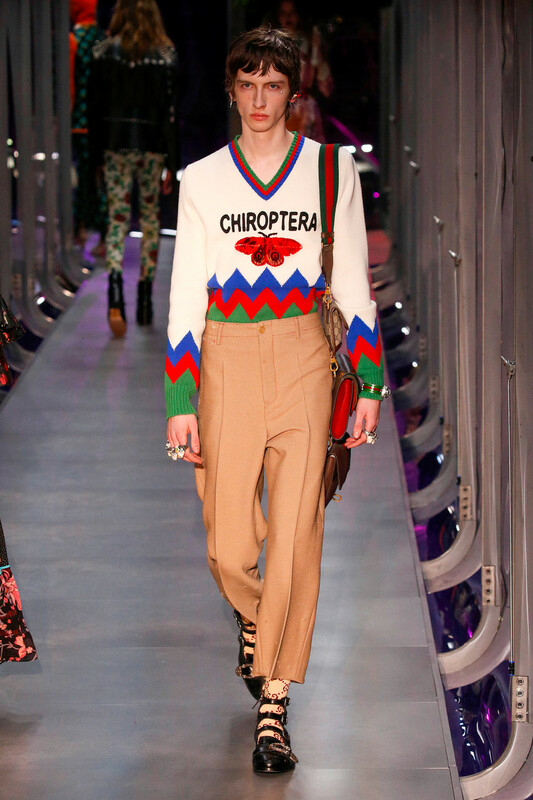 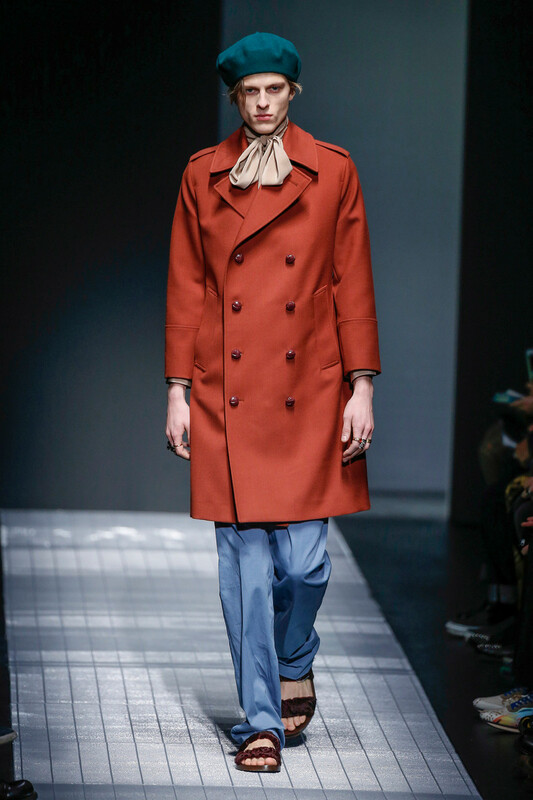 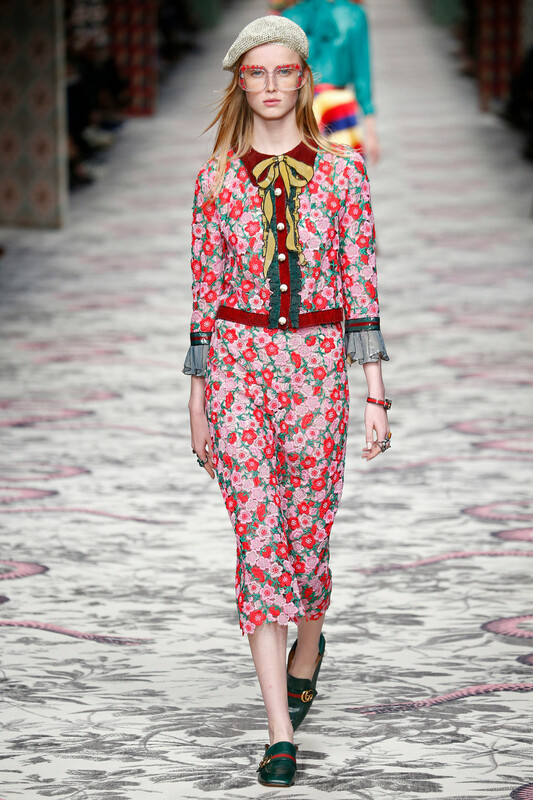 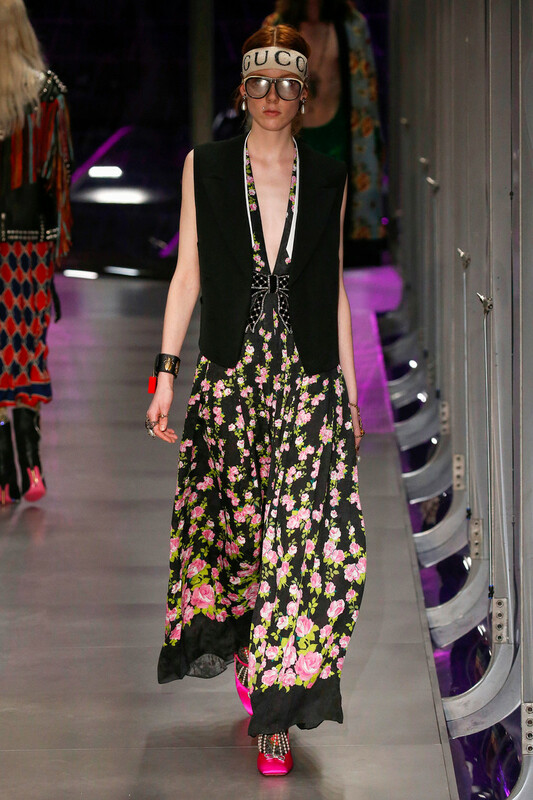 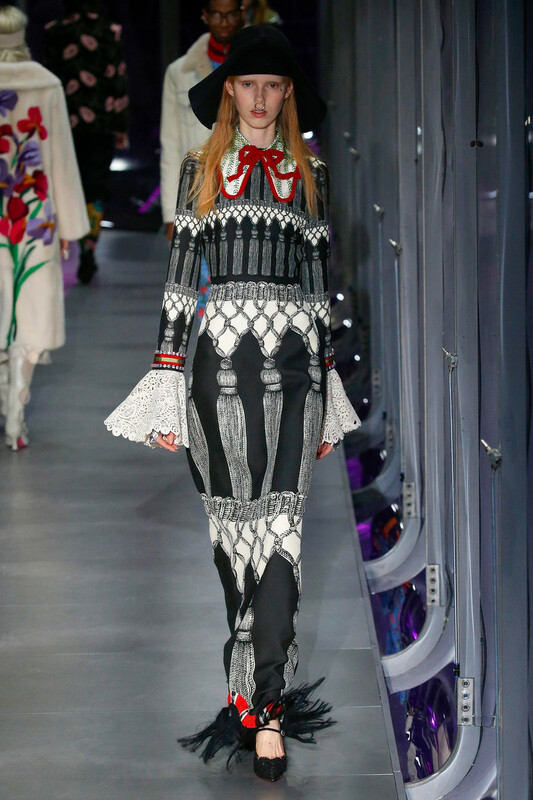 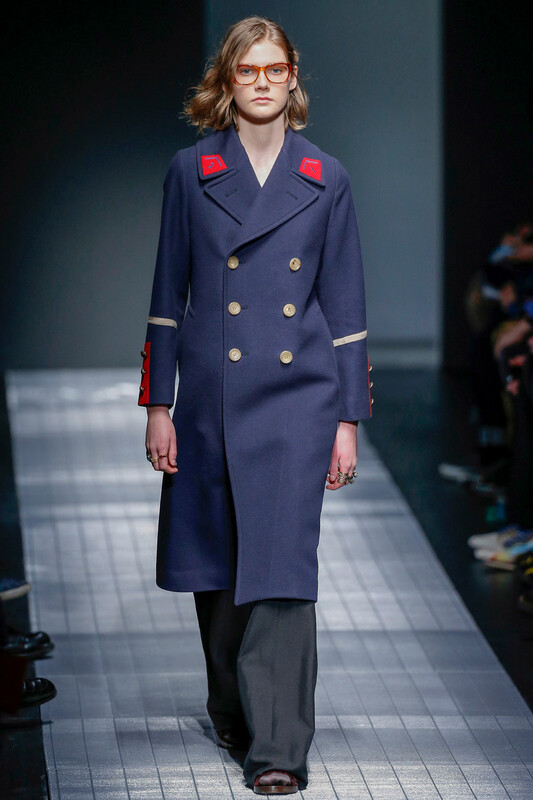 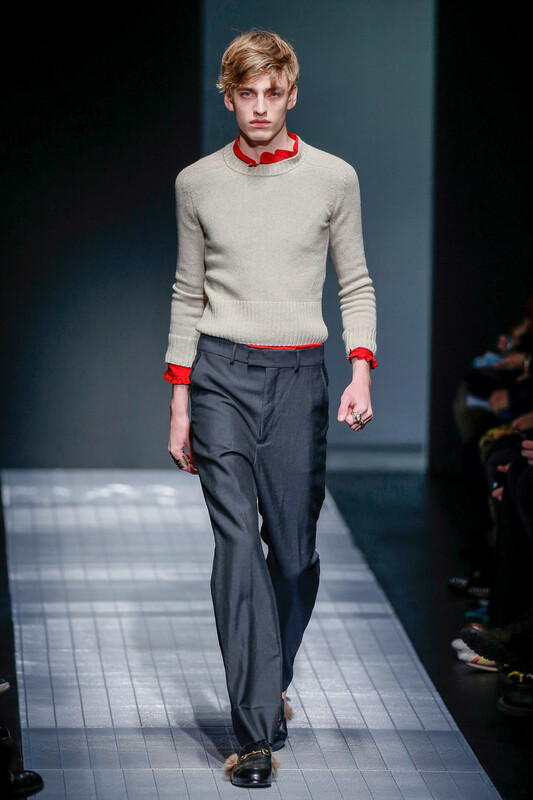 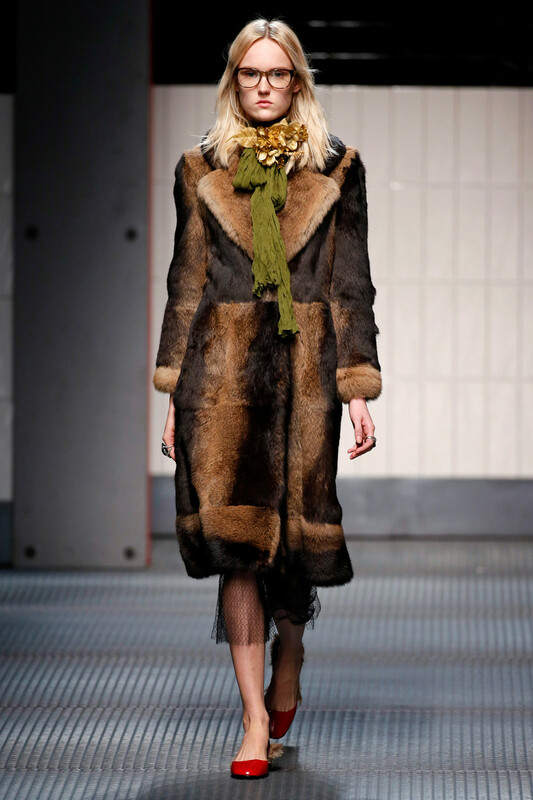 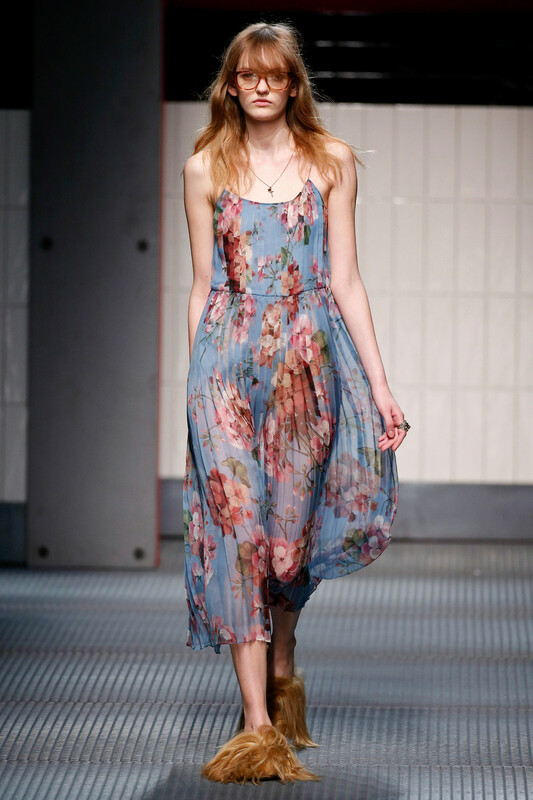 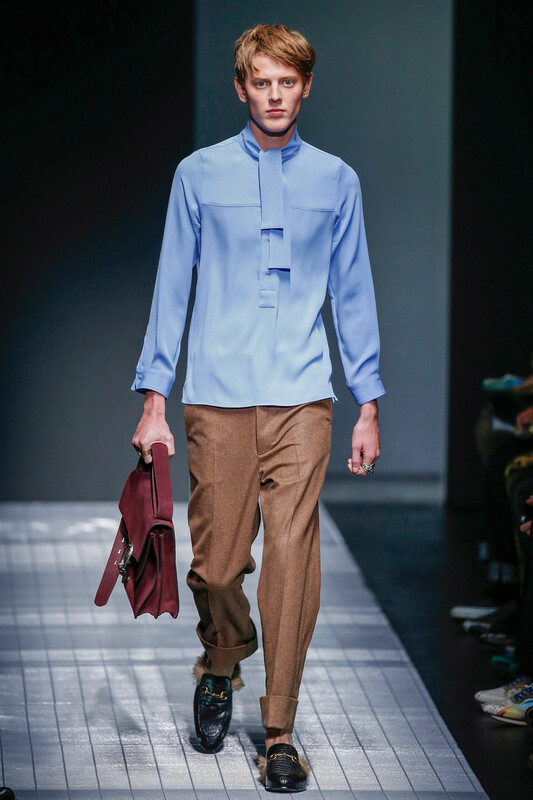 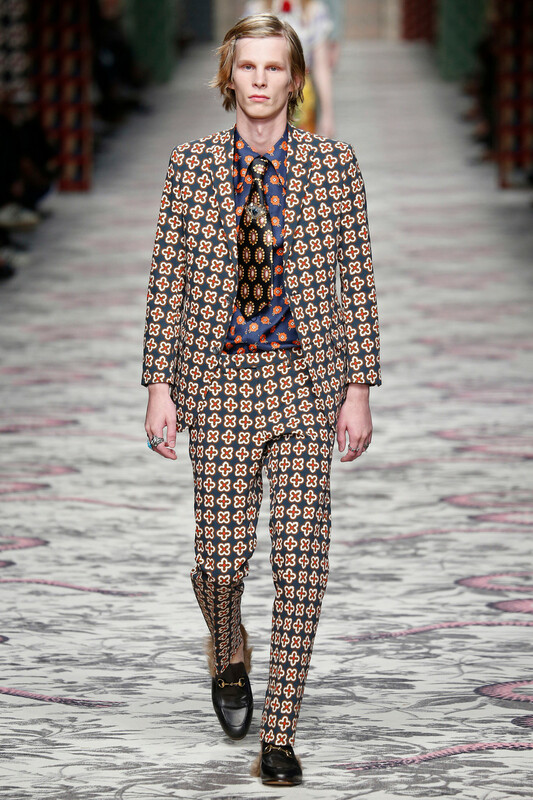 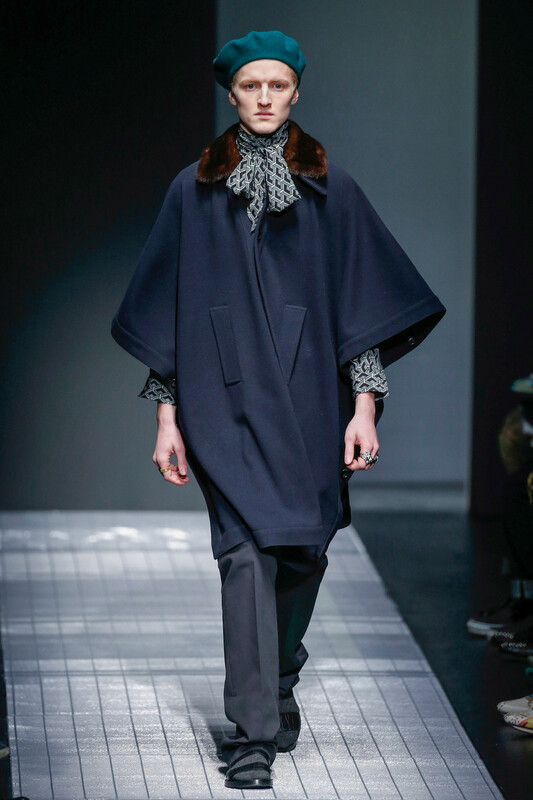 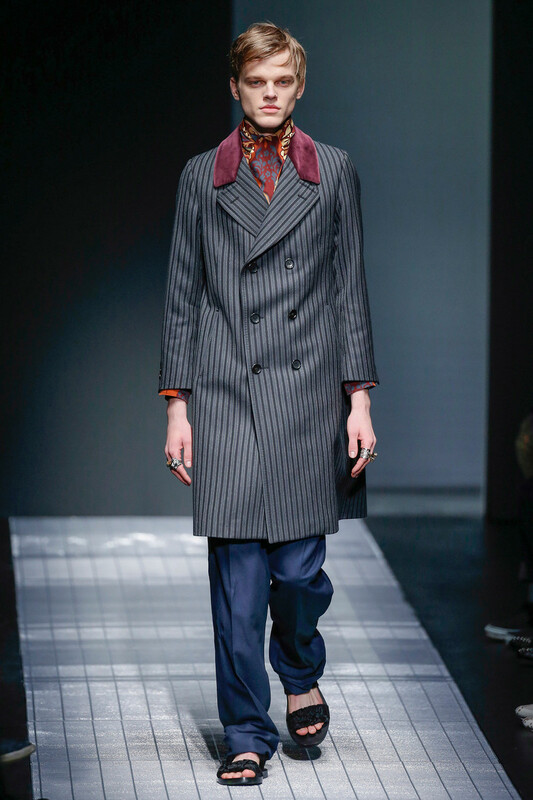 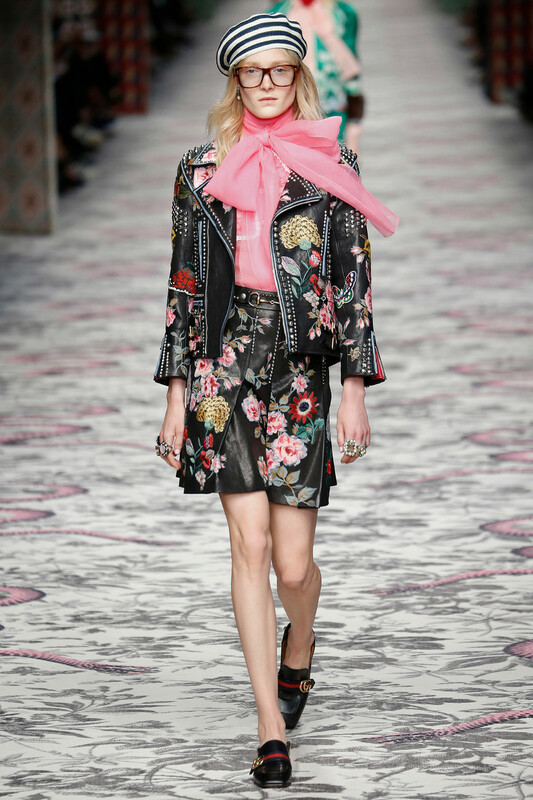 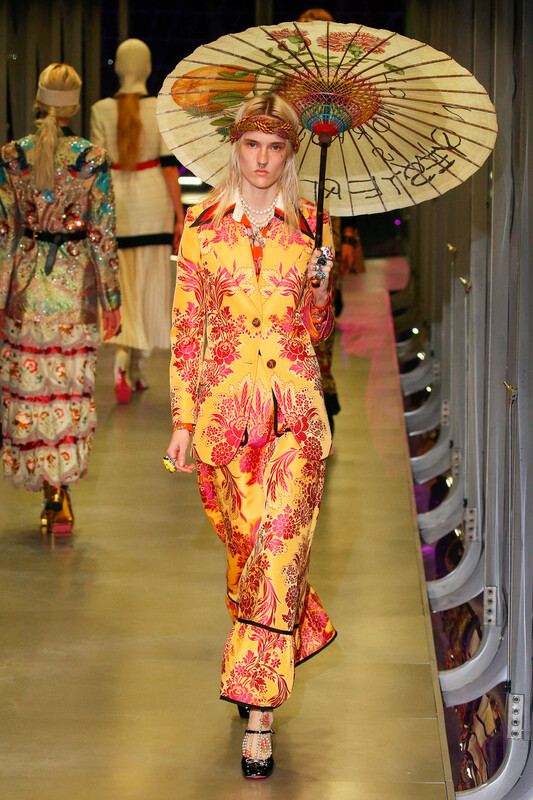 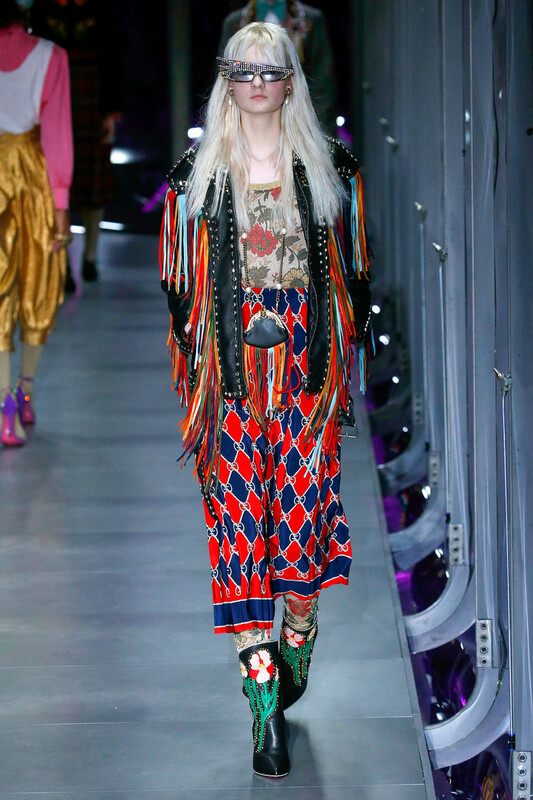 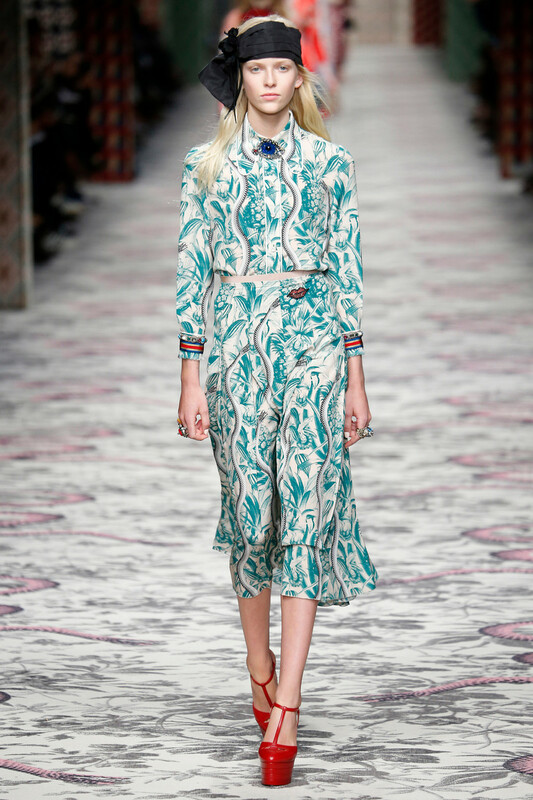 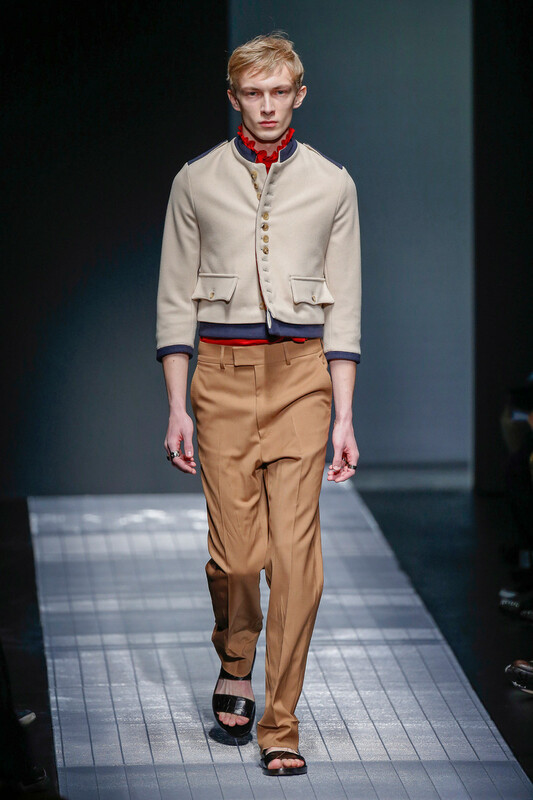 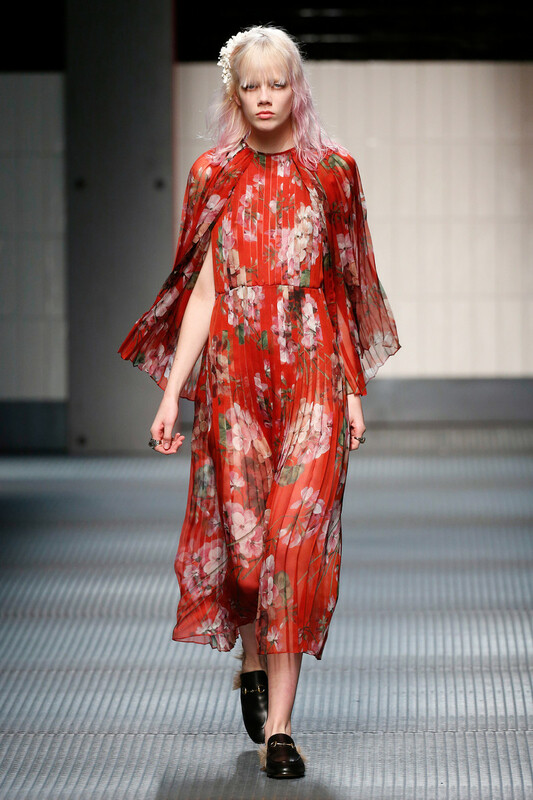 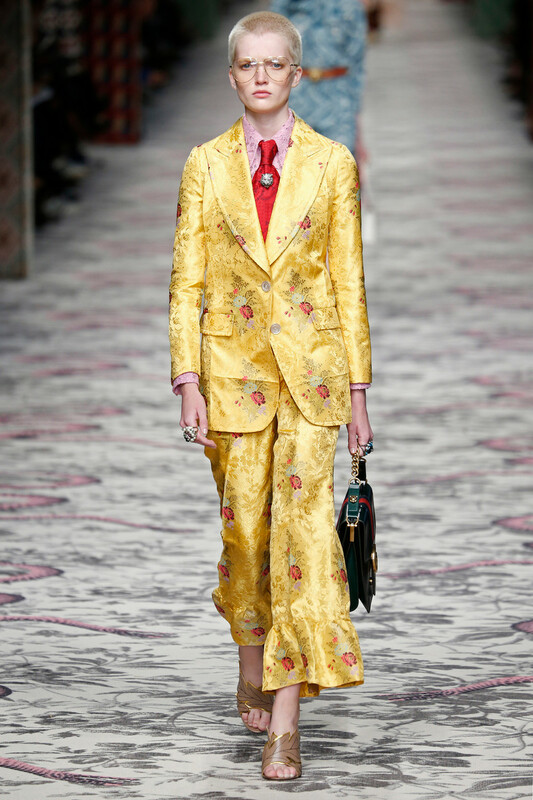 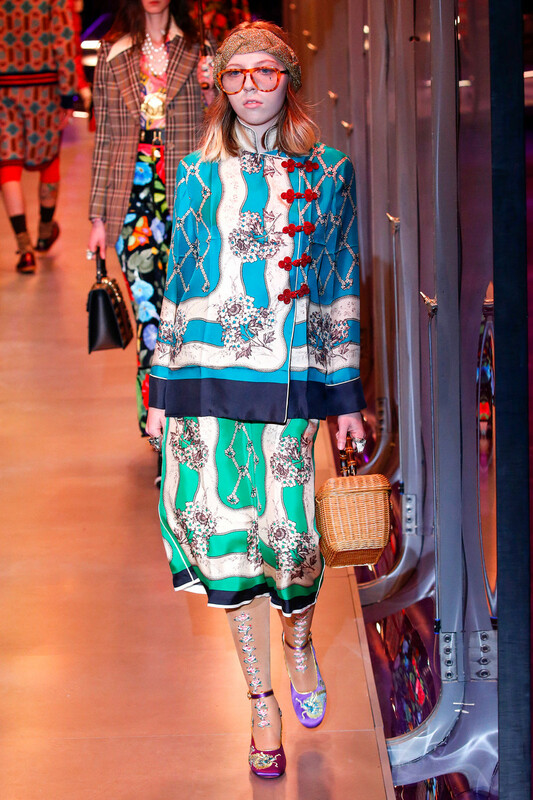 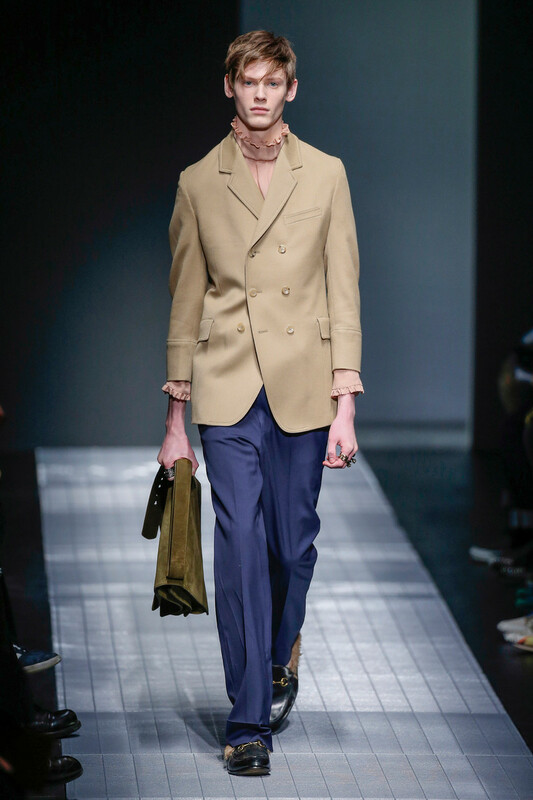 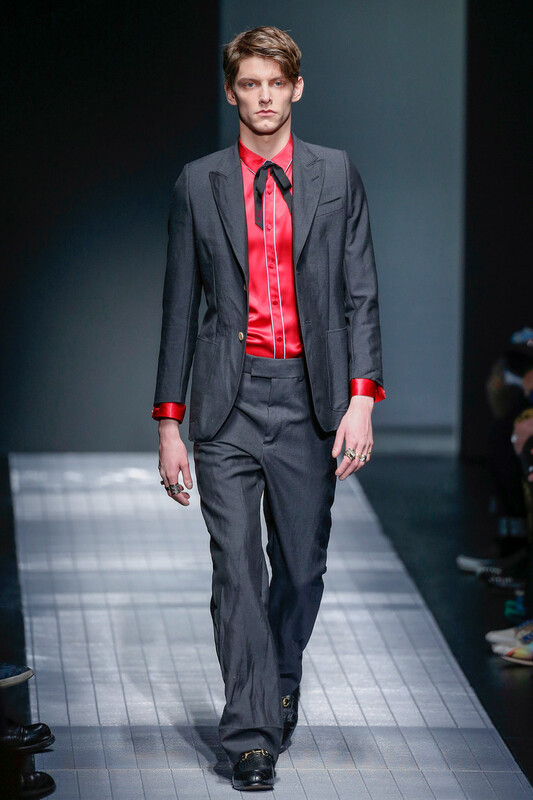 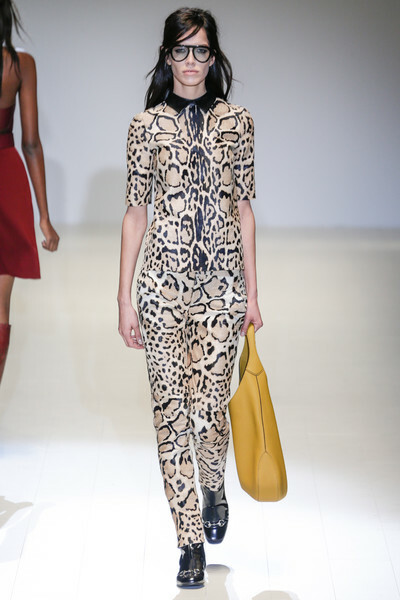 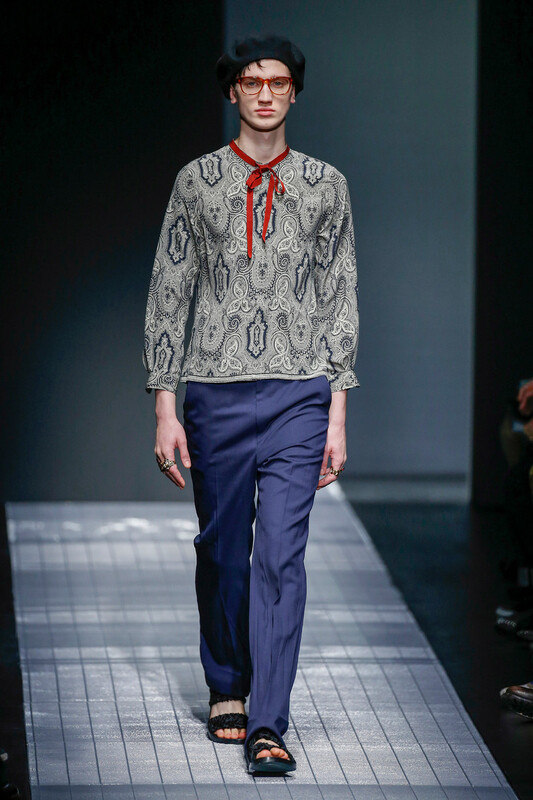 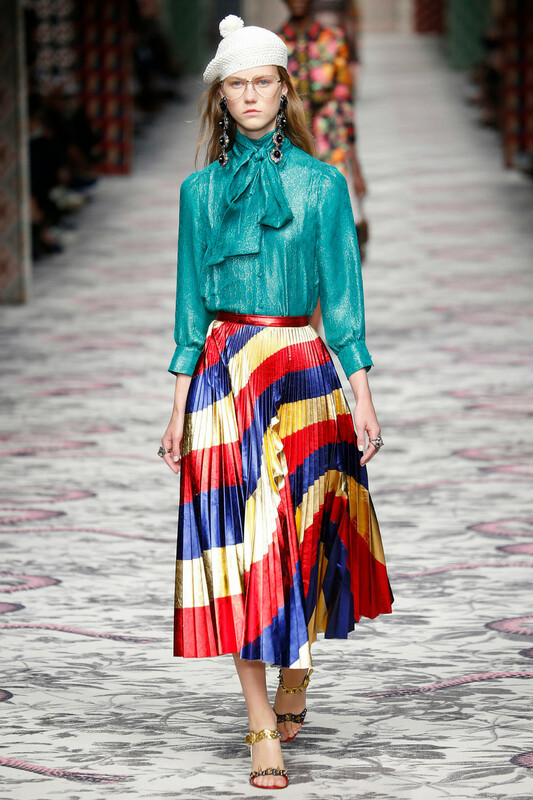 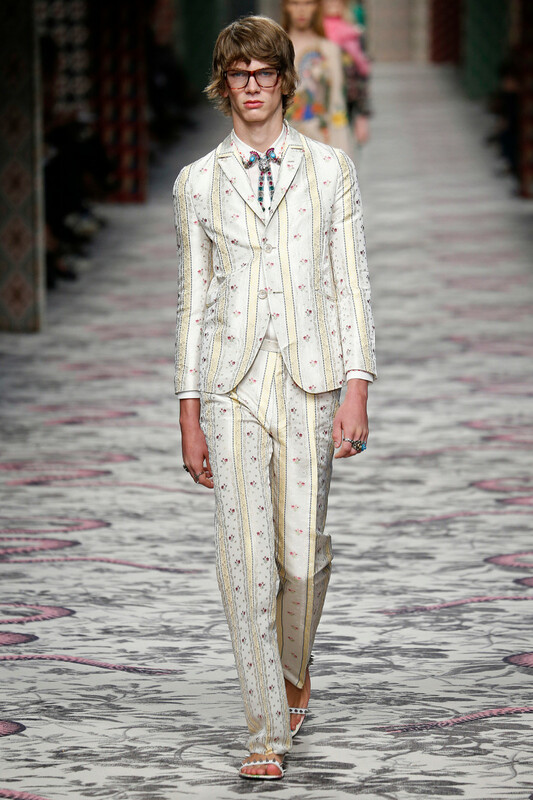 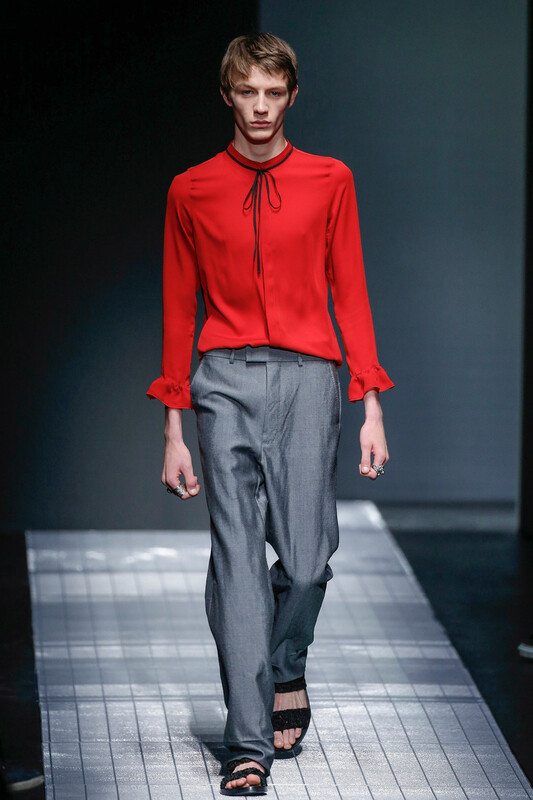 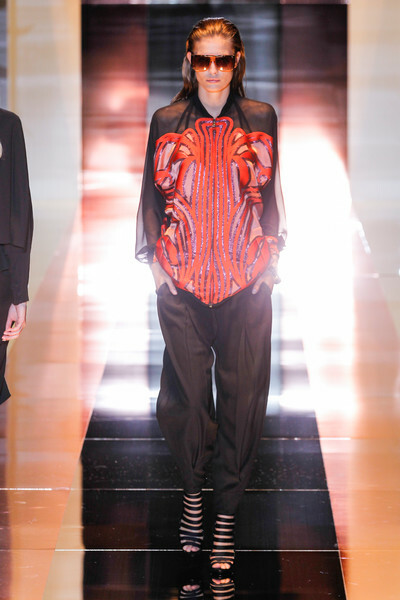 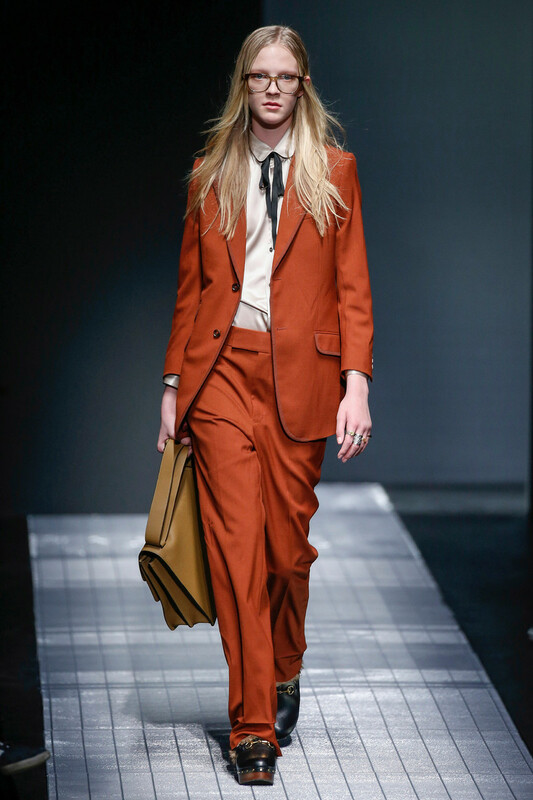 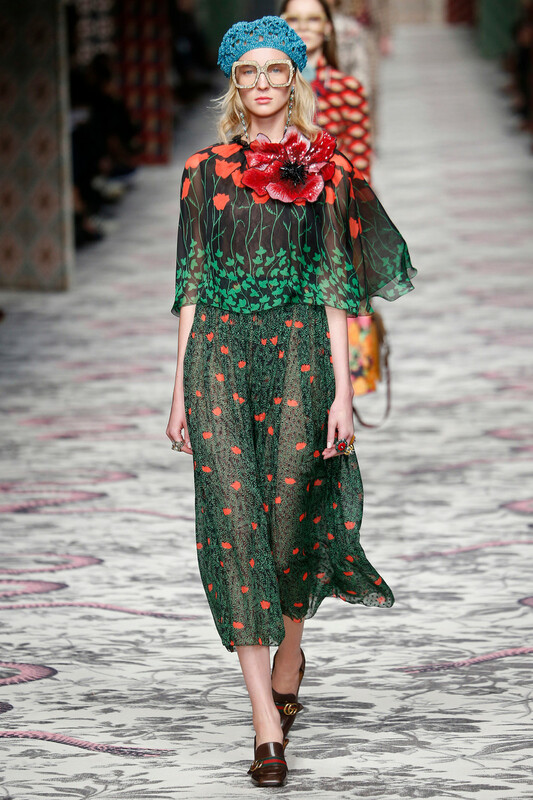 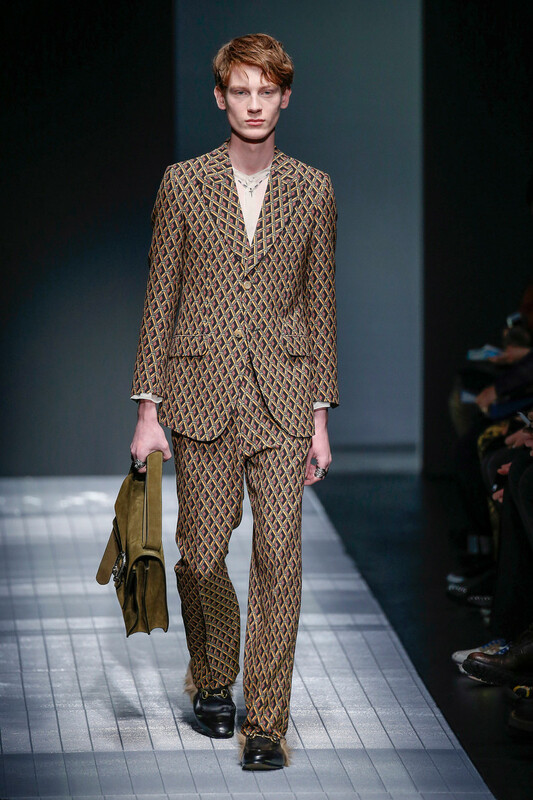 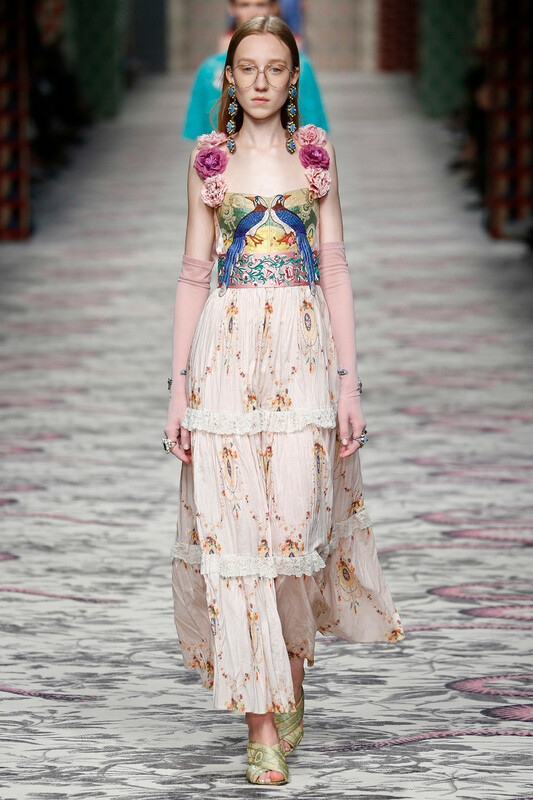 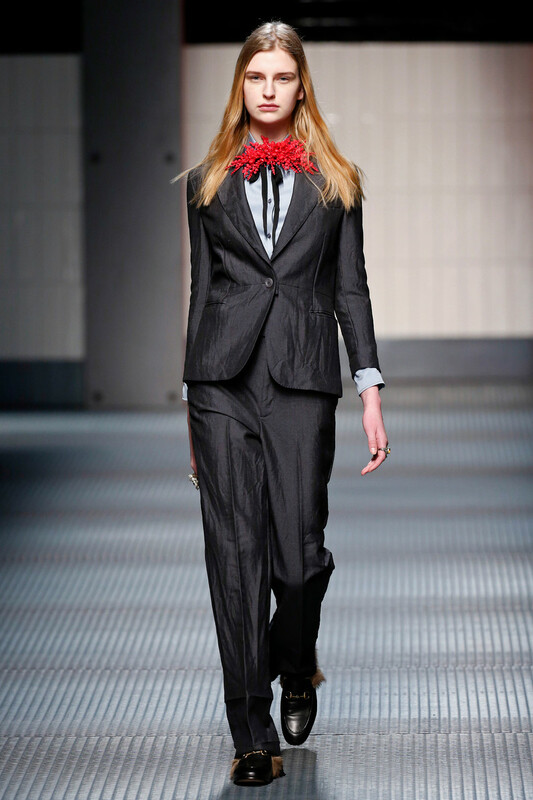 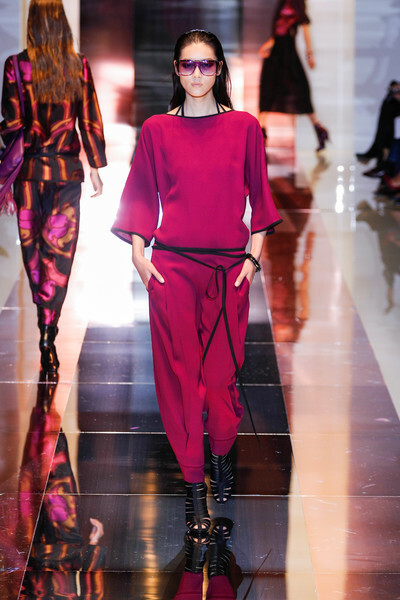 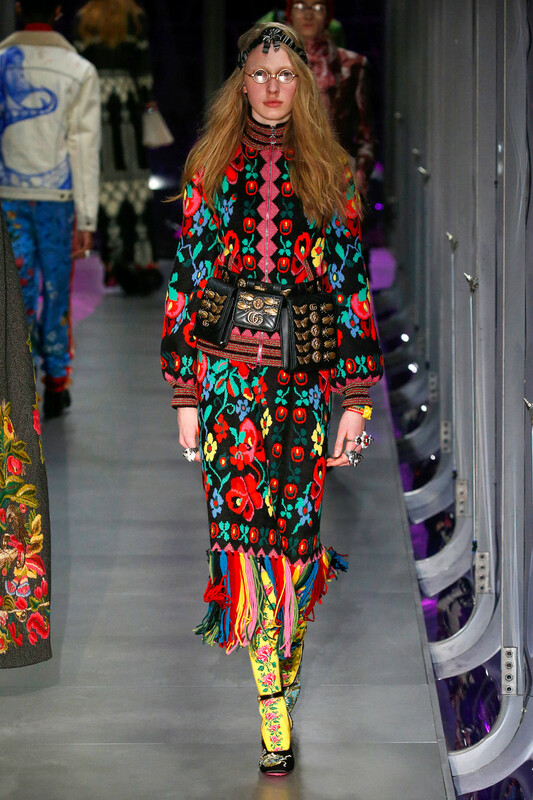 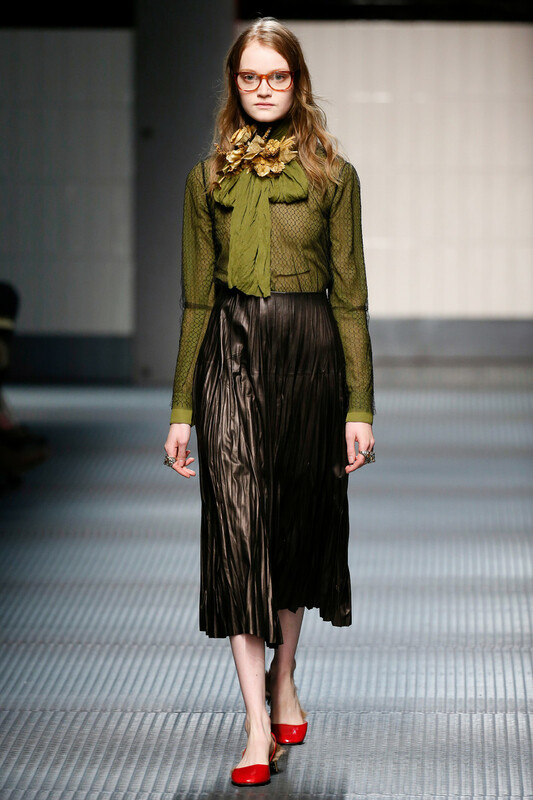 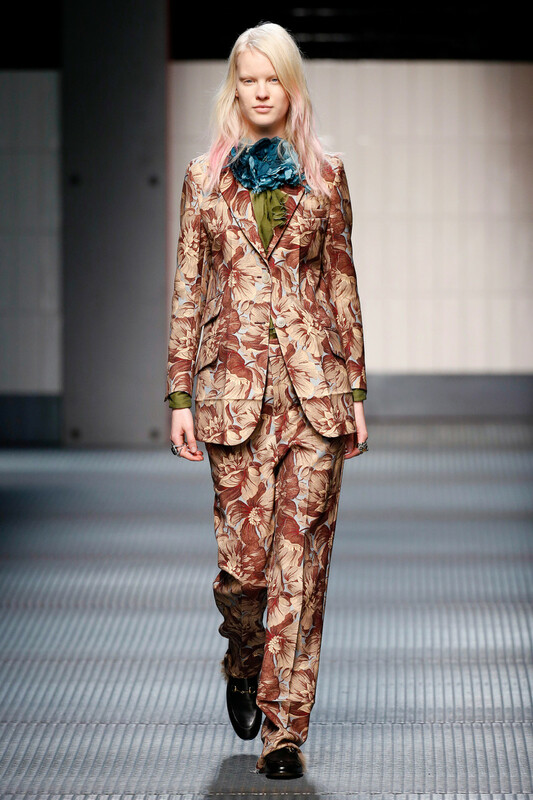 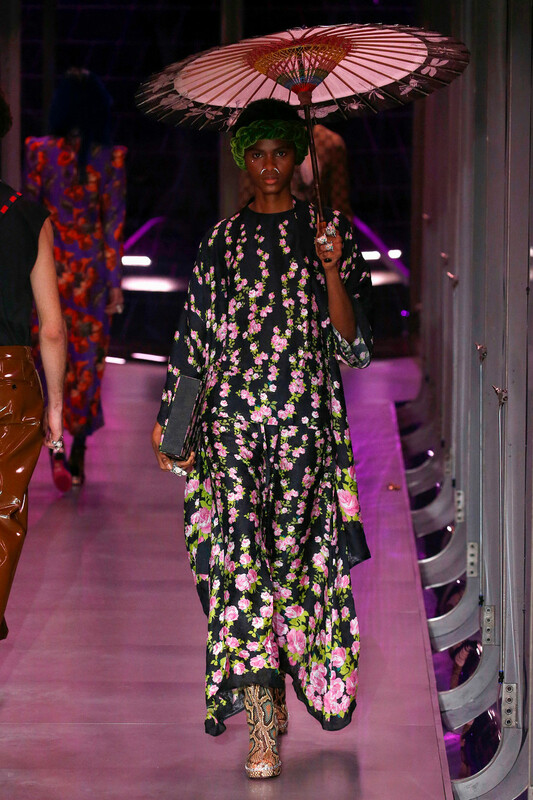 It was a smart Gucci-collection Frida Giannini presented at the start of Milan Fashion Week. 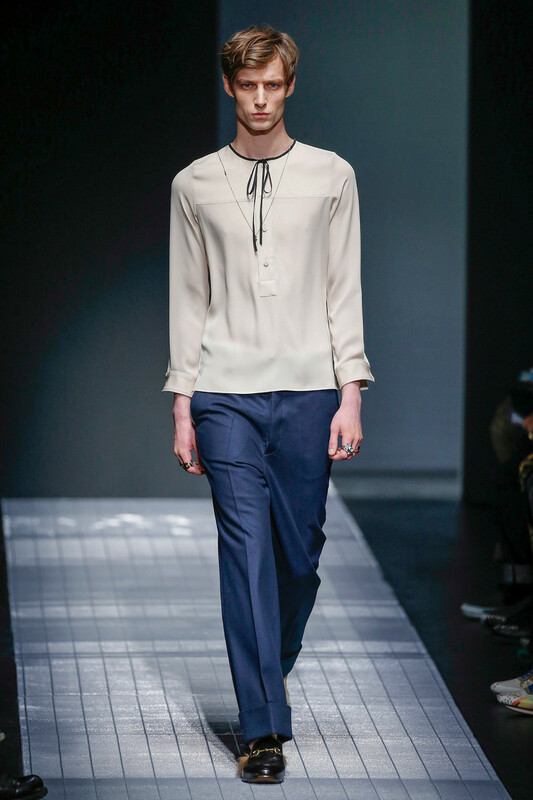 Plain and simple, functional chic with a dash of glamor. 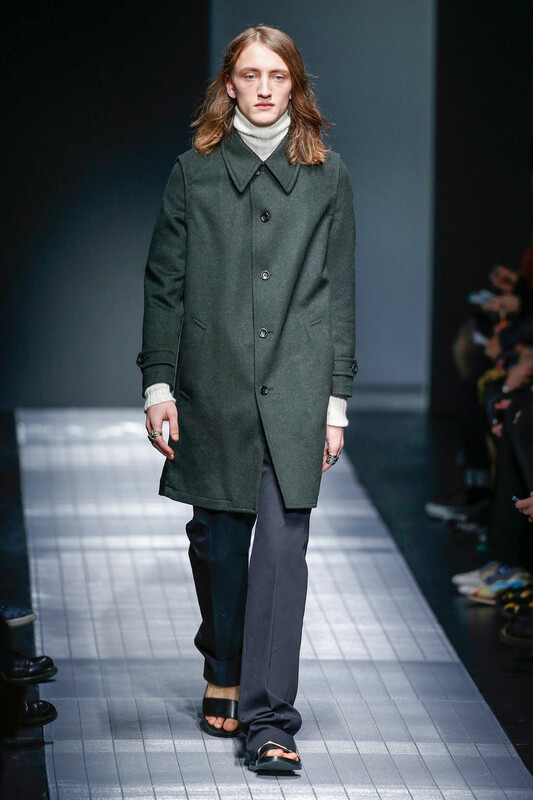 The FW14 collection seems rooted in sportswear infused with a Sixties vibe: crisp, precise shapes softened with a palette of pastels — pinks and beiges; dusty blues and greens. 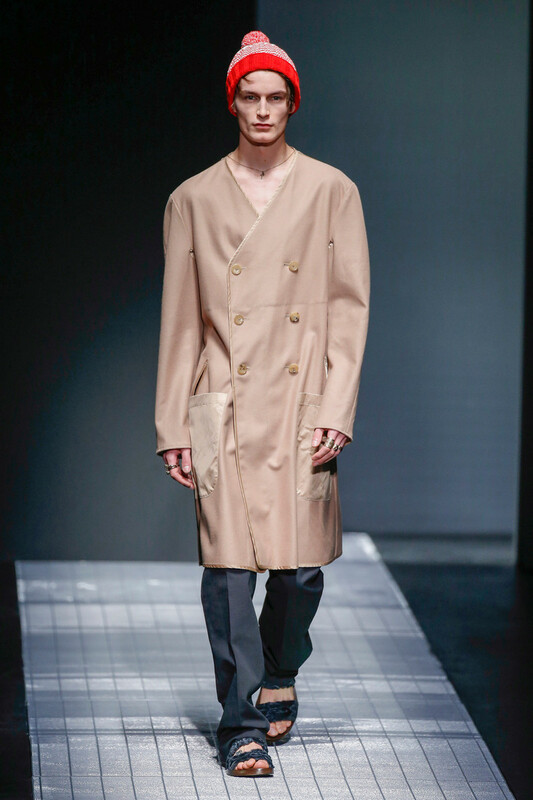 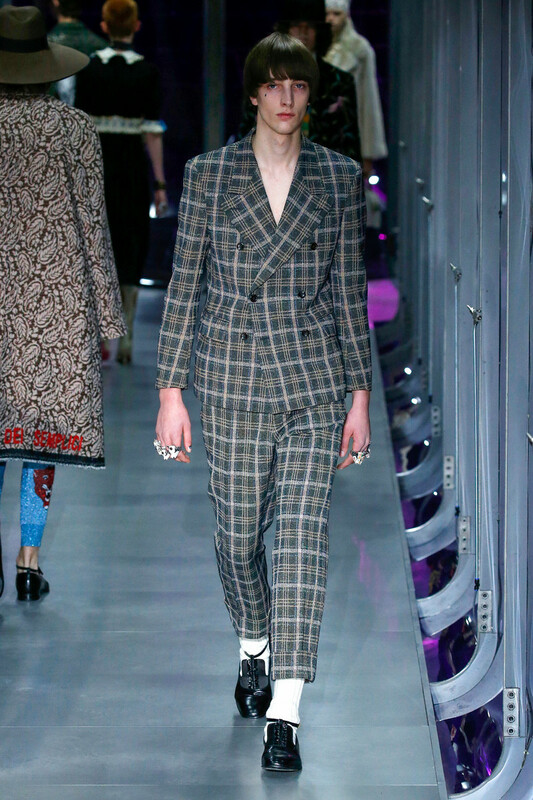 The tailoring for jackets and pants were lean and mannish. 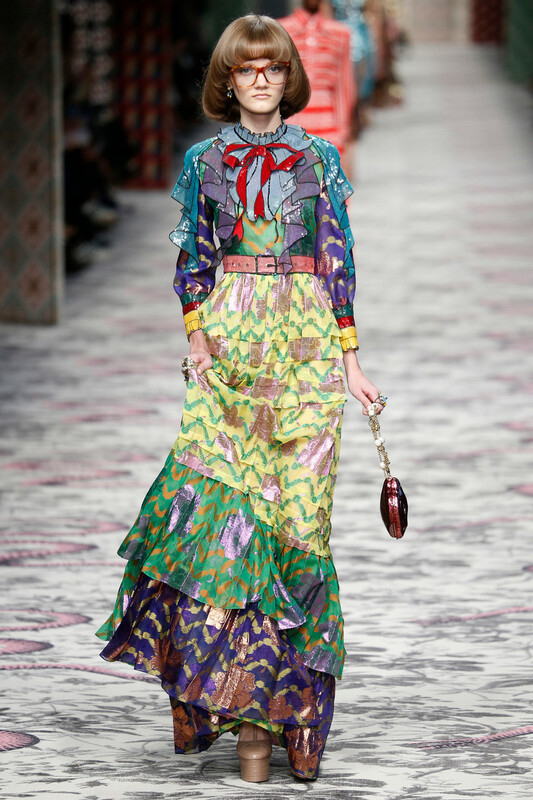 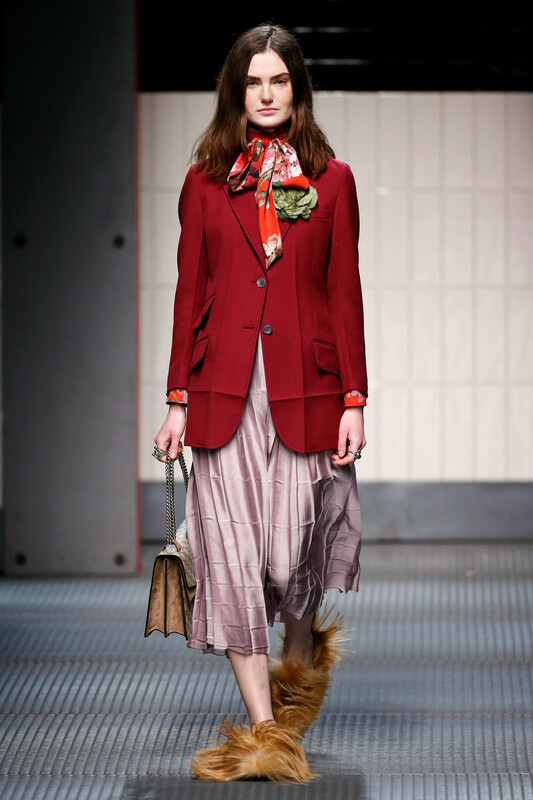 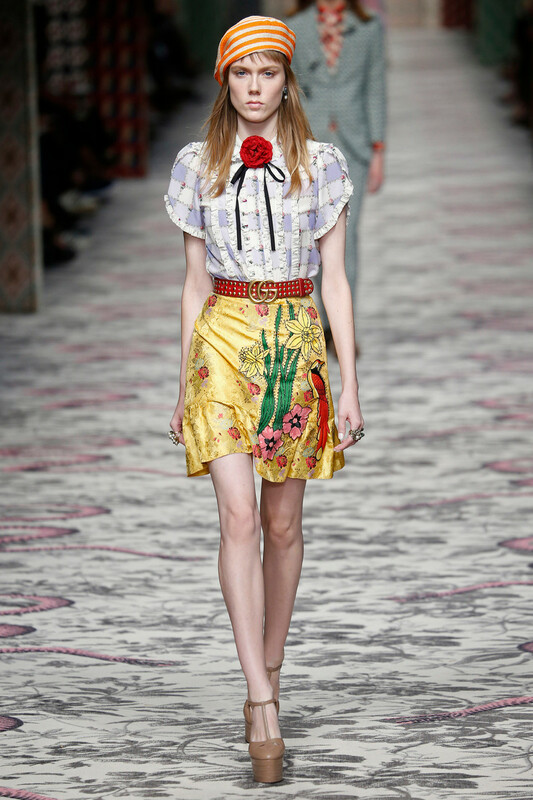 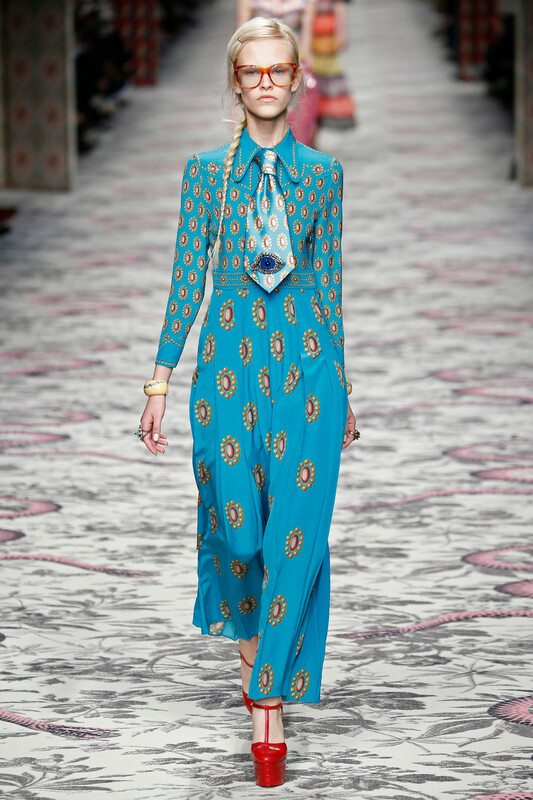 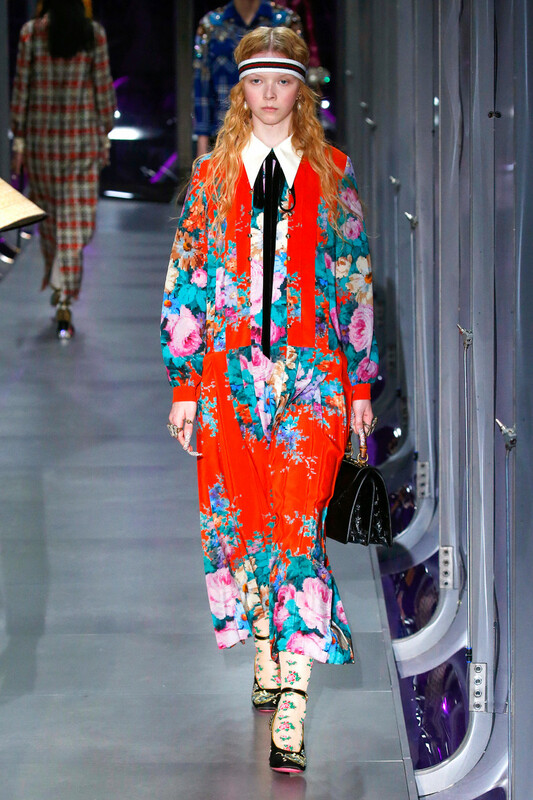 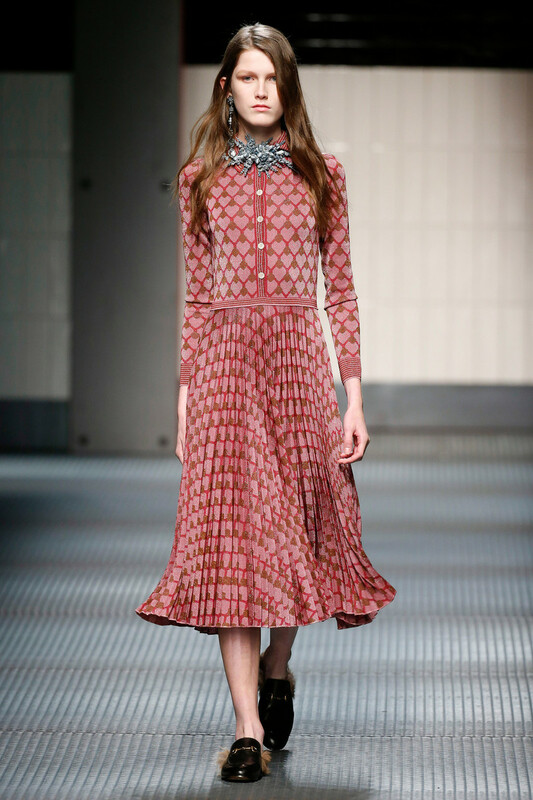 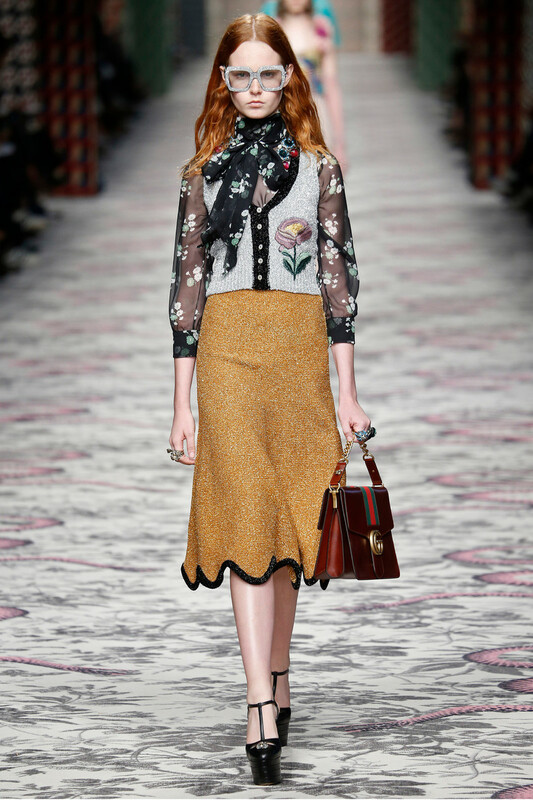 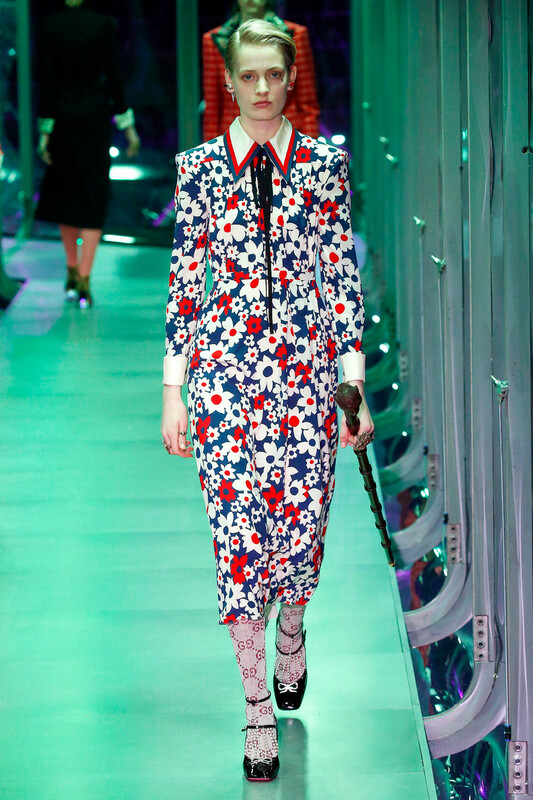 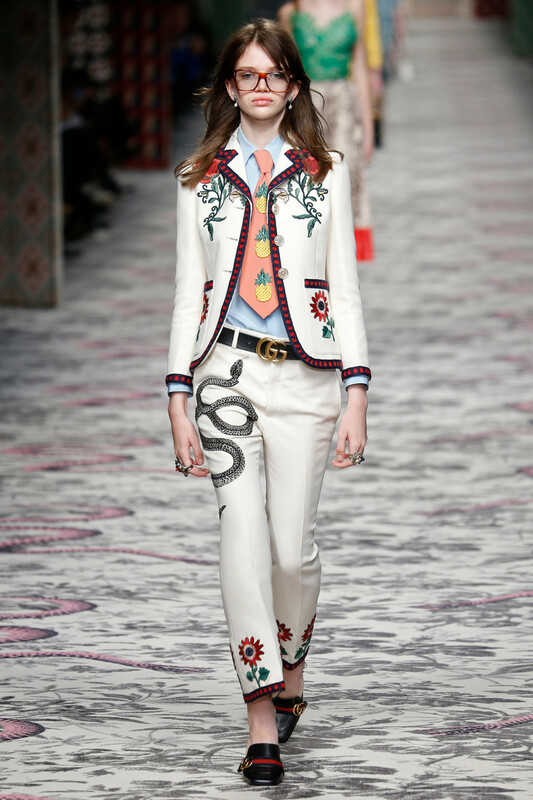 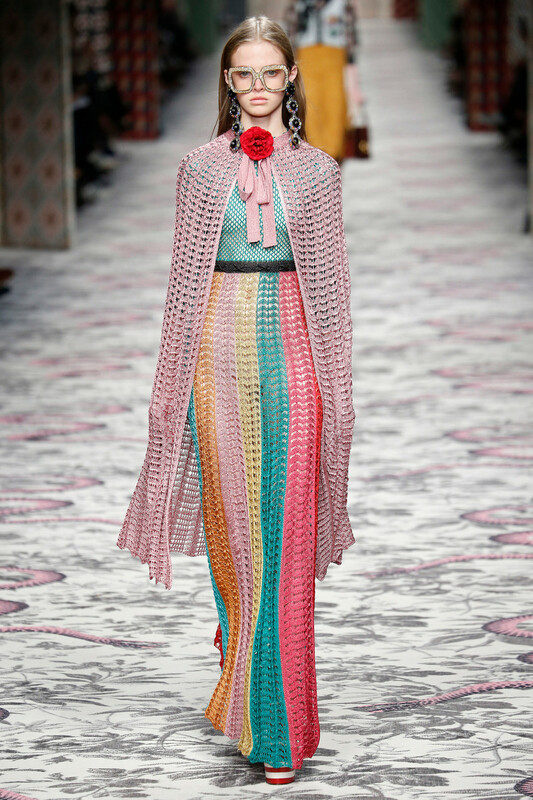 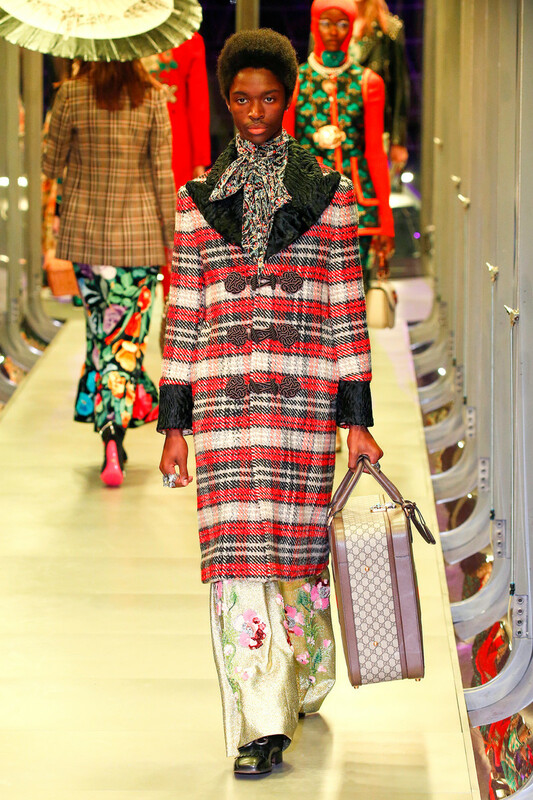 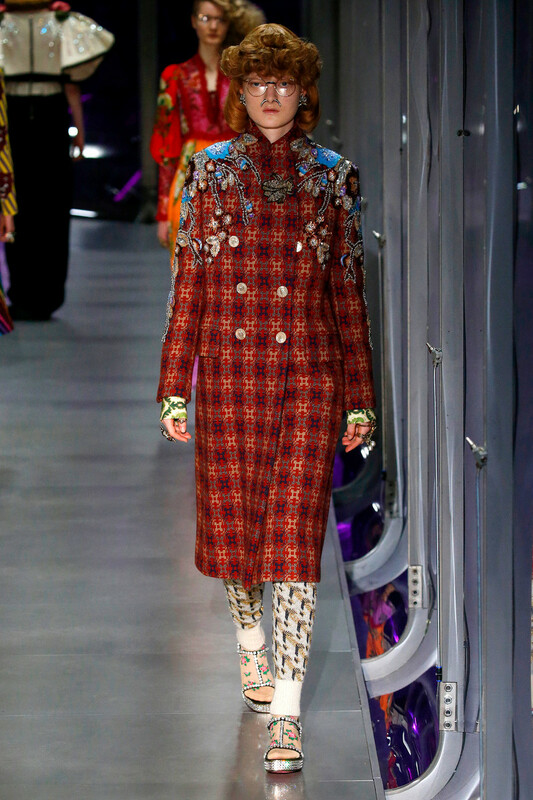 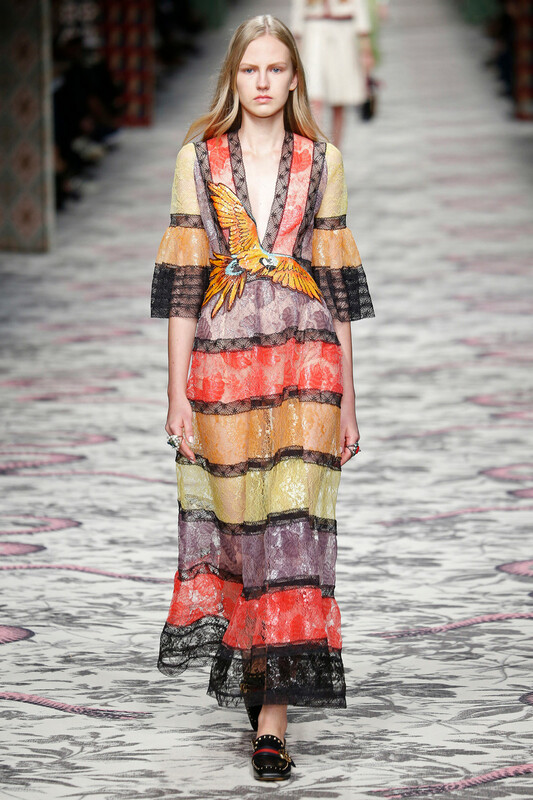 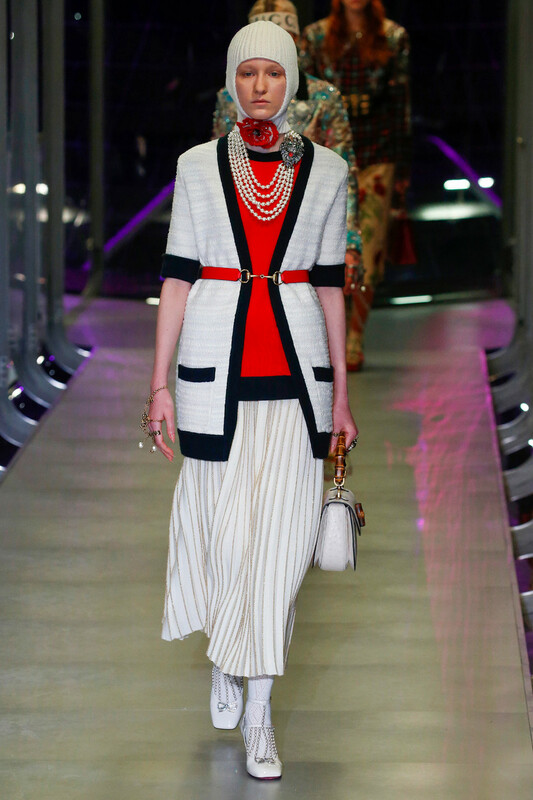 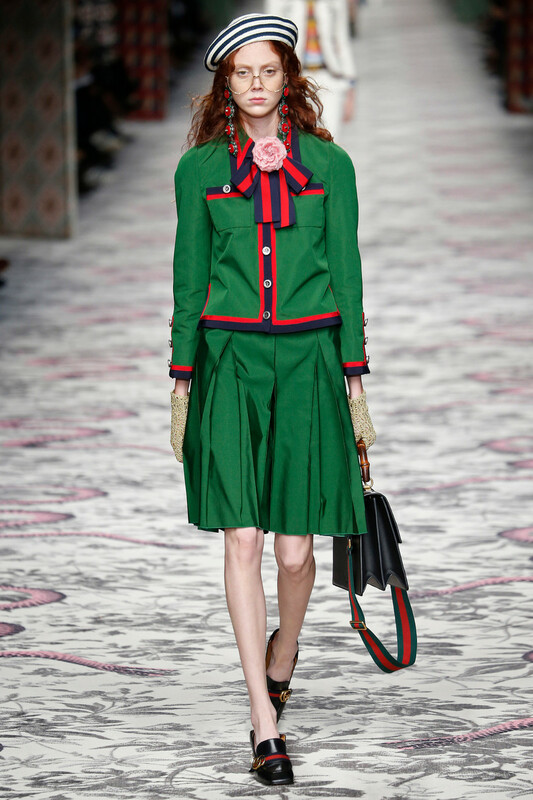 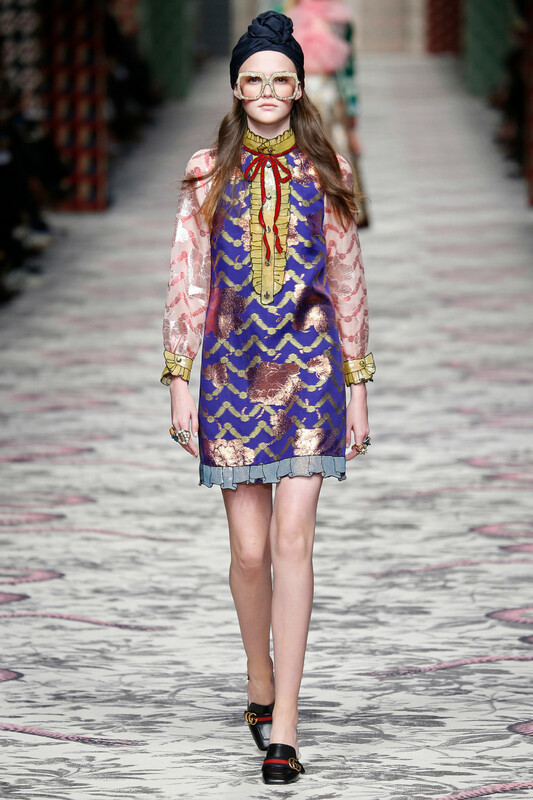 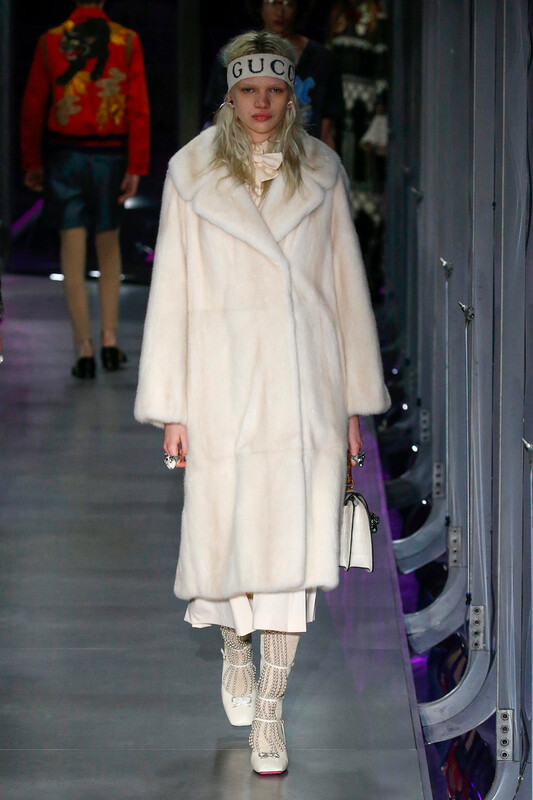 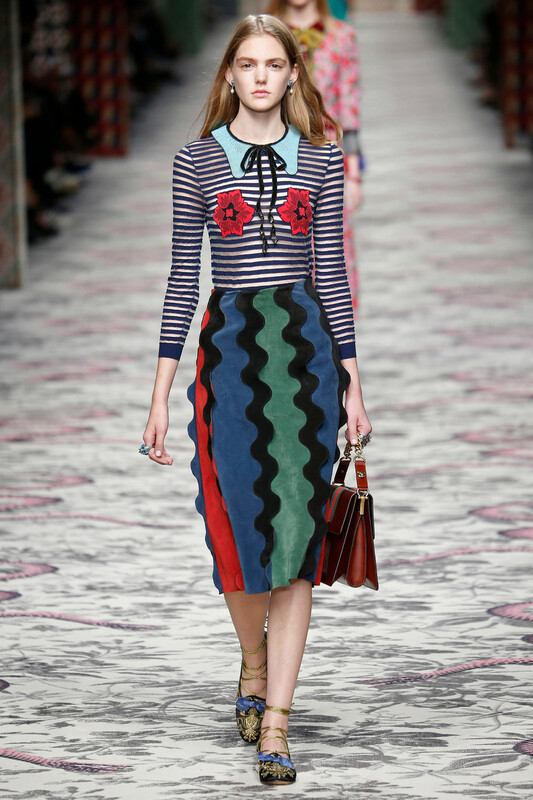 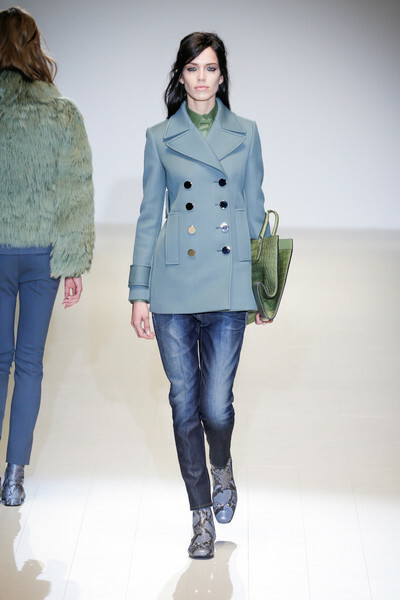 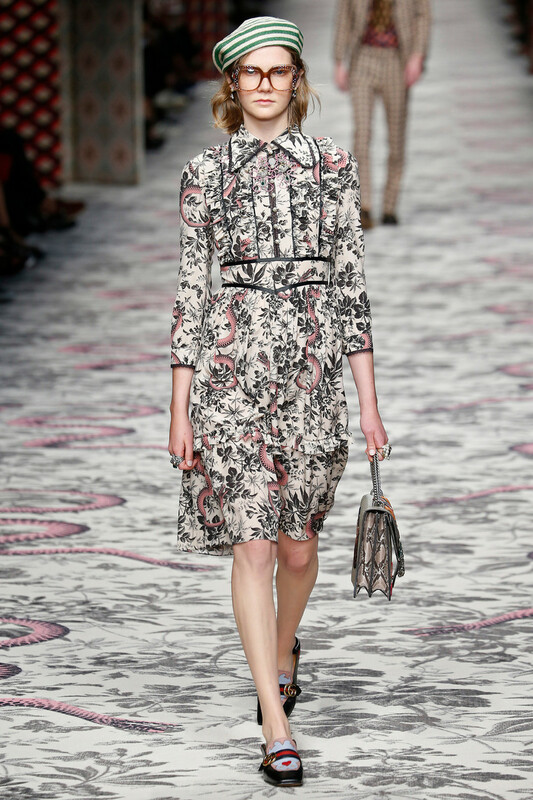 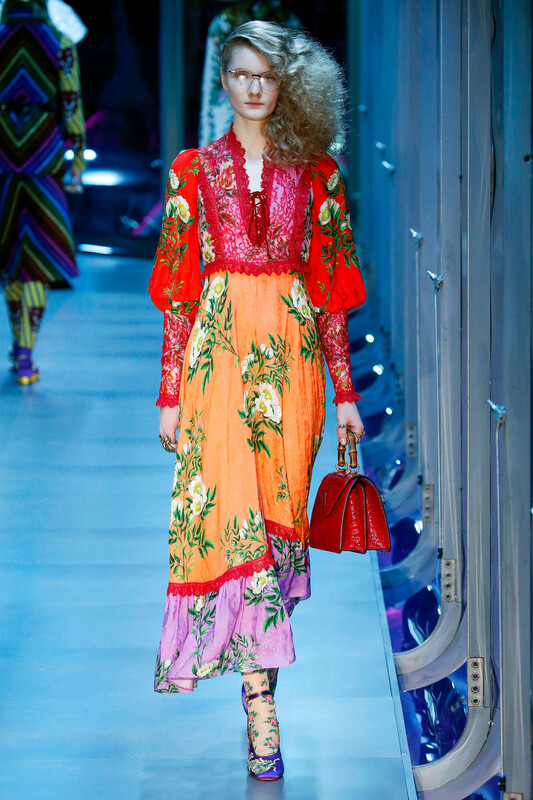 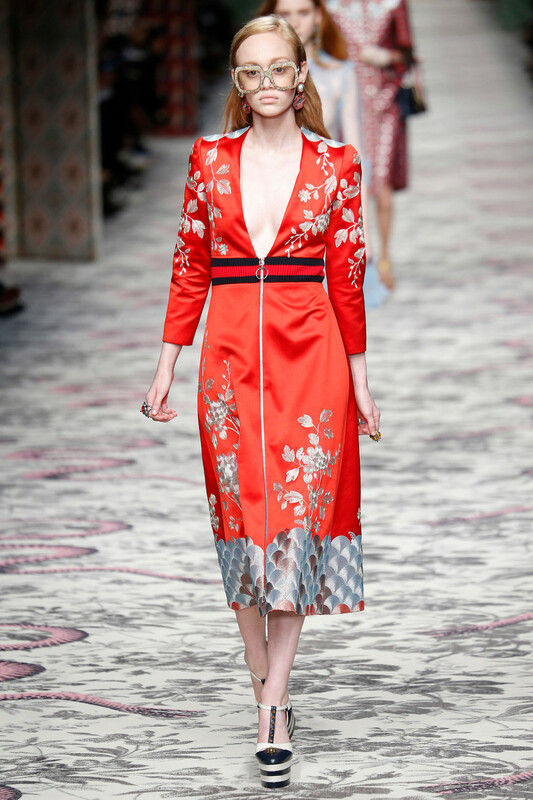 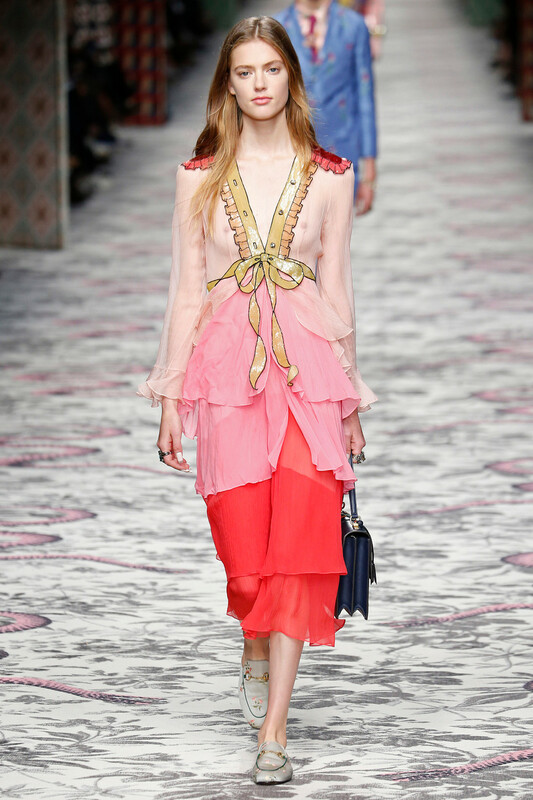 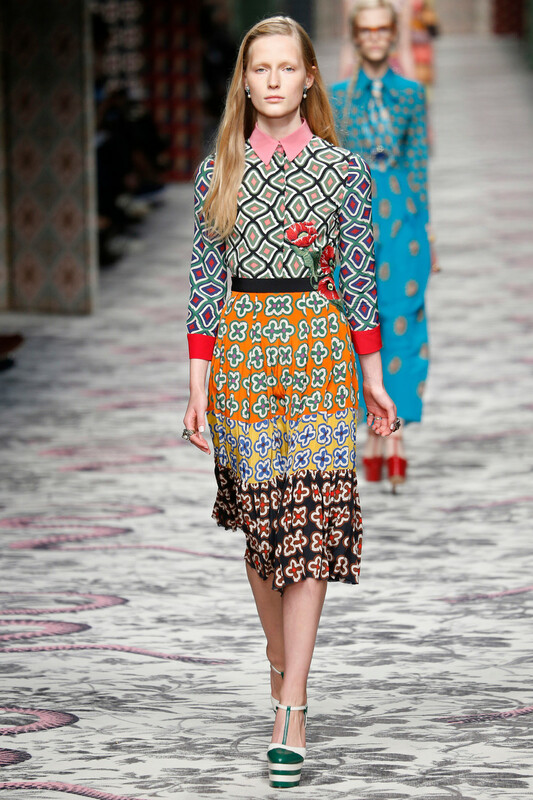 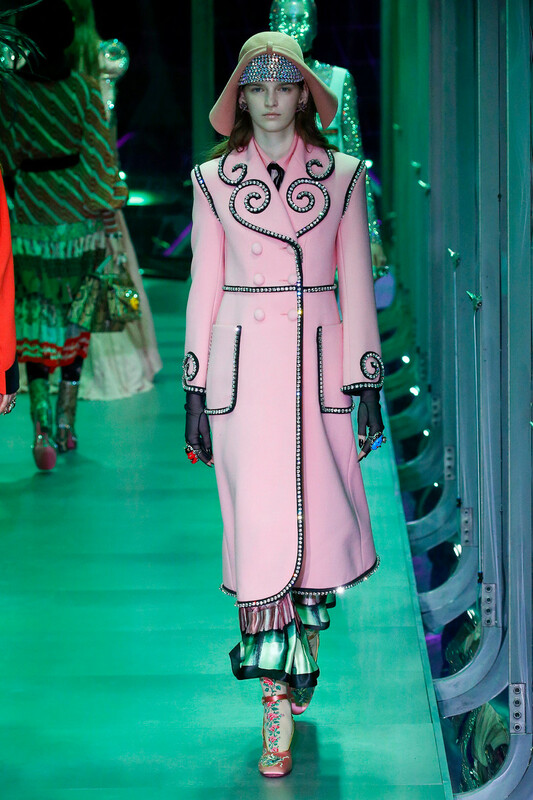 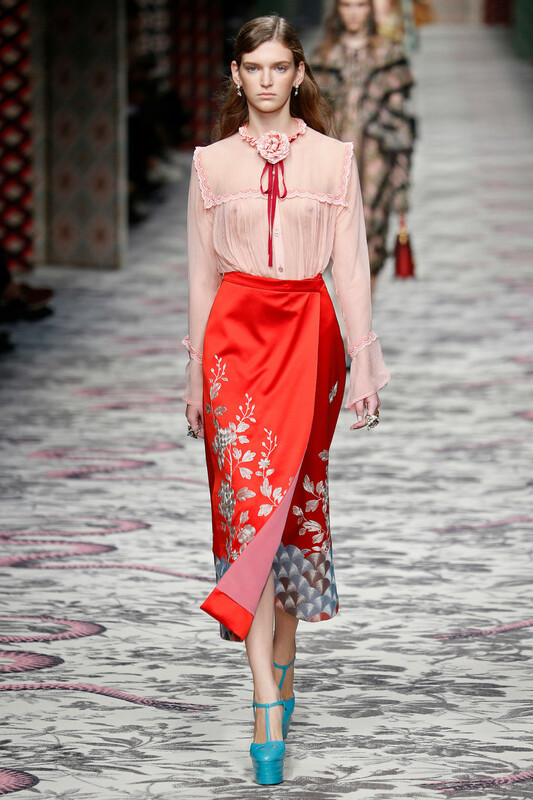 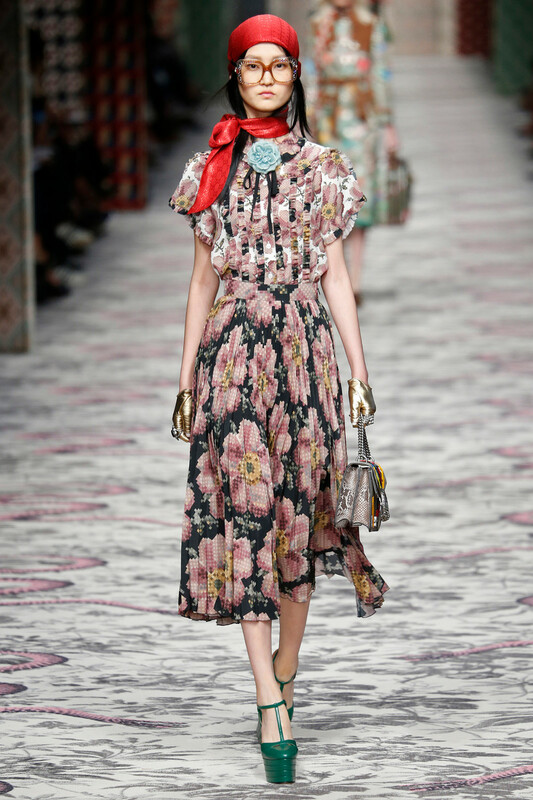 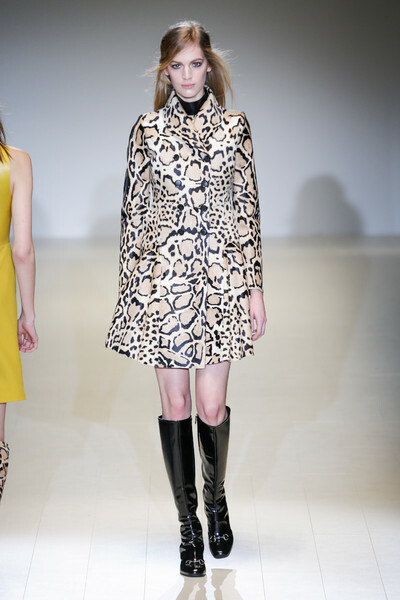 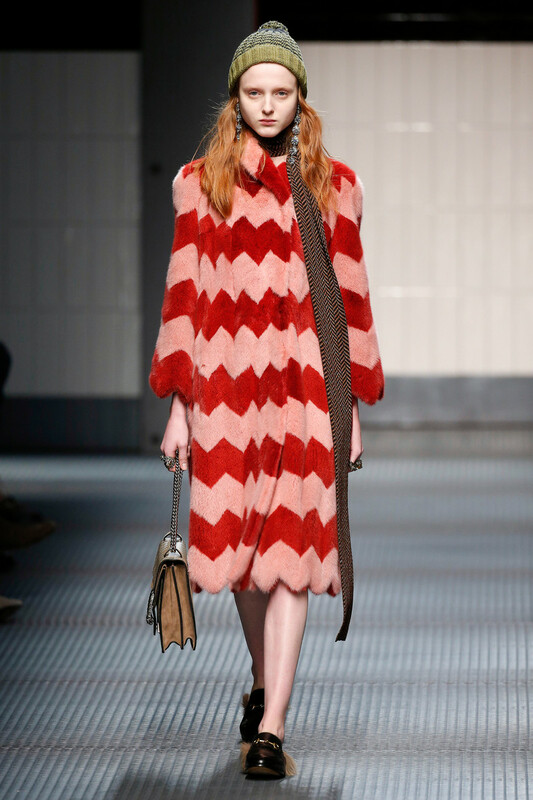 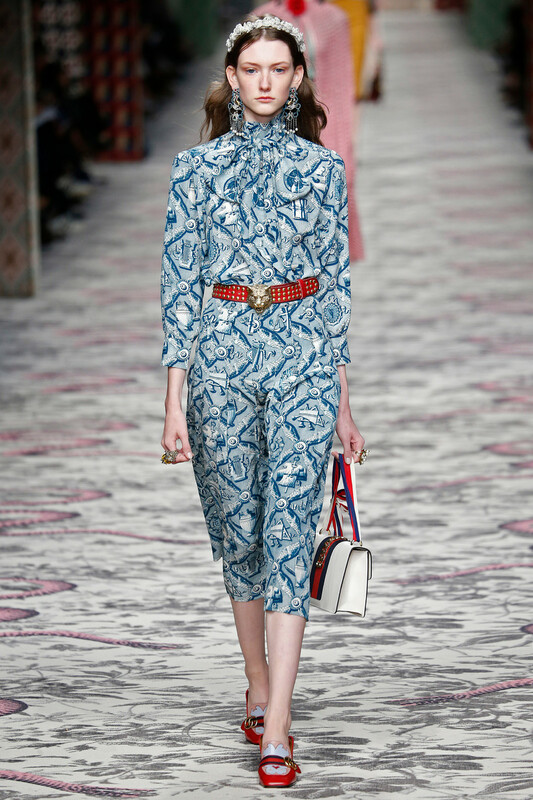 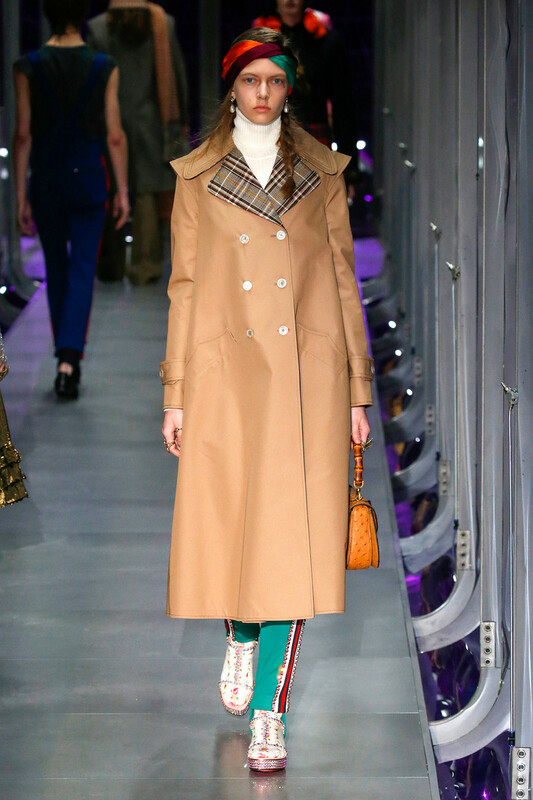 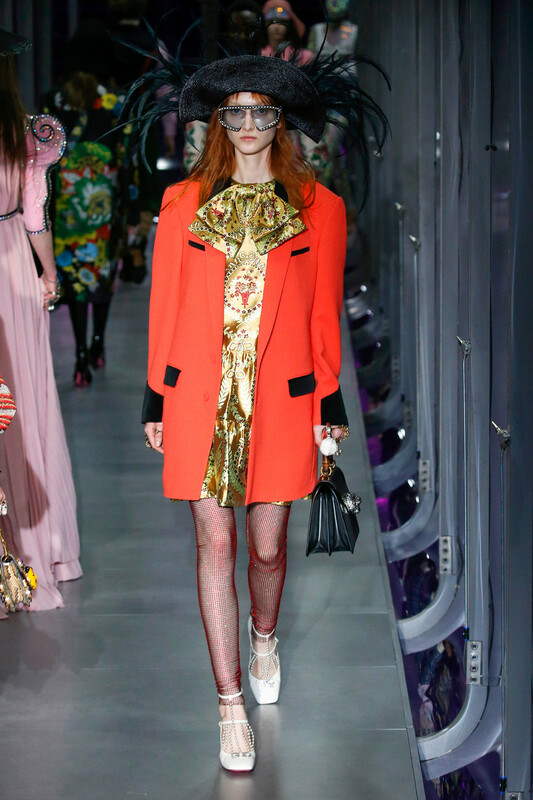 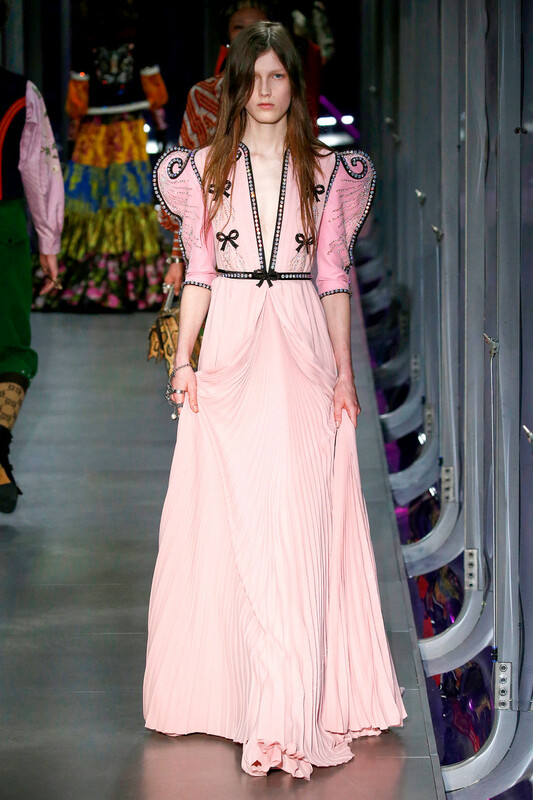 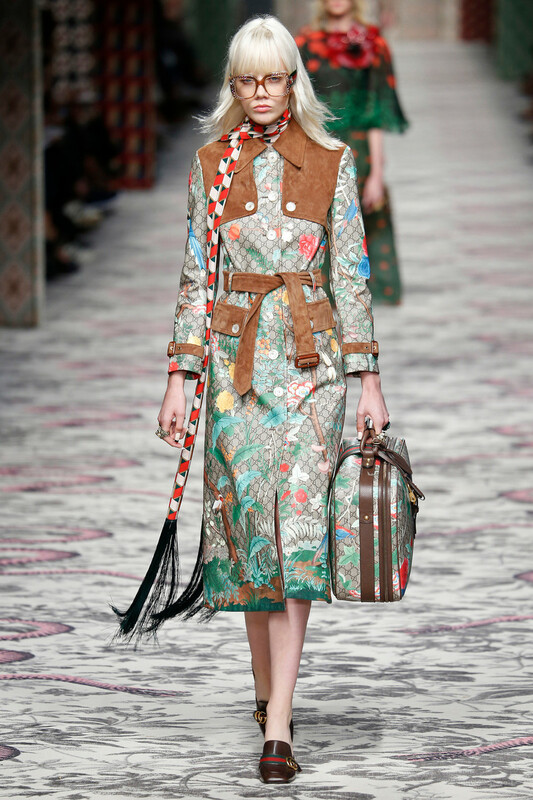 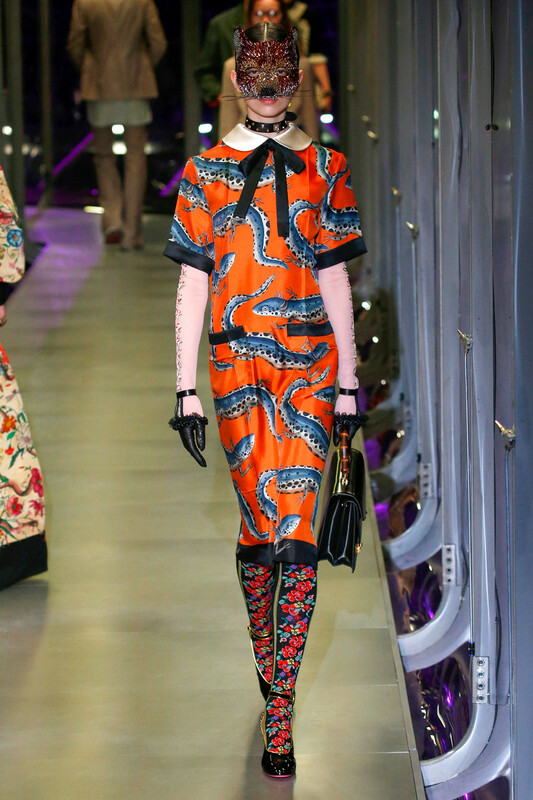 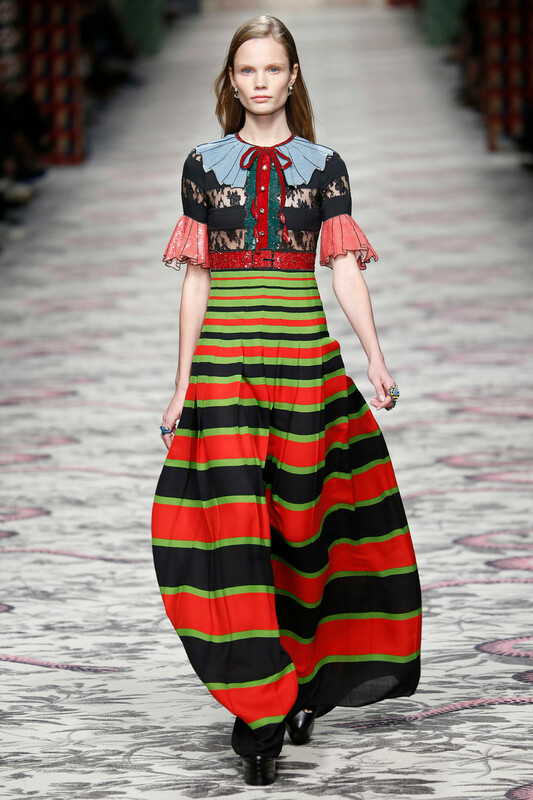 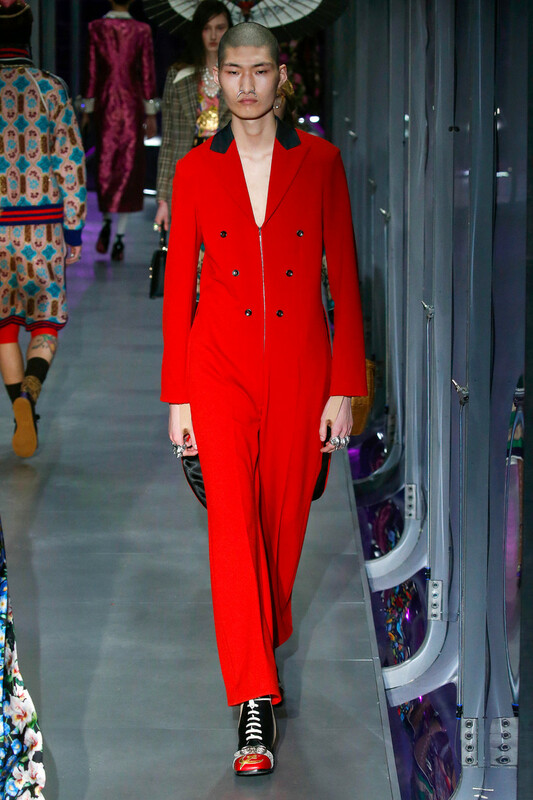 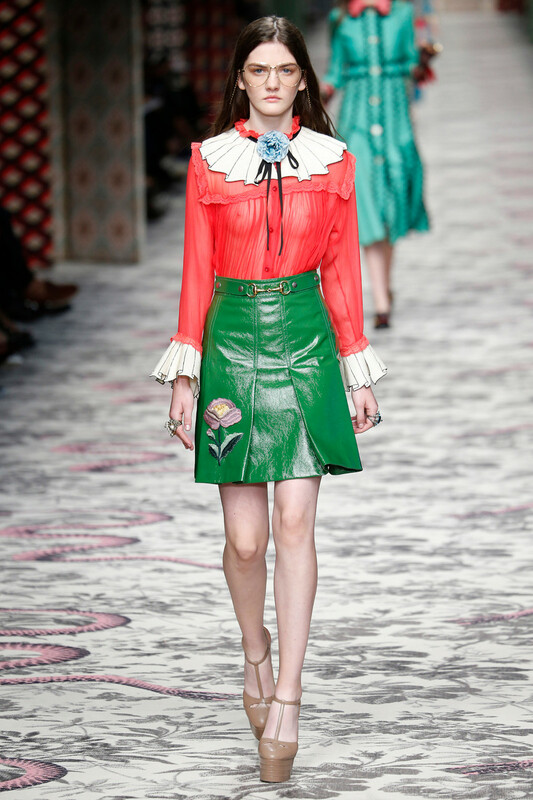 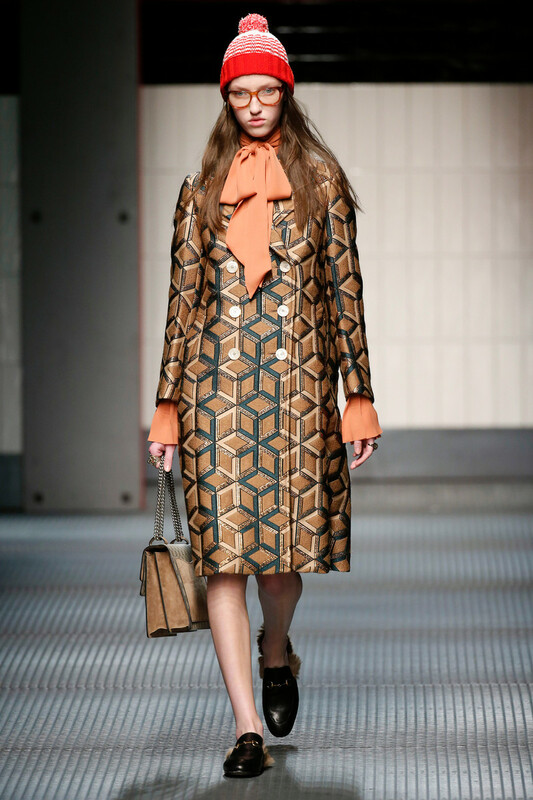 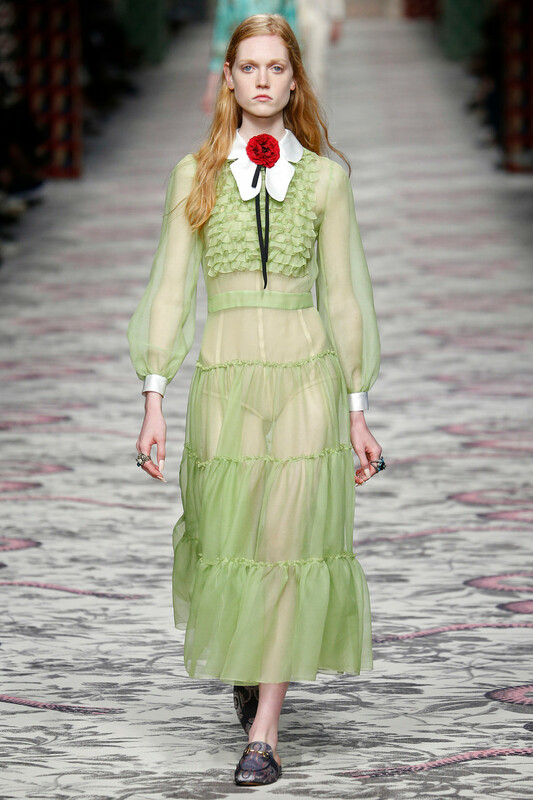 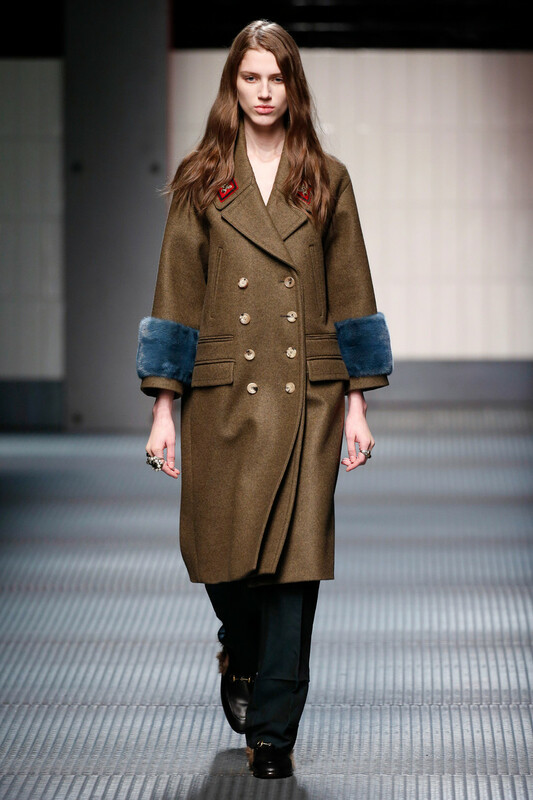 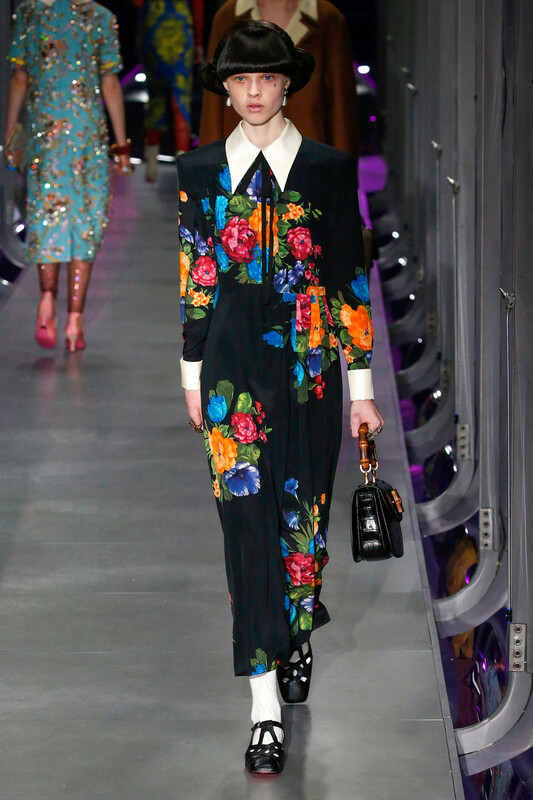 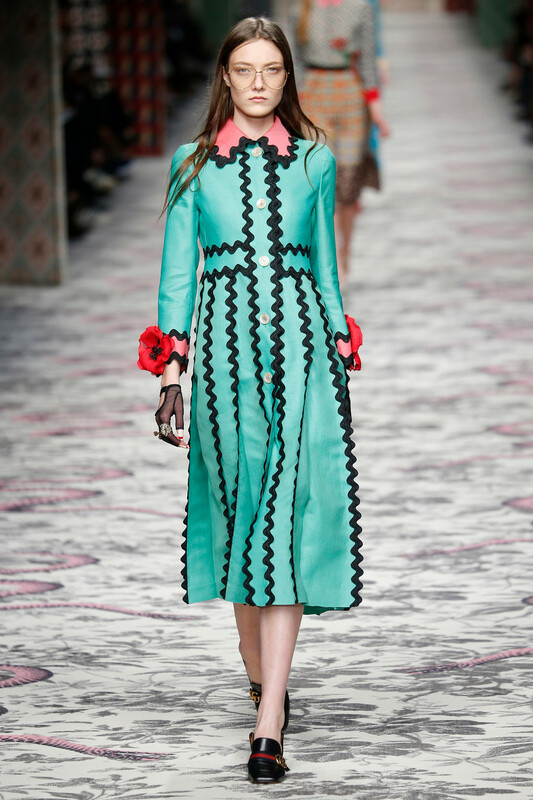 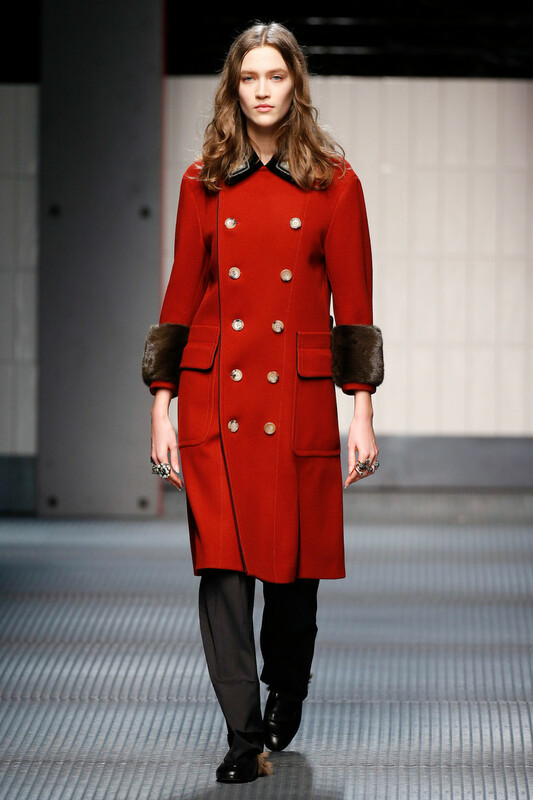 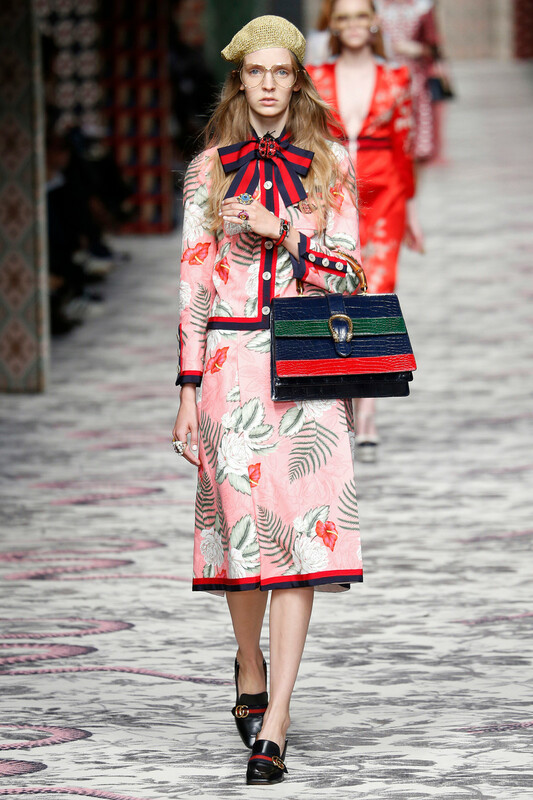 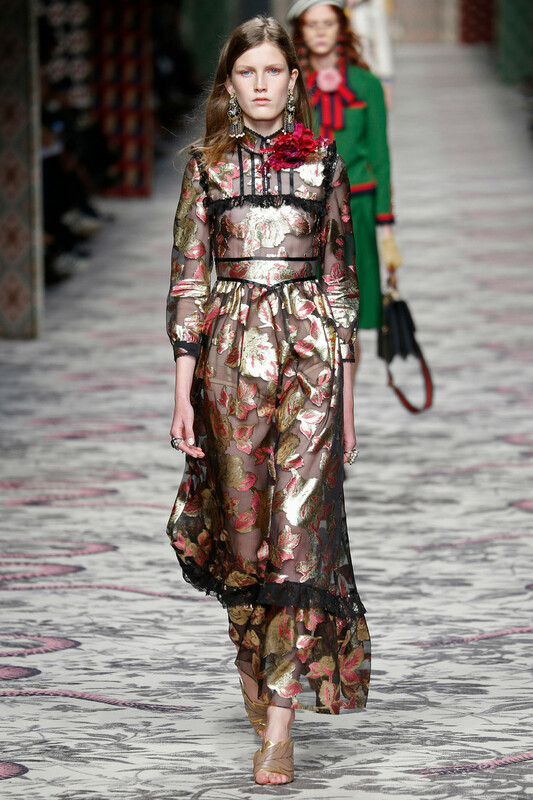 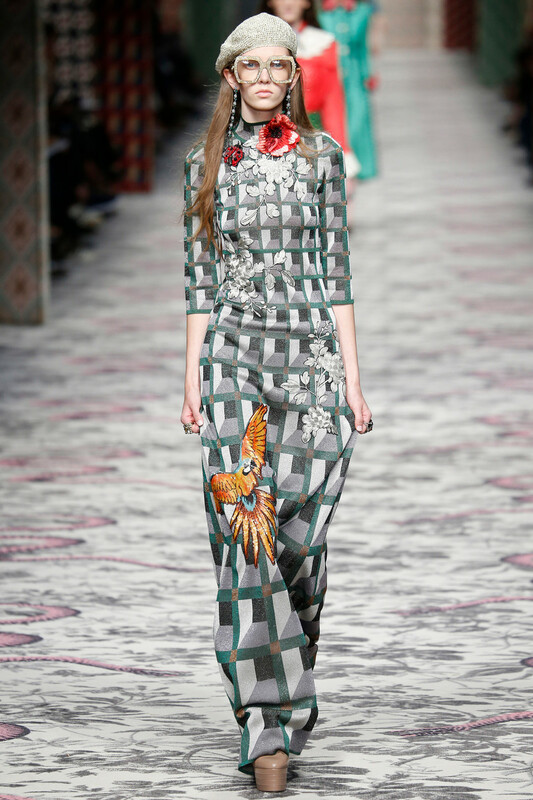 Dresses and belted coats retained the clean shapes while expressing the more feminine side of the Gucci range. 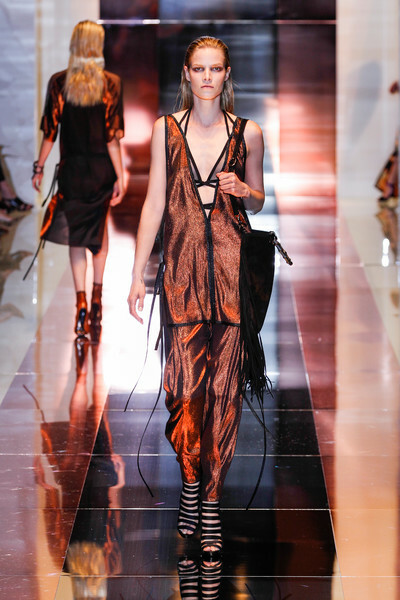 For evening Giannini offered a series of short, structured dresses including several in leather their bodices decorated with bold encrustations of crystals. 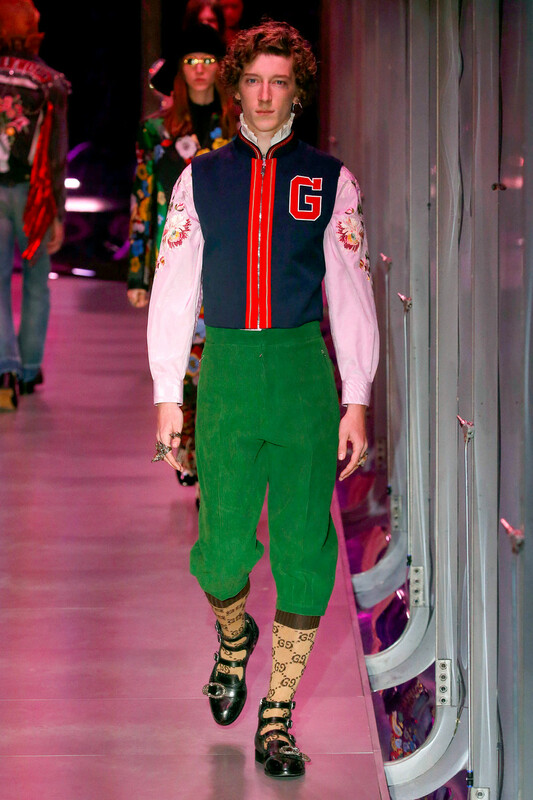 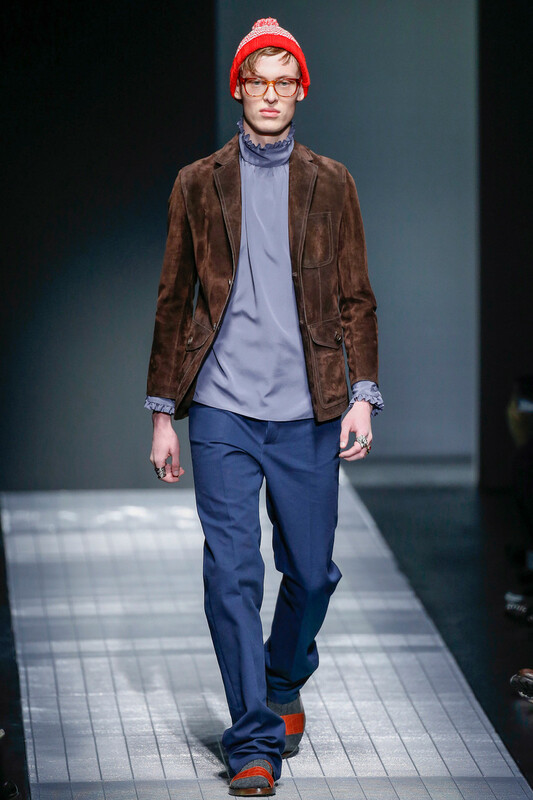 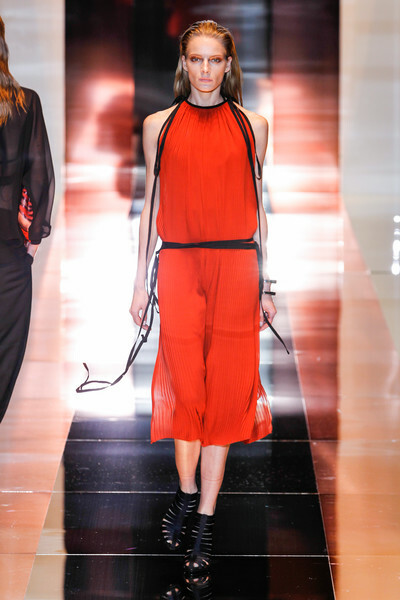 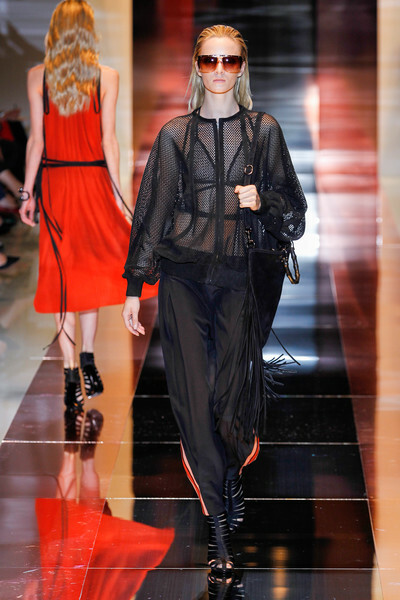 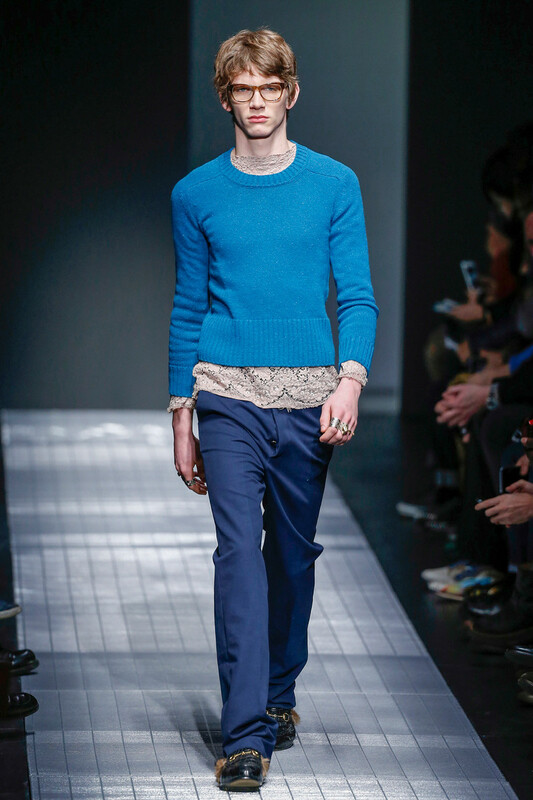 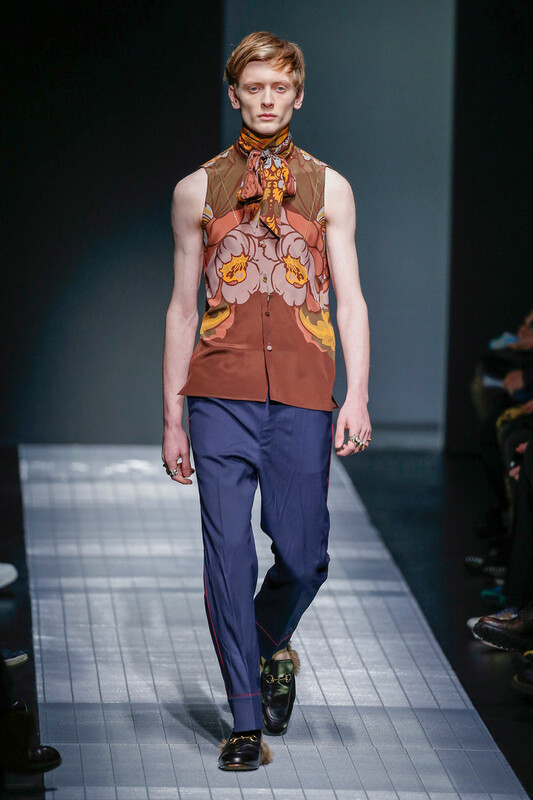 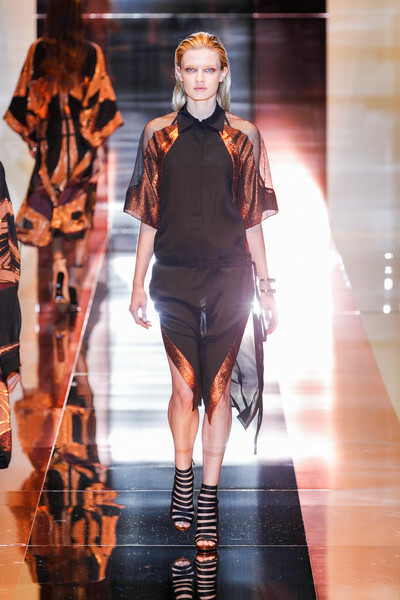 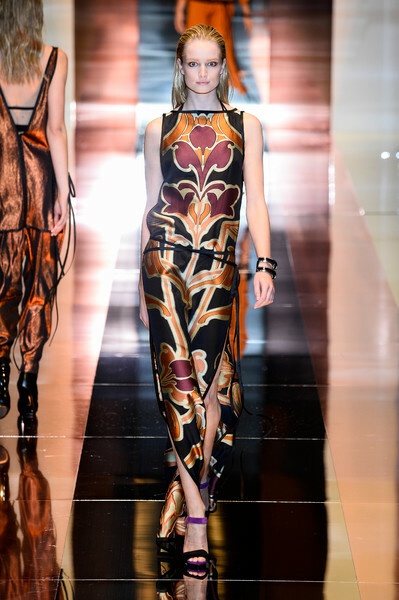 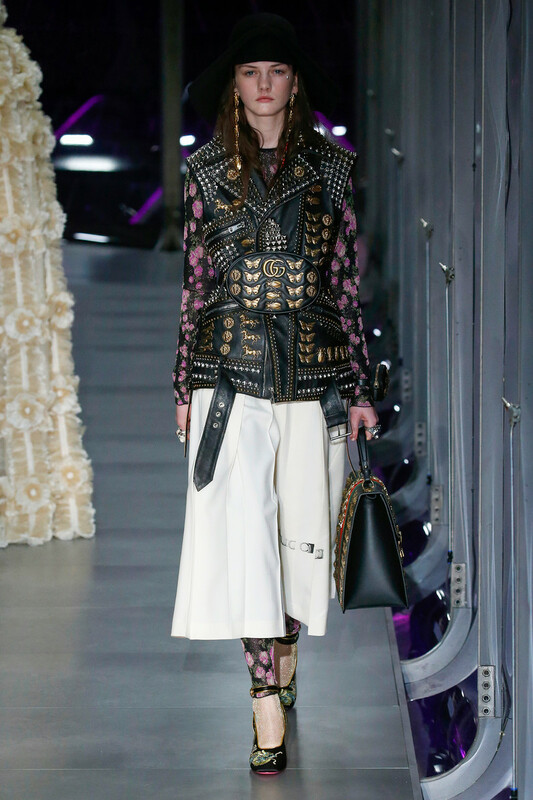 The Gucci-collection that Frida Giannini sent out yesterday had a techno-athletic vibe. 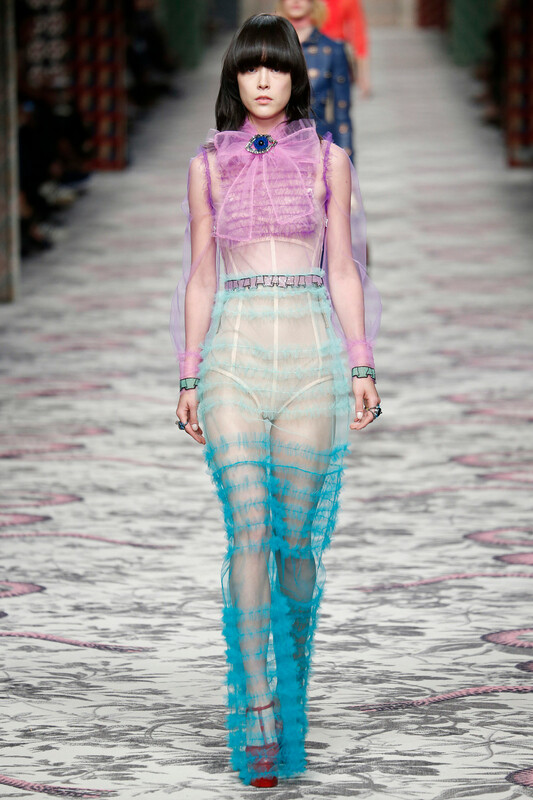 This led to lots of mesh exposing lots of skin, basketball-shorts, track-pants and triangle bras. 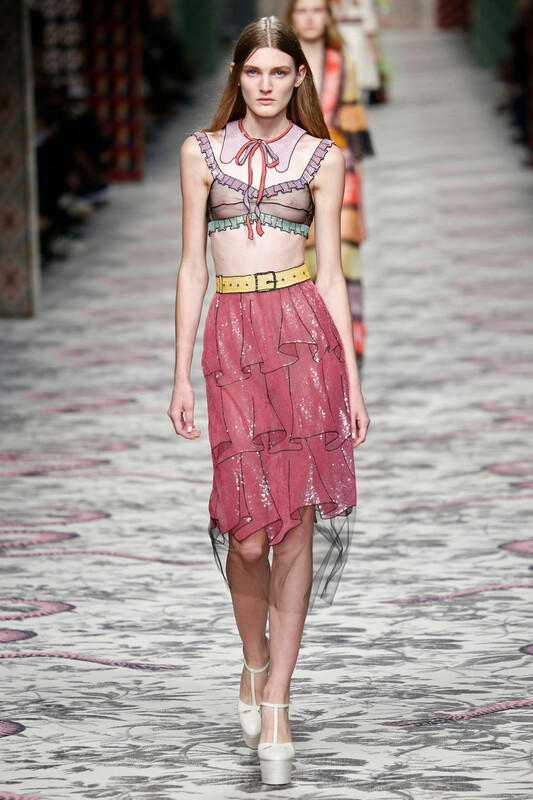 There were T-shirt and bra combos, insets defining shoulders and sides of a dress. 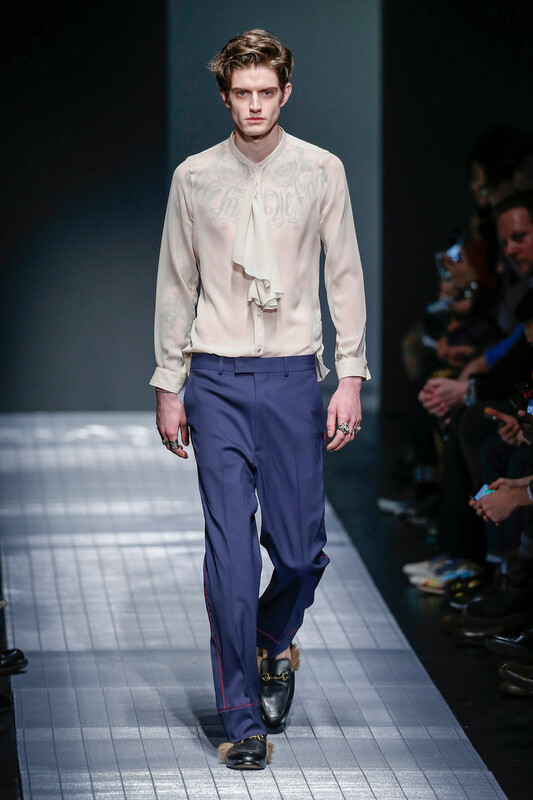 The shape was rather languid and viagra with no prescription decorations inspired by Art Nouveau. 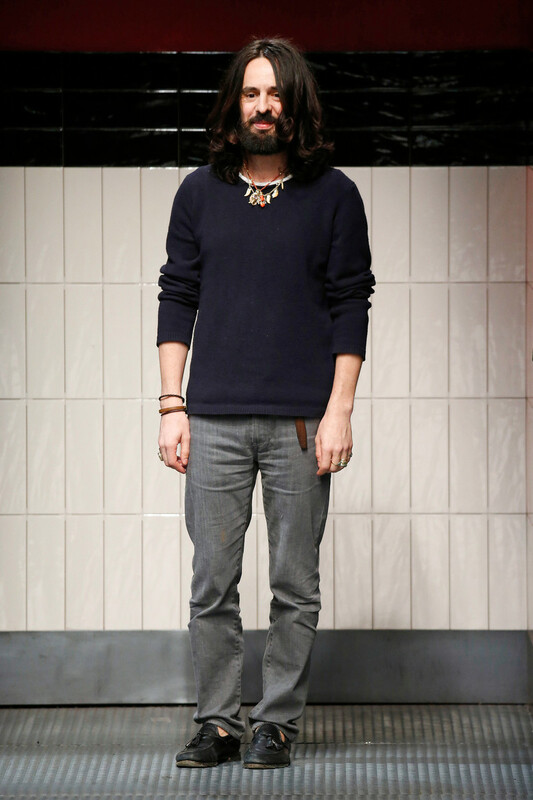 The show had a cool attitude and it translated what’s happening on the streets. 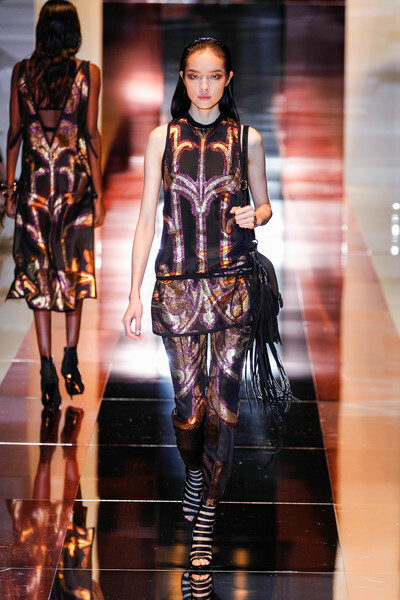 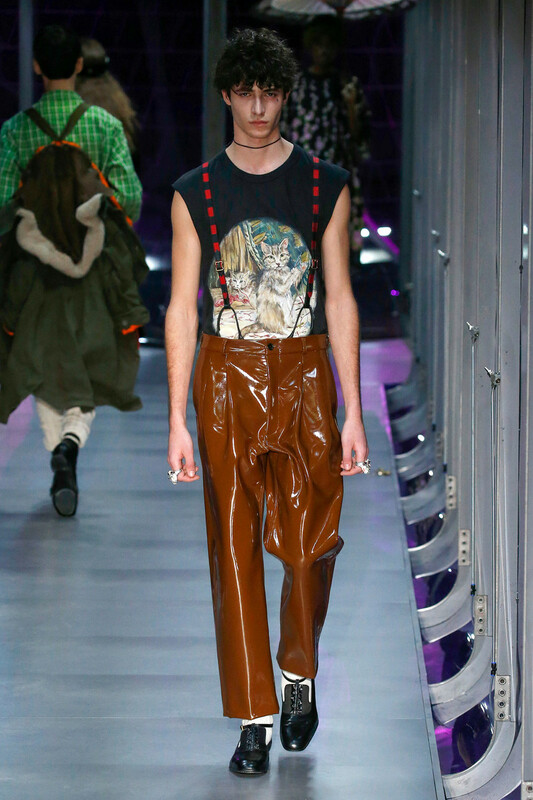 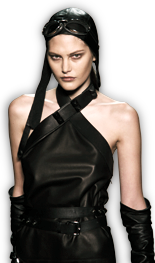 But it was still luxurious: mesh was laser-cut suede, a T-shirt was made of tooled leather.